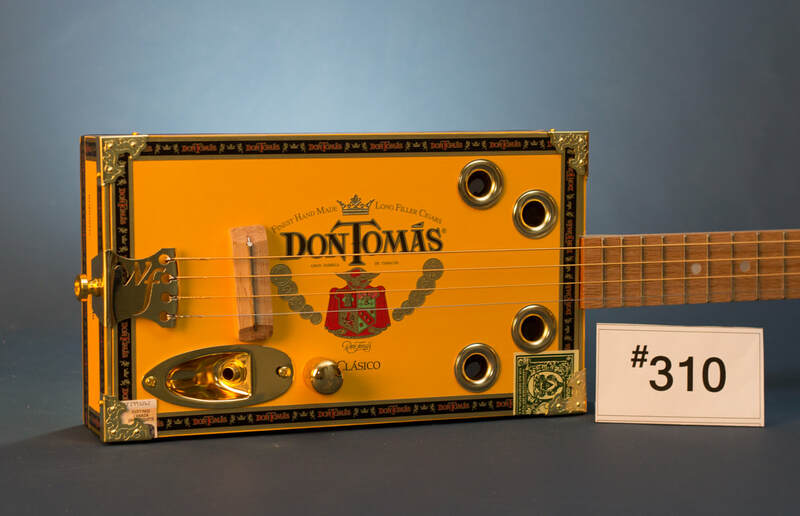 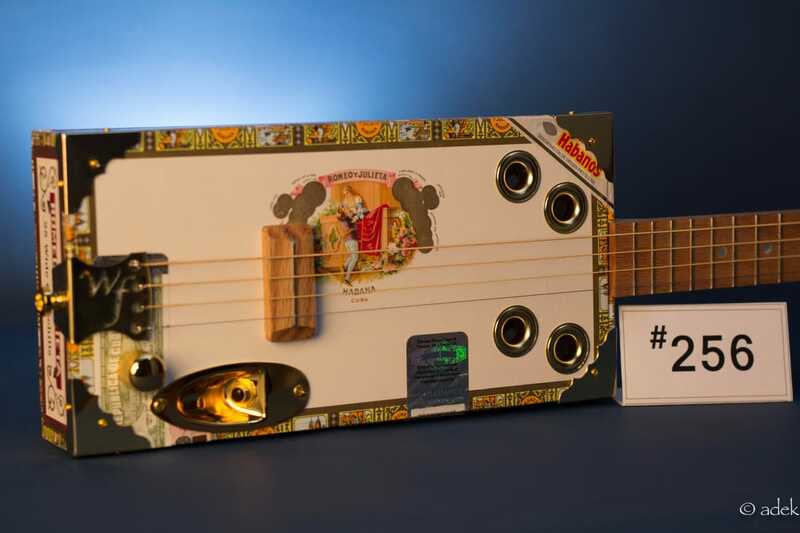 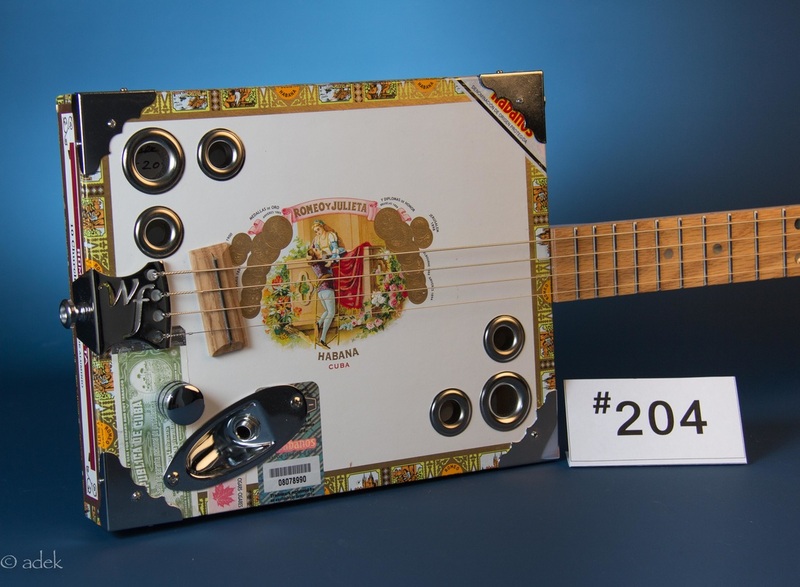 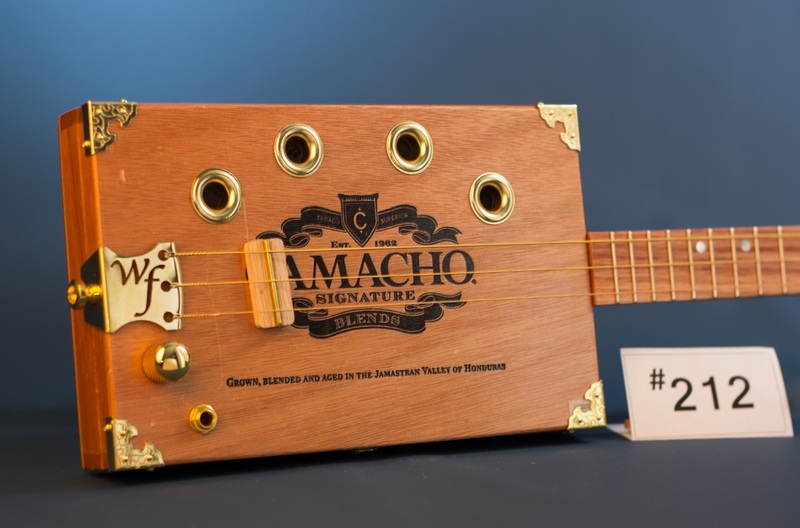 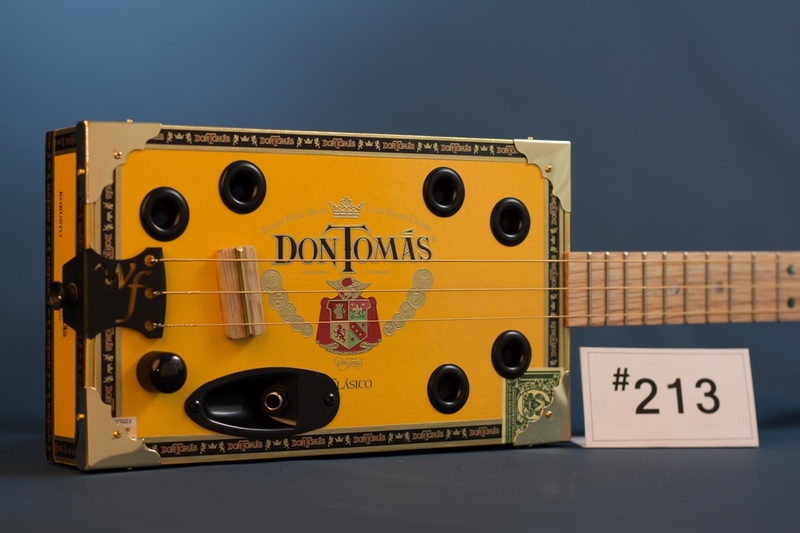 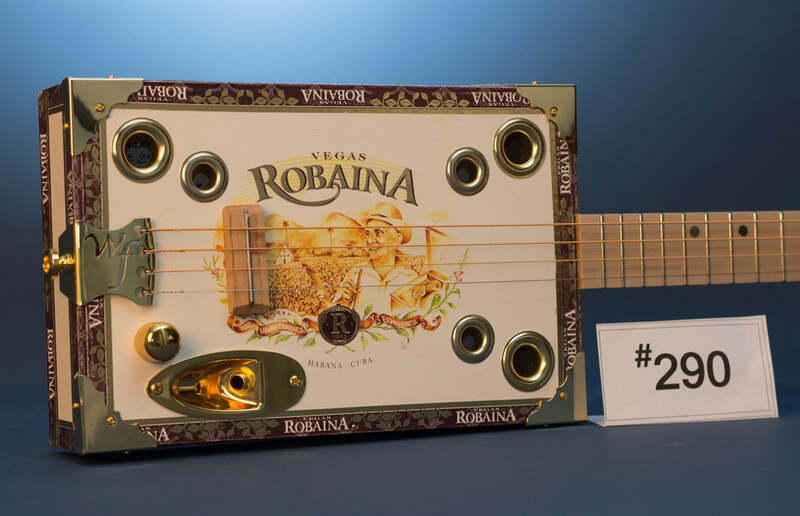 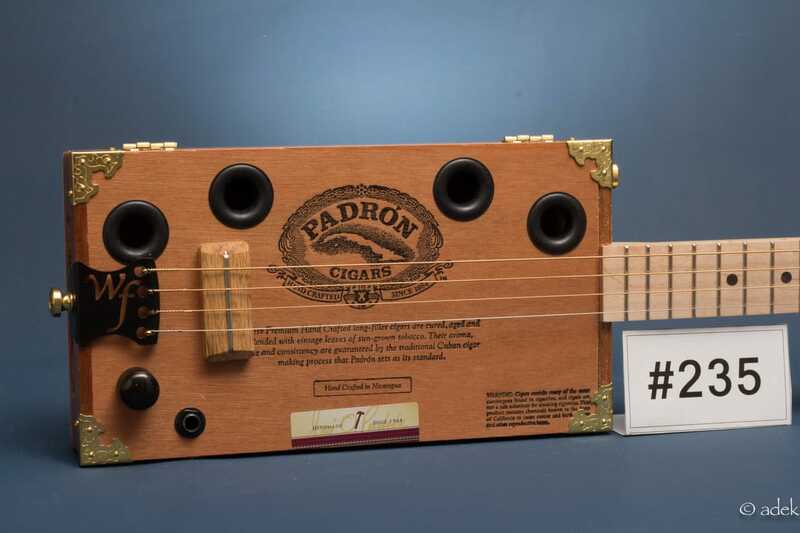 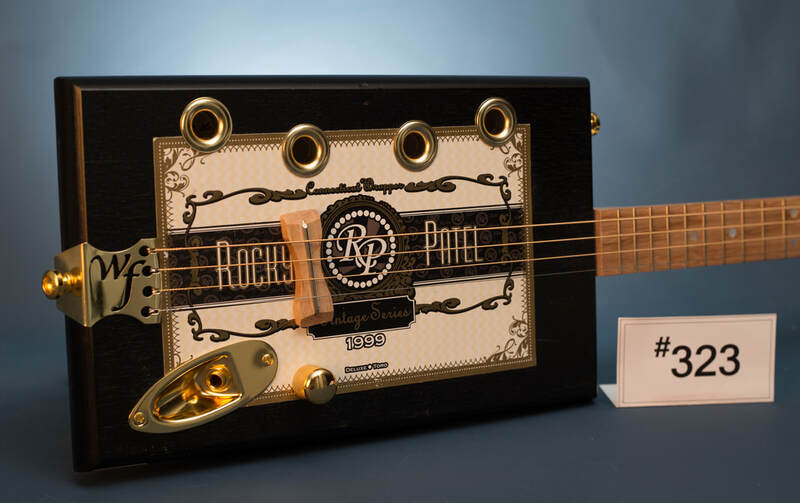 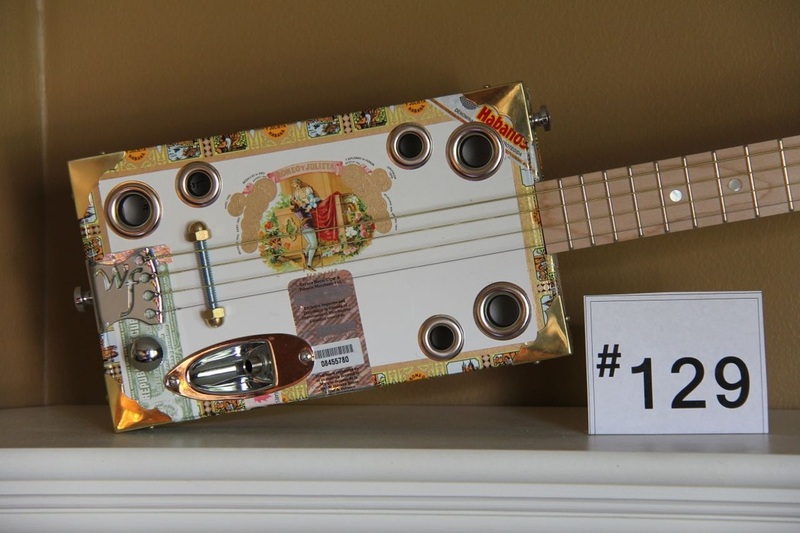 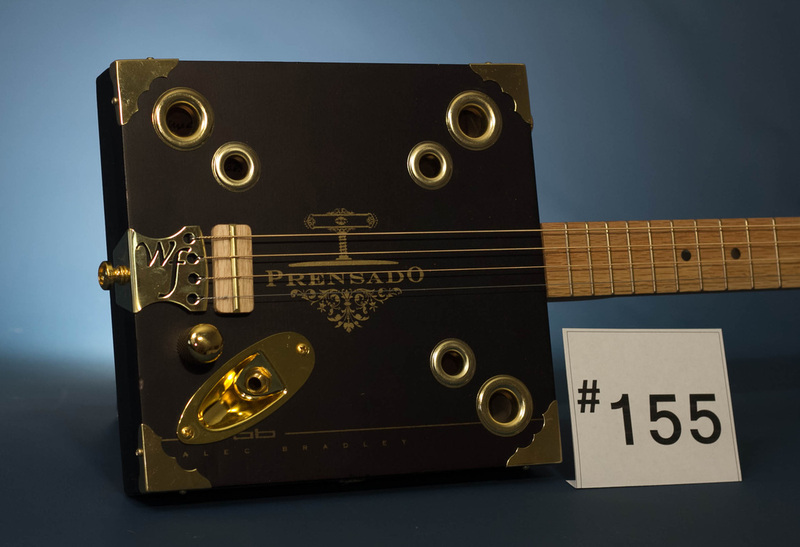 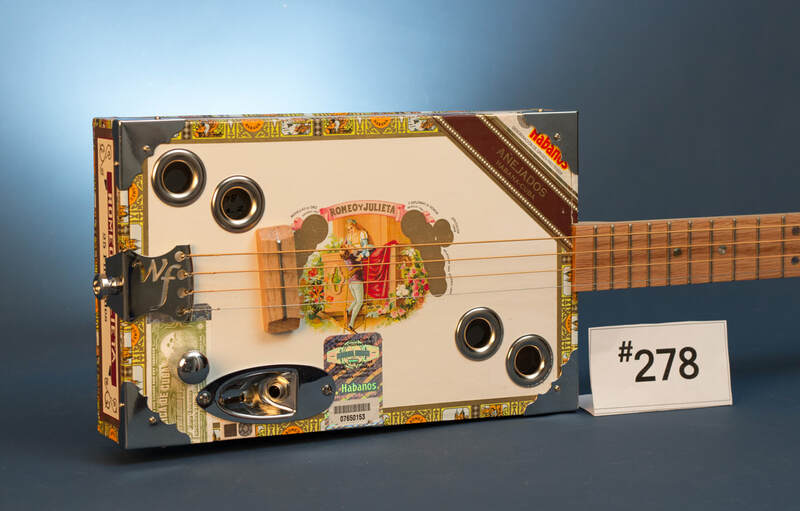 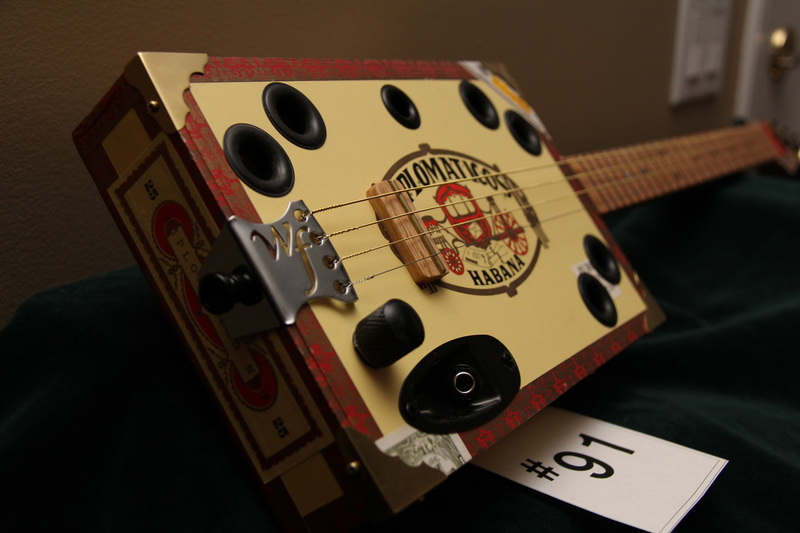 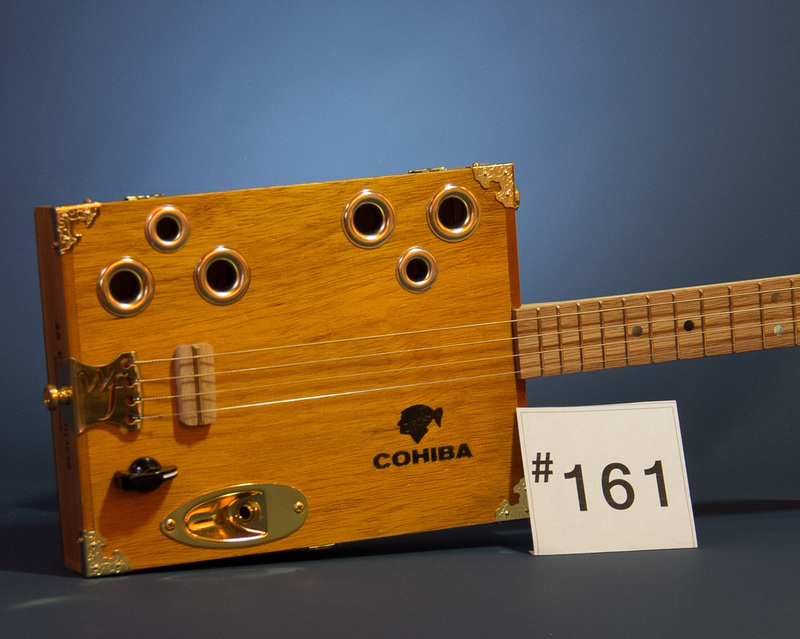 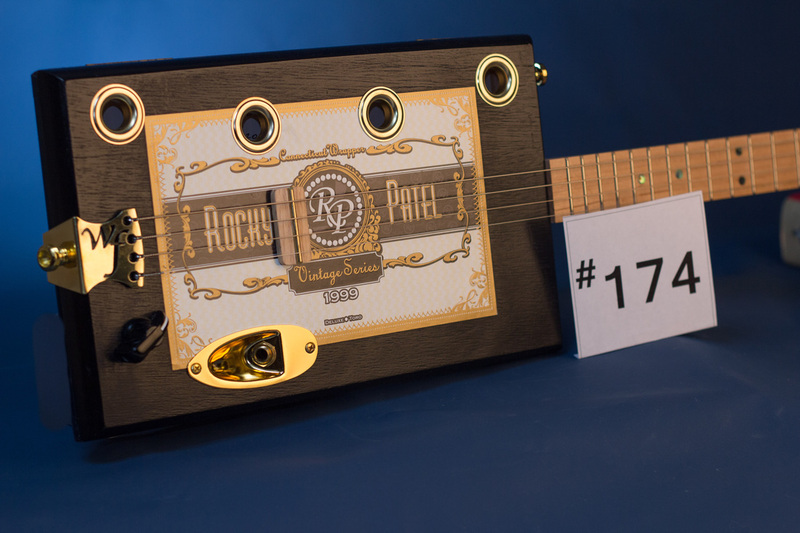 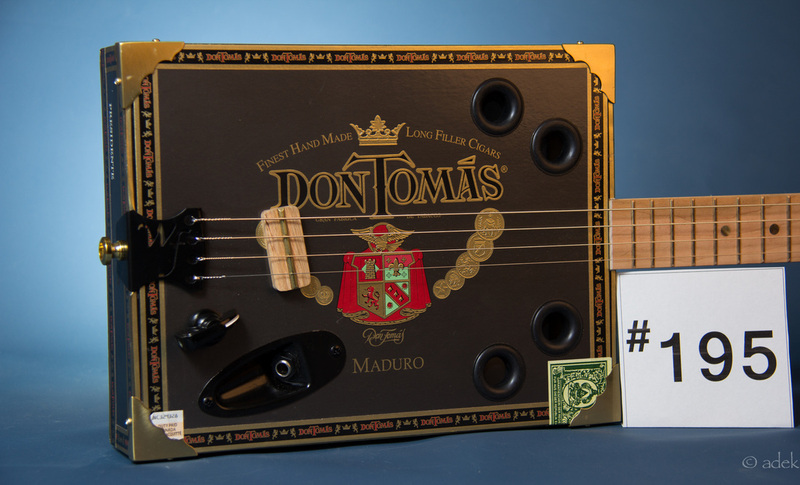 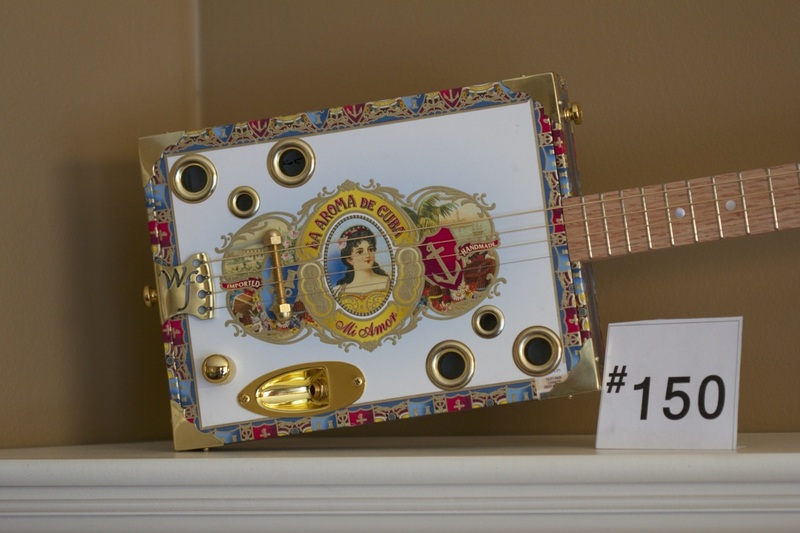 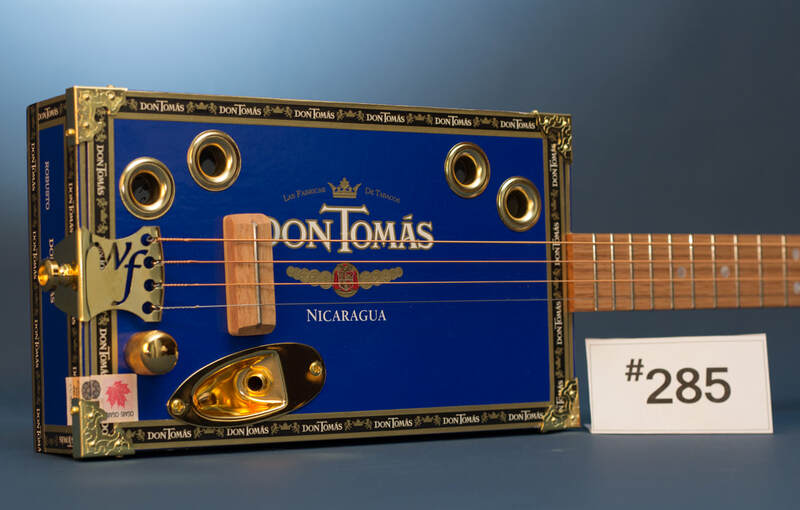 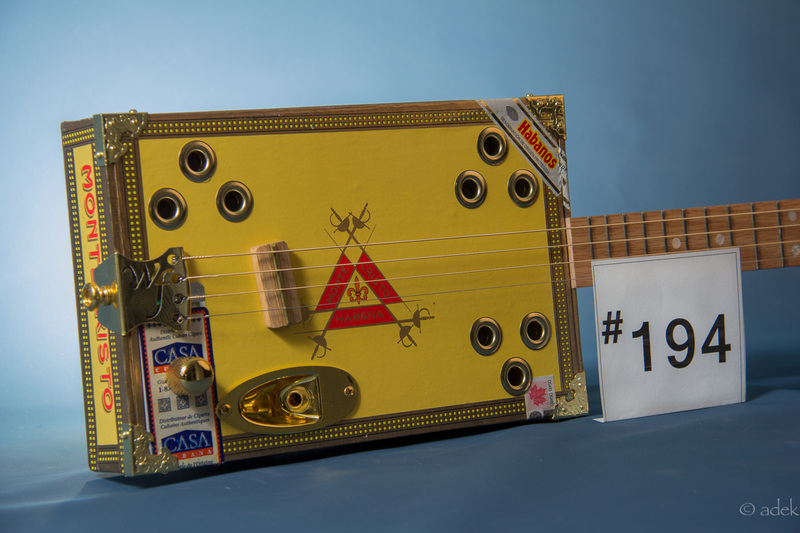 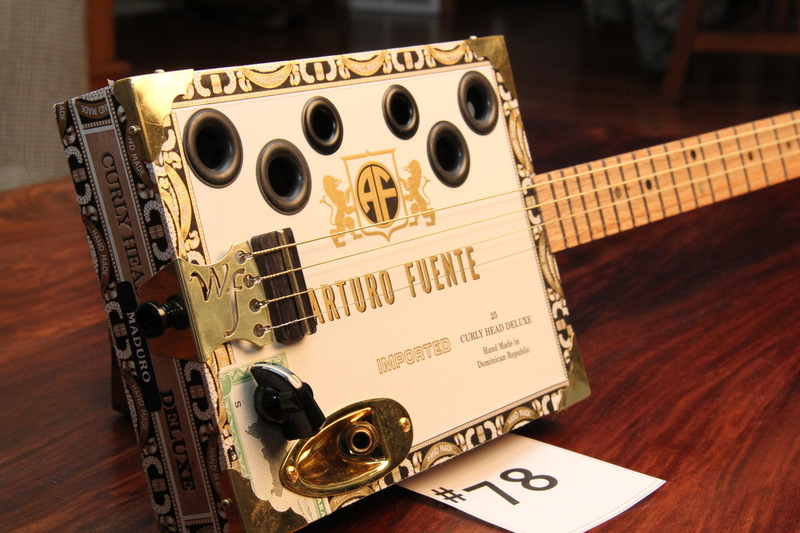 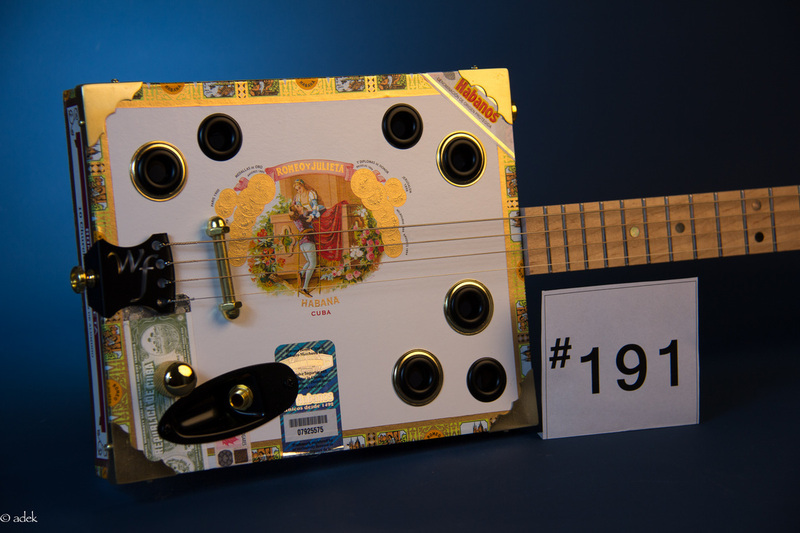 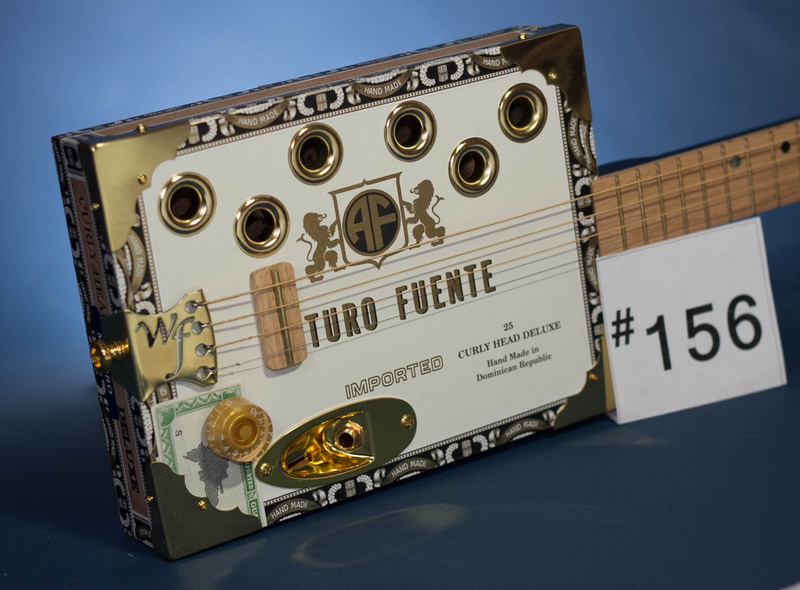 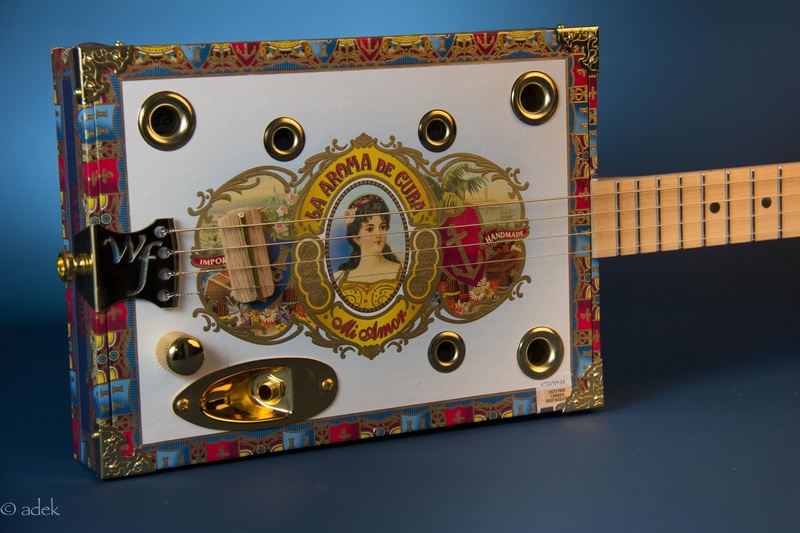 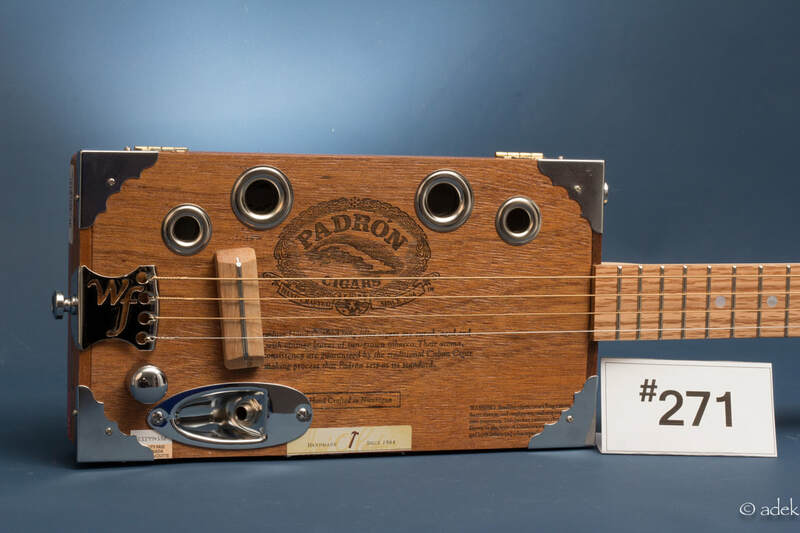 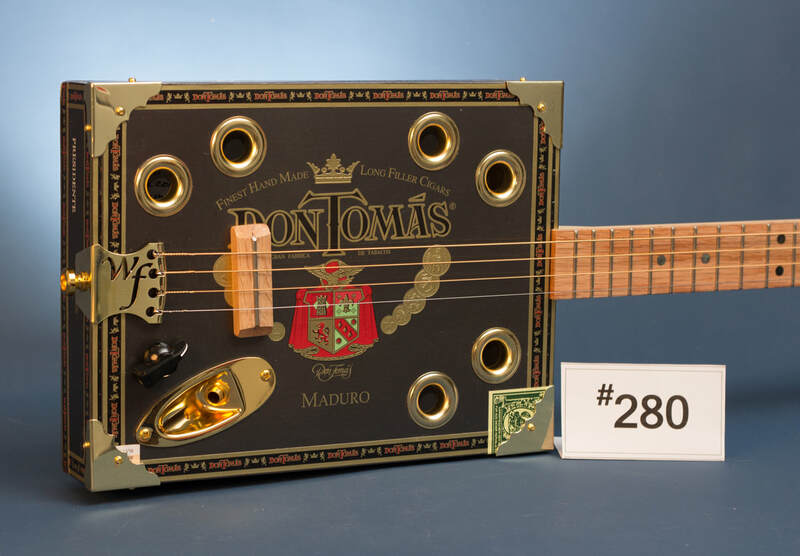 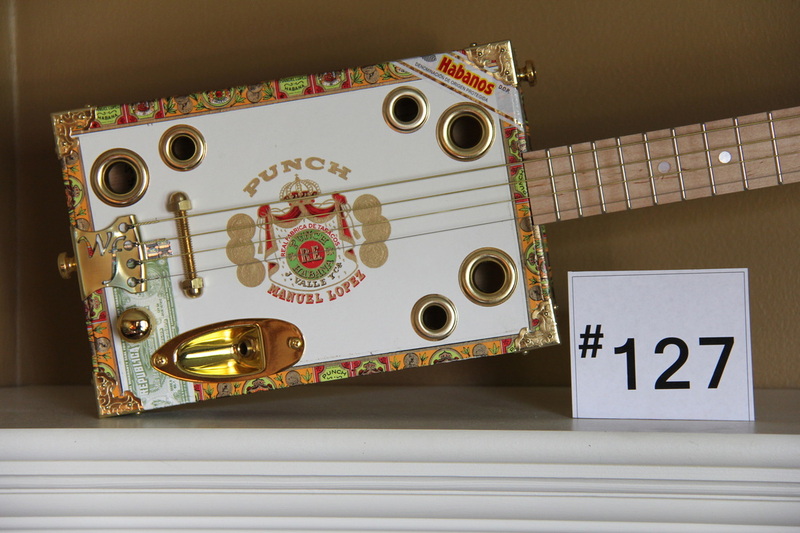 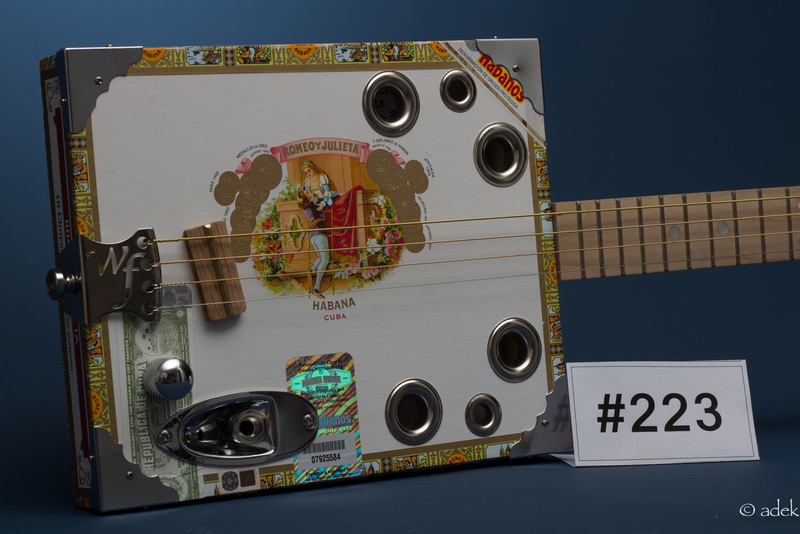 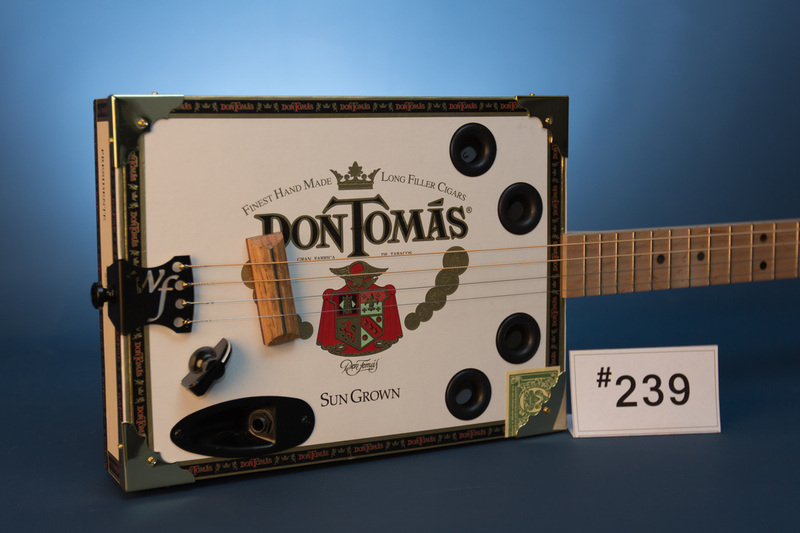 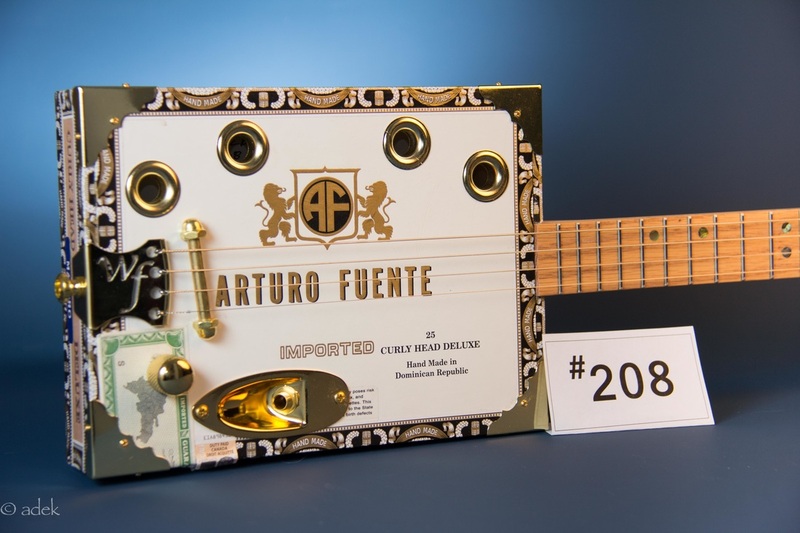 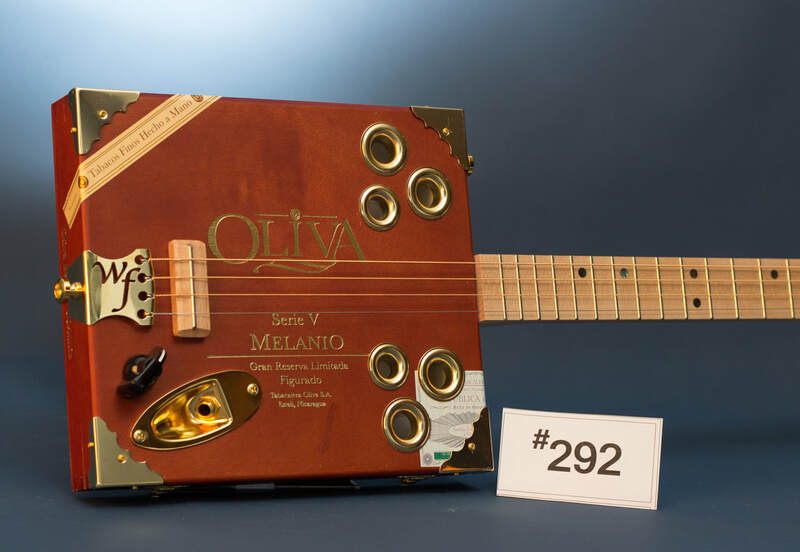 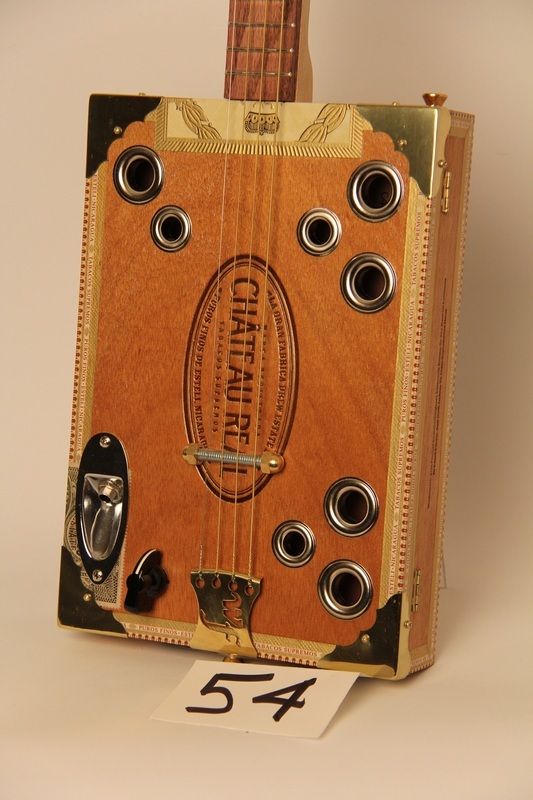 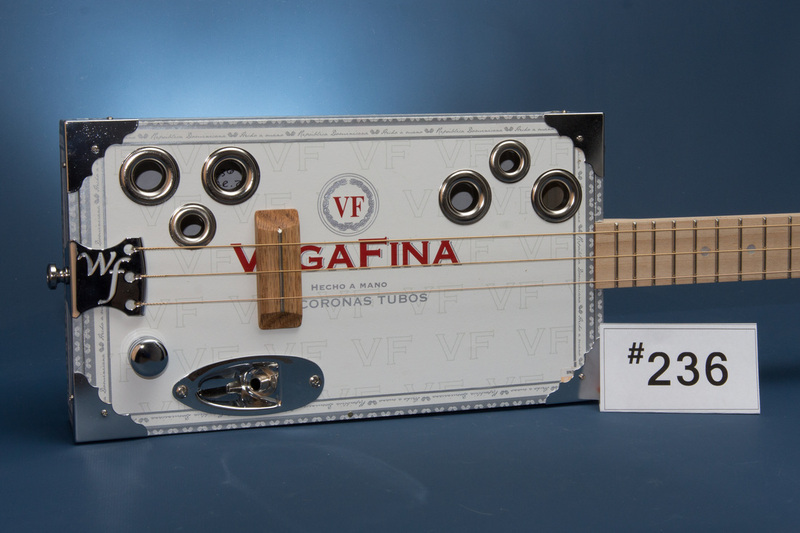 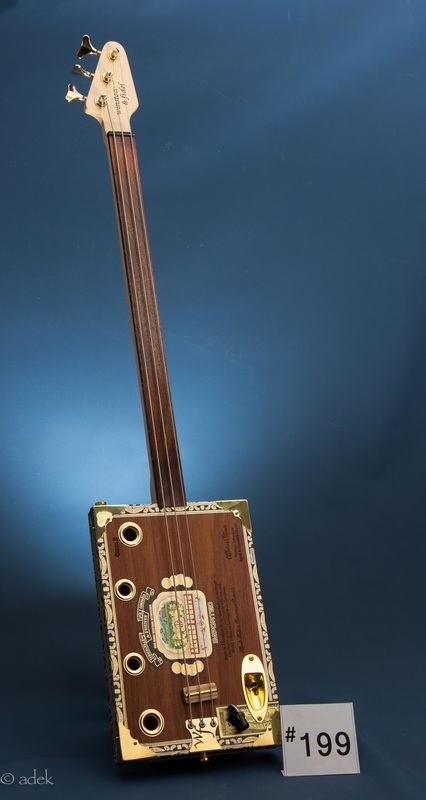 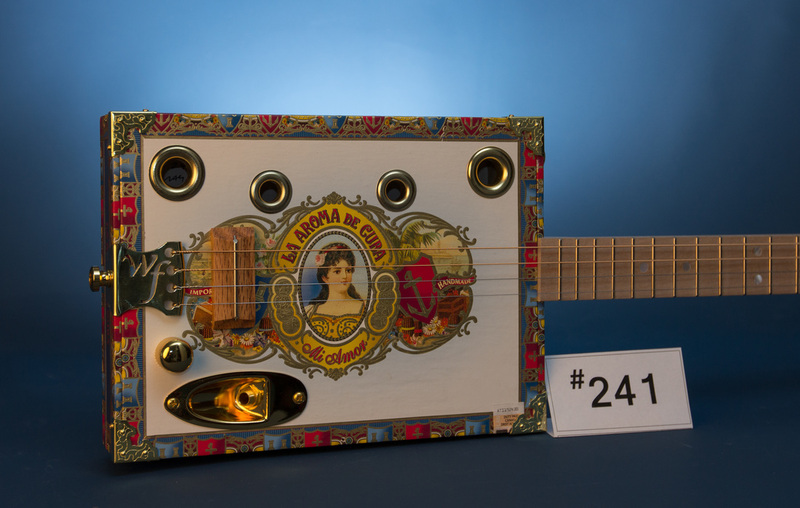 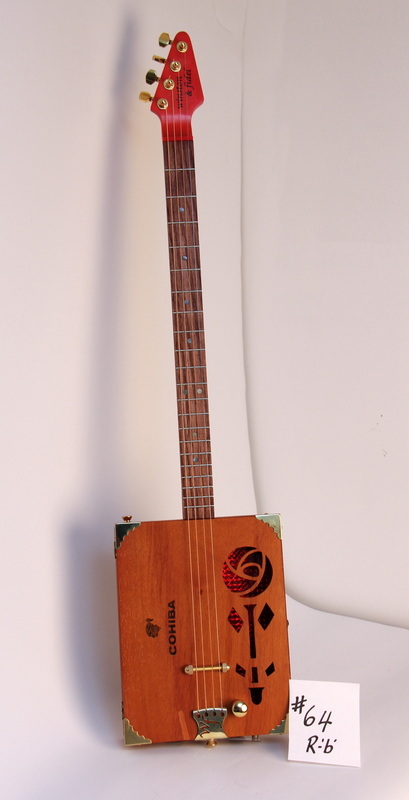 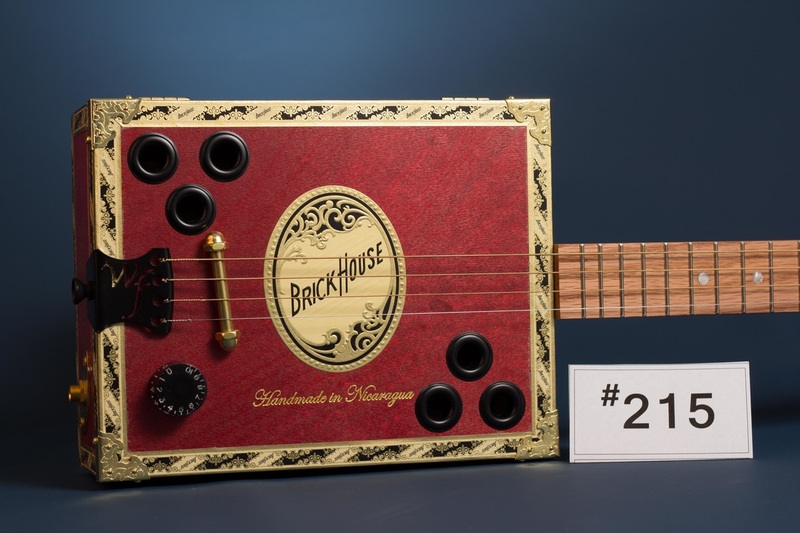 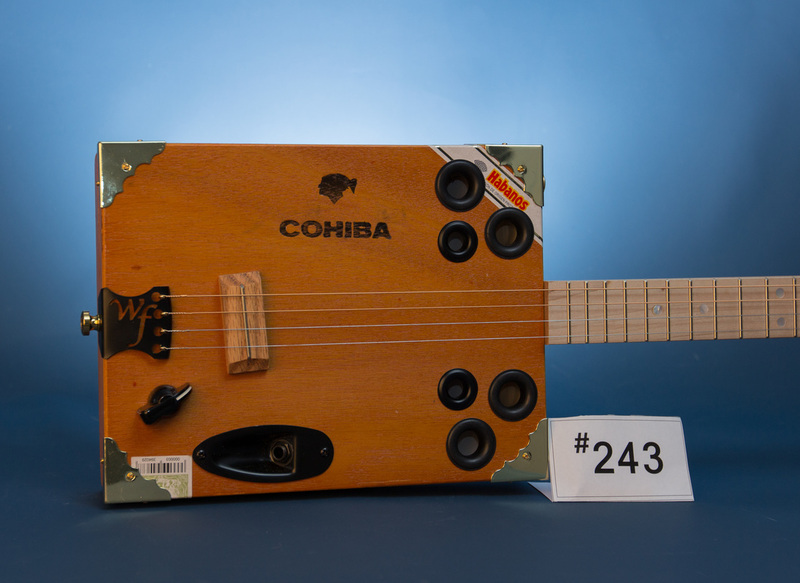 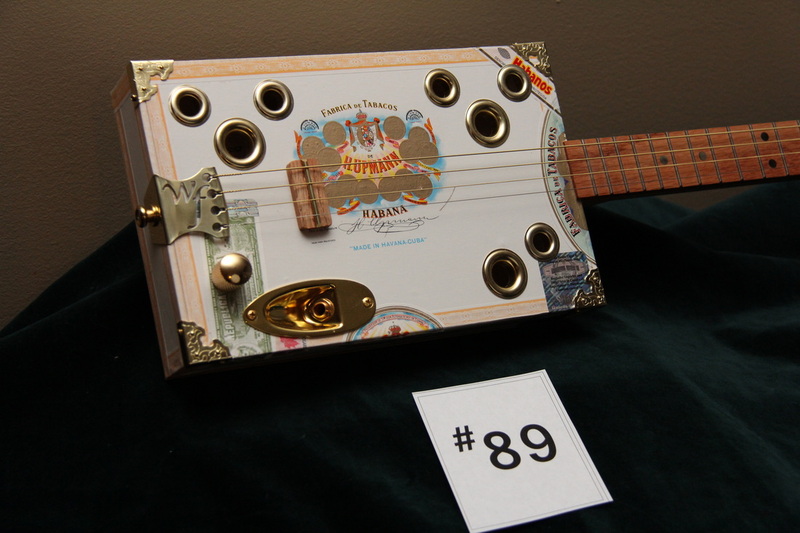 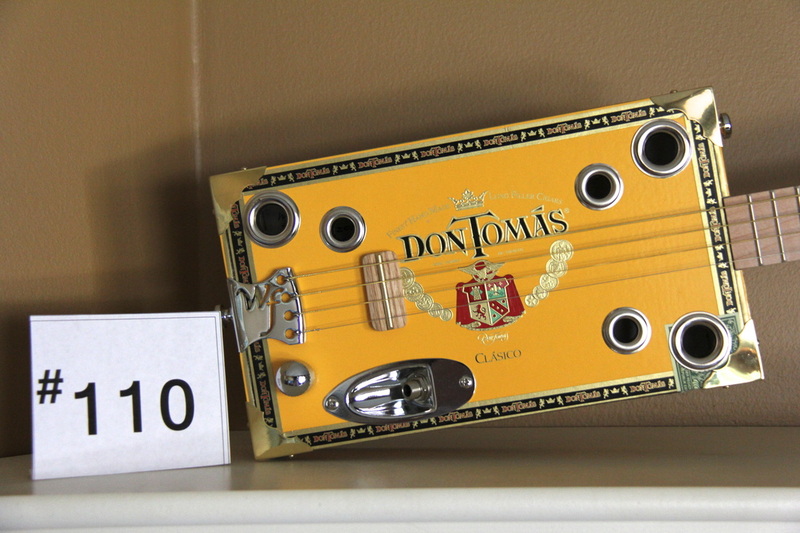 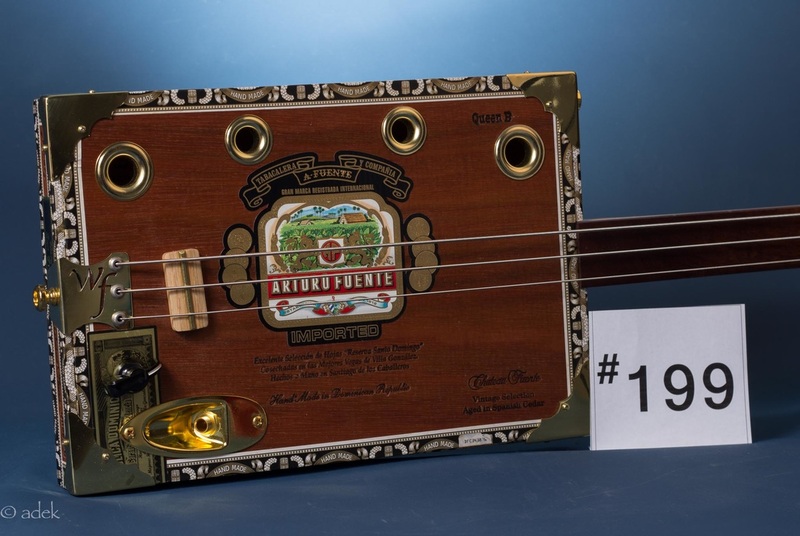 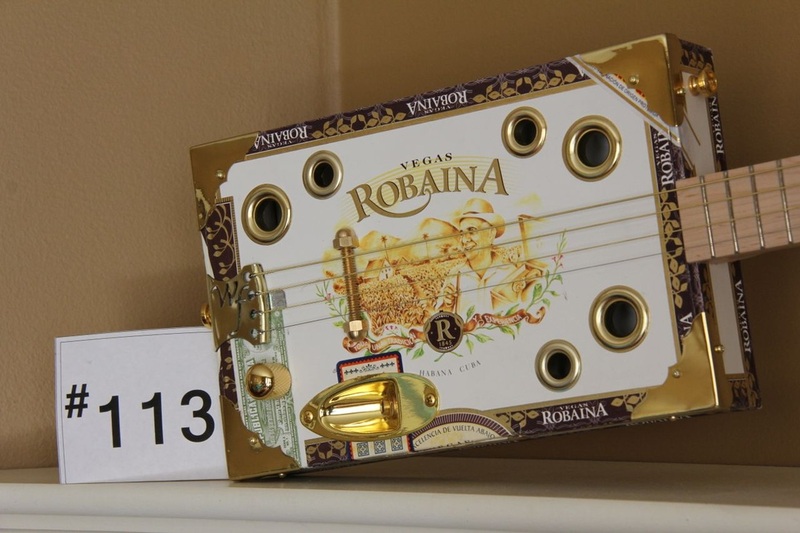 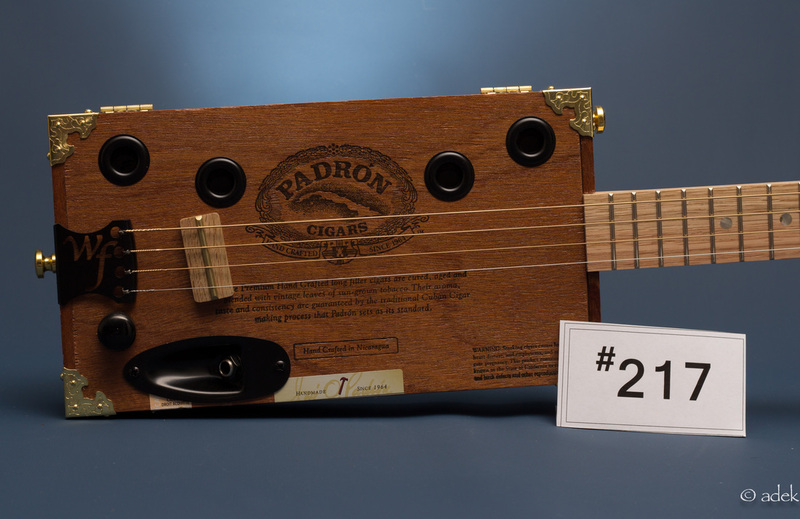 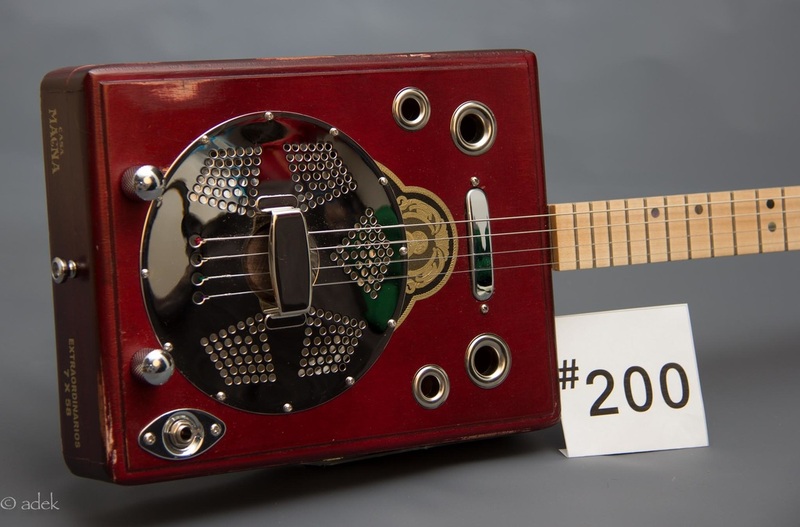 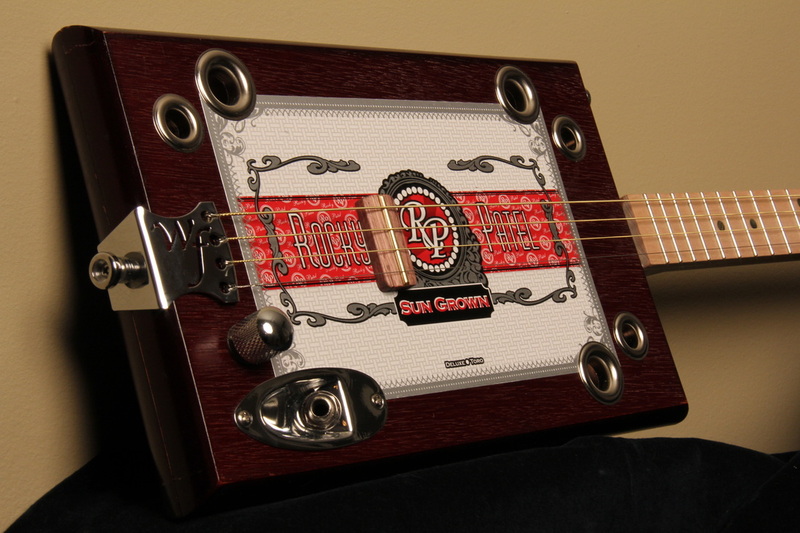 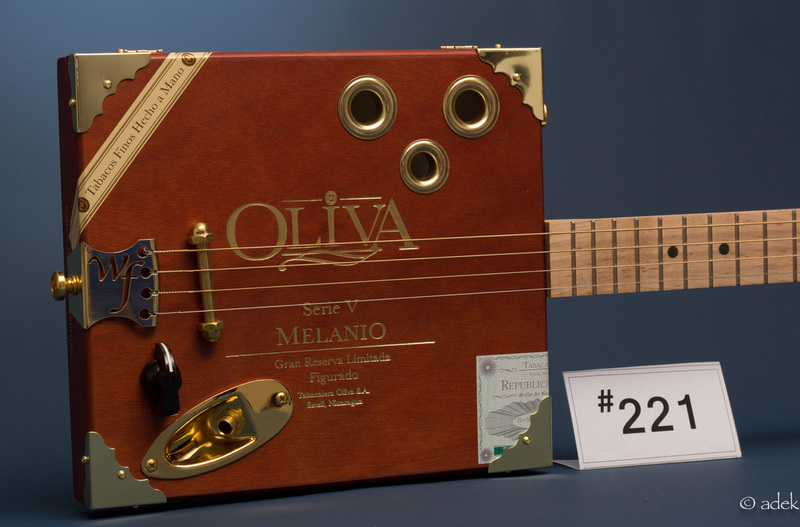 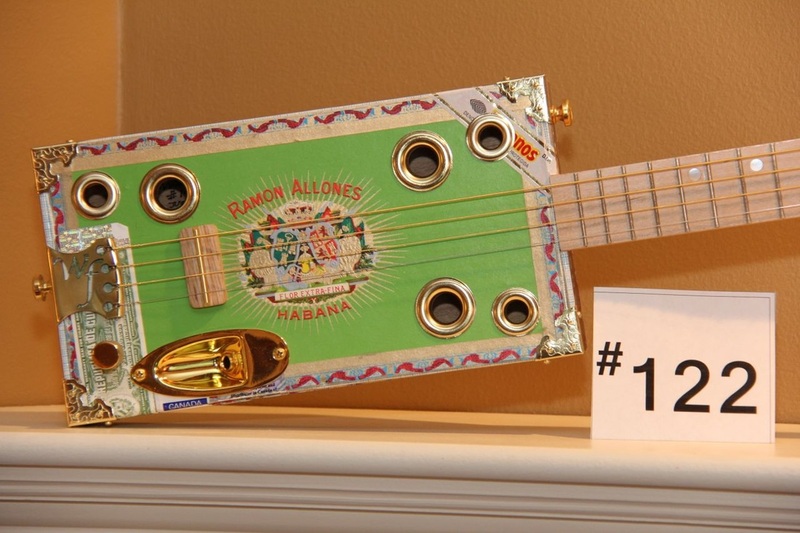 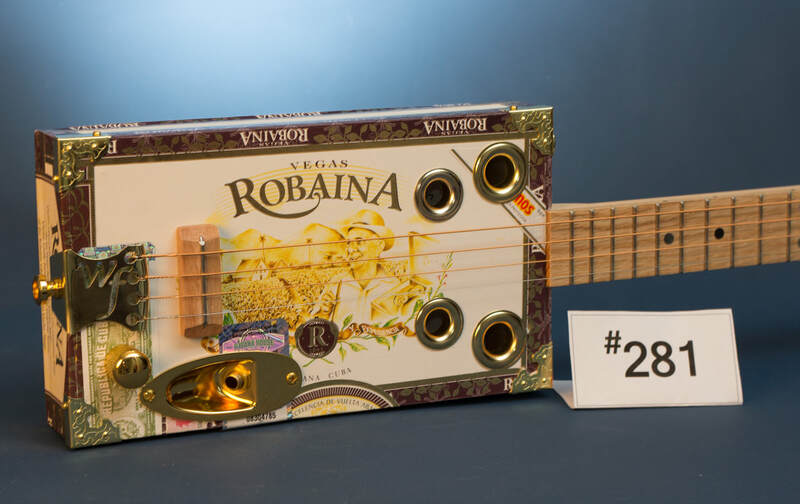 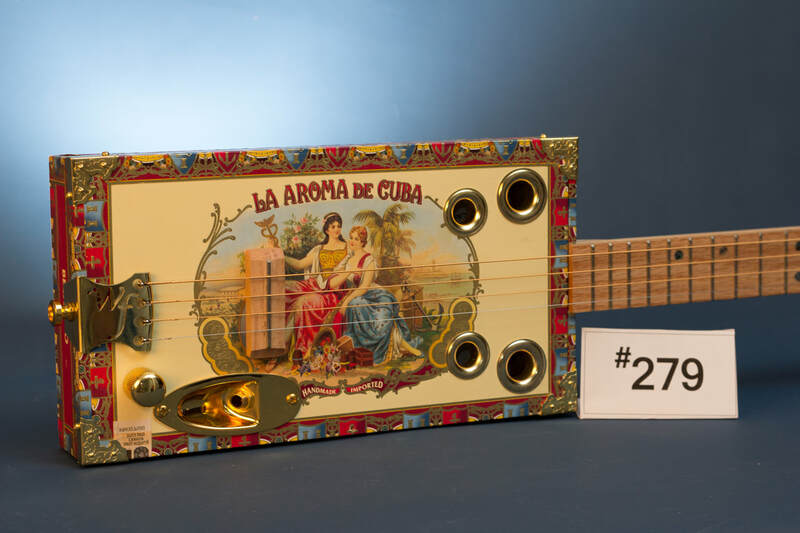 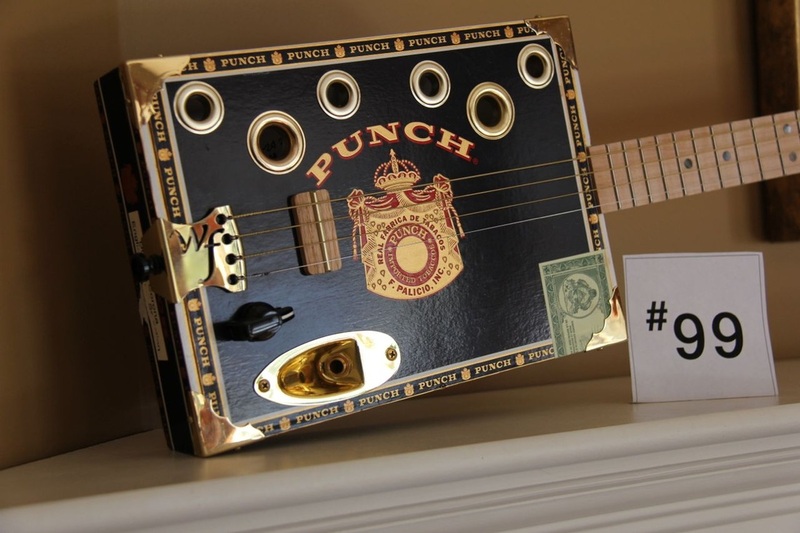 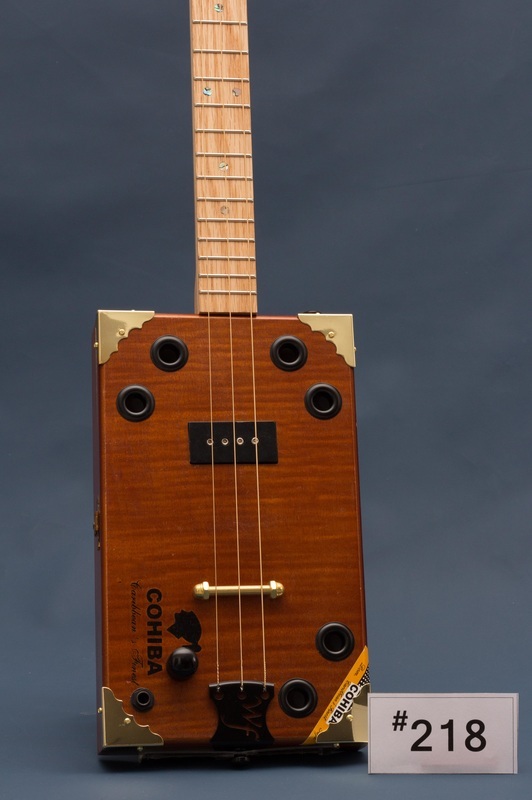 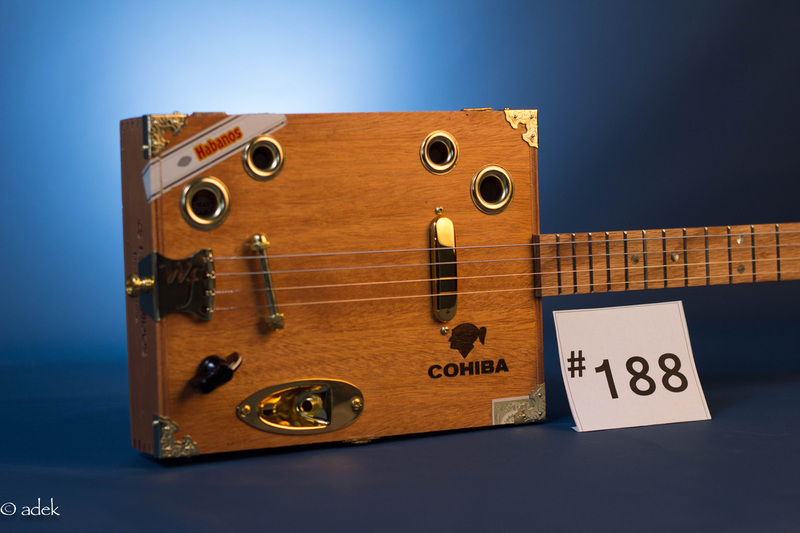 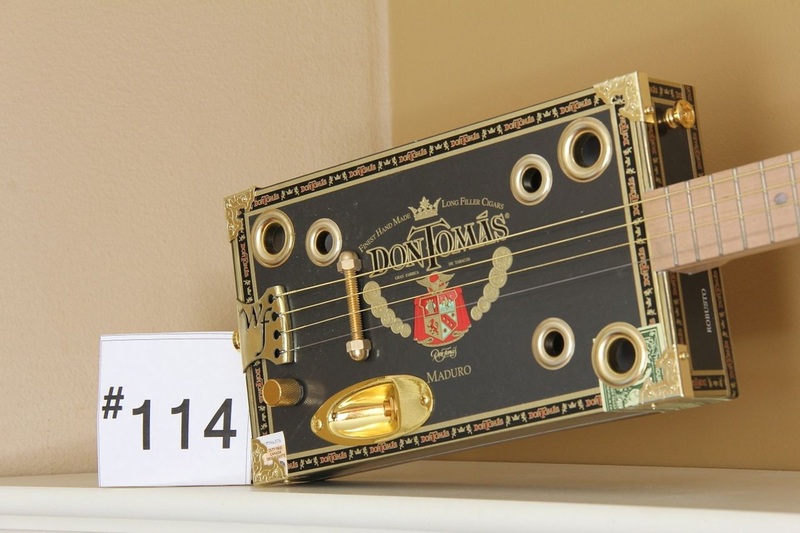 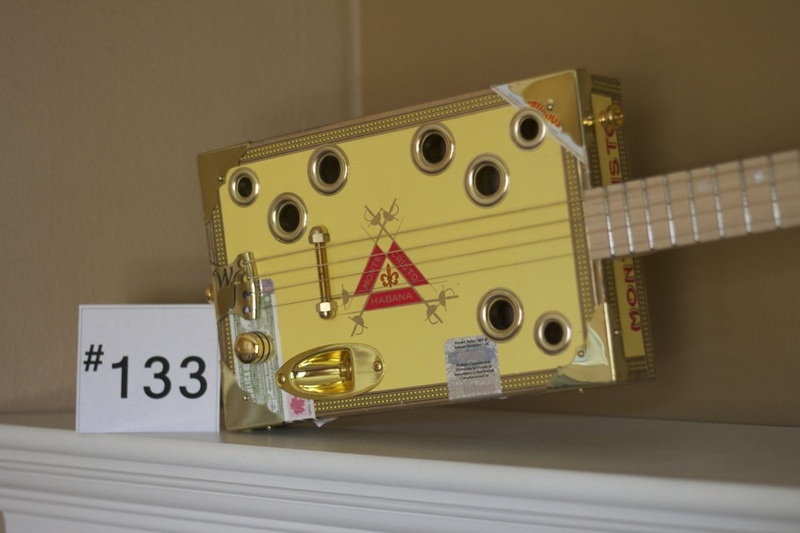 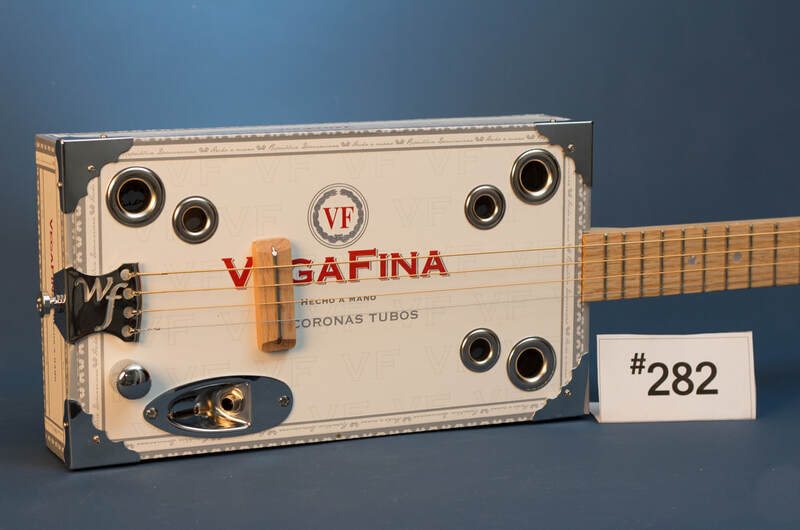 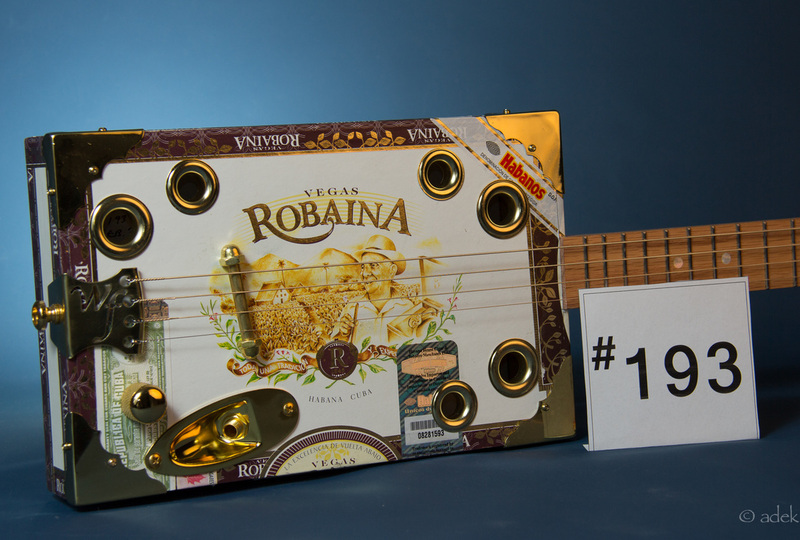 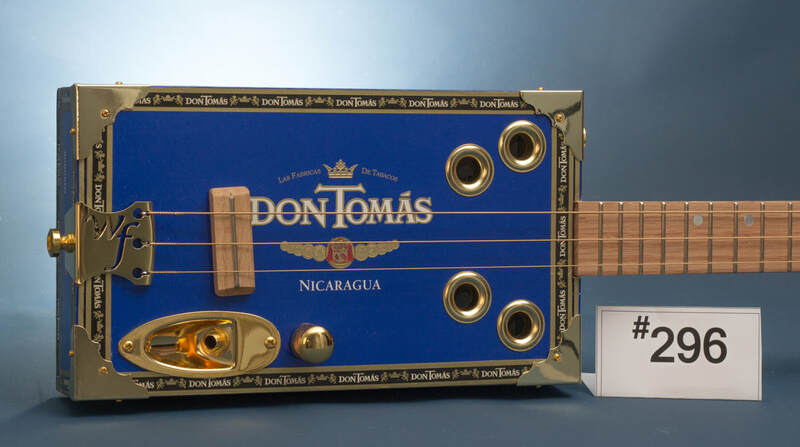 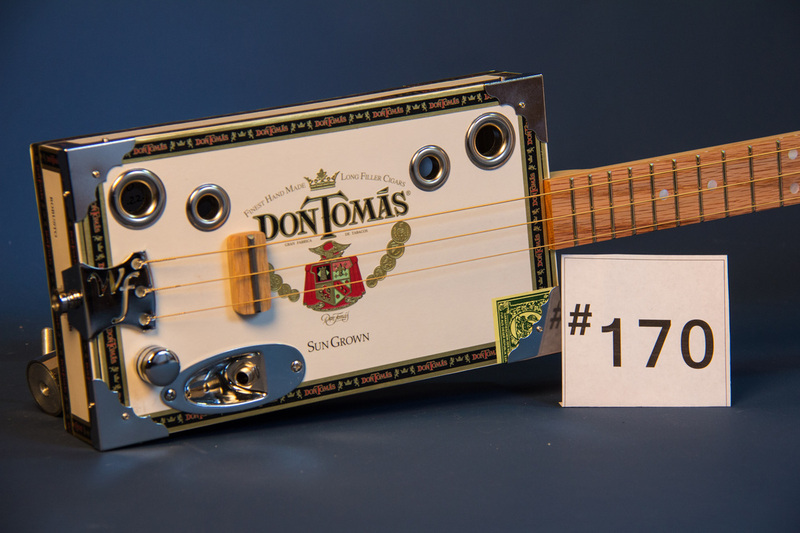 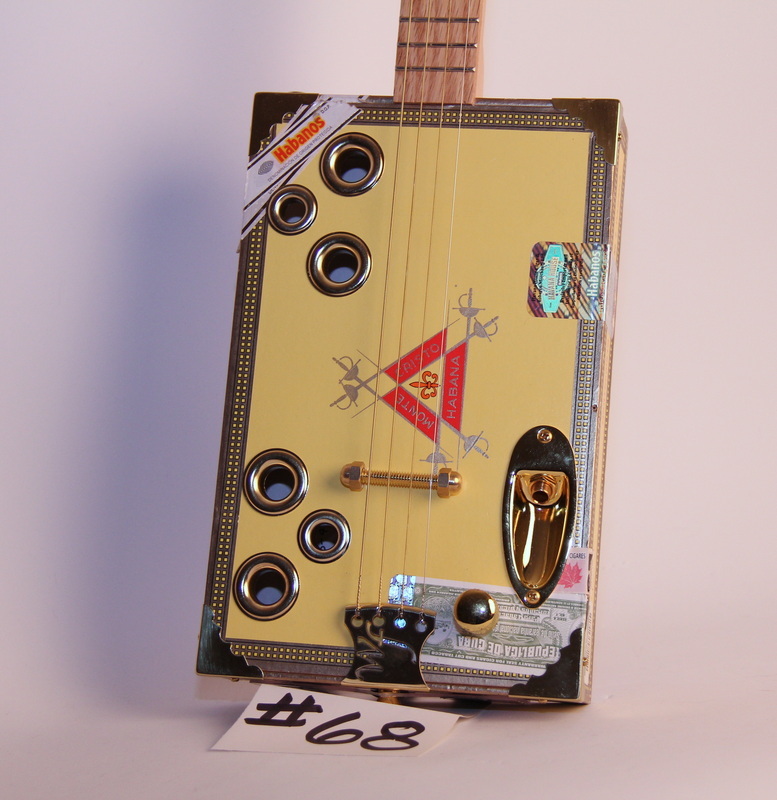 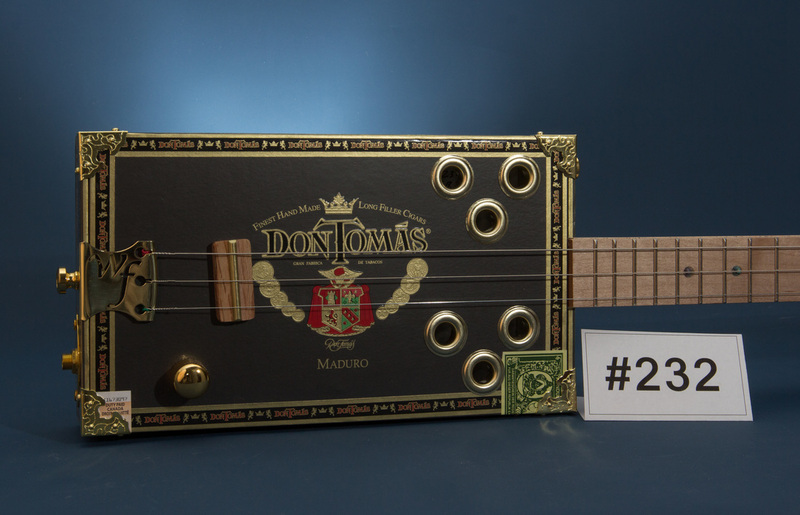 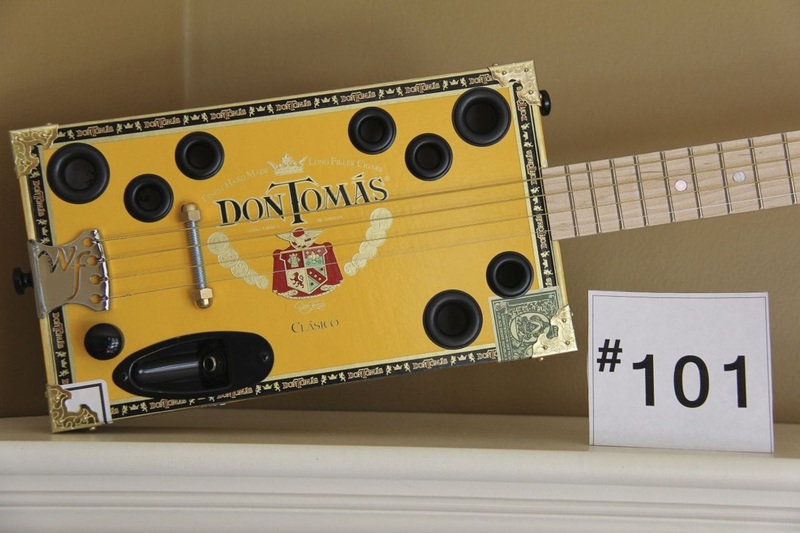 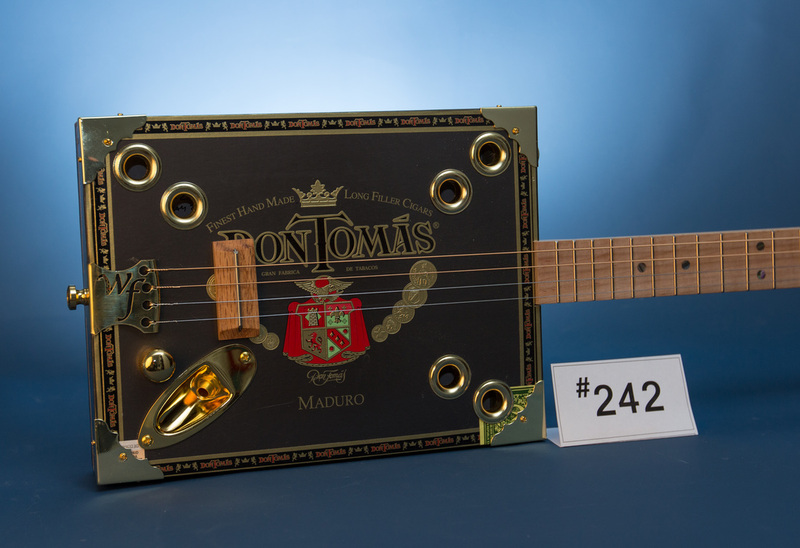 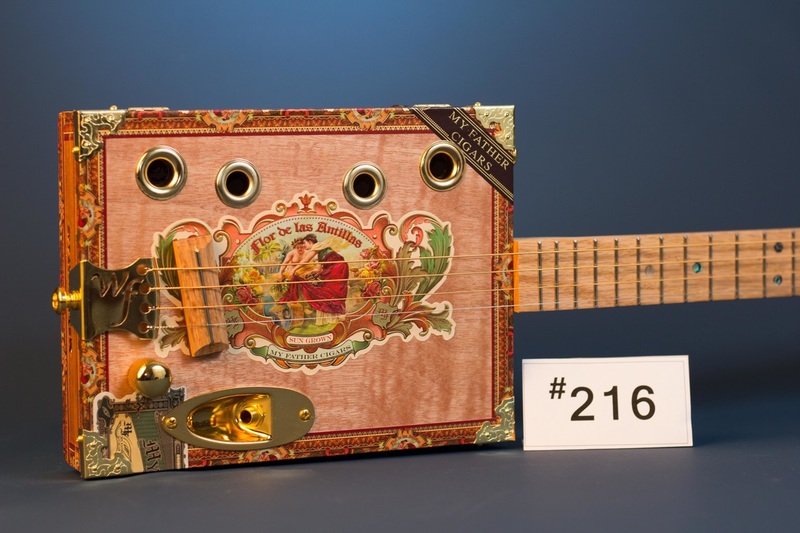 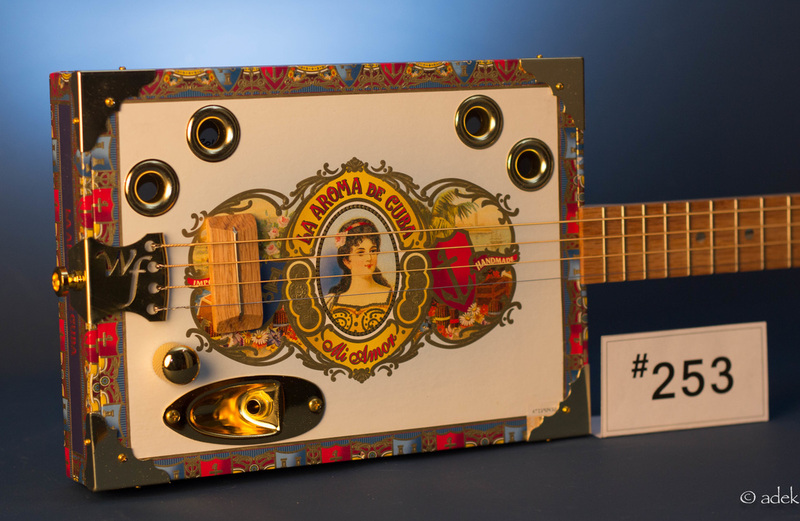 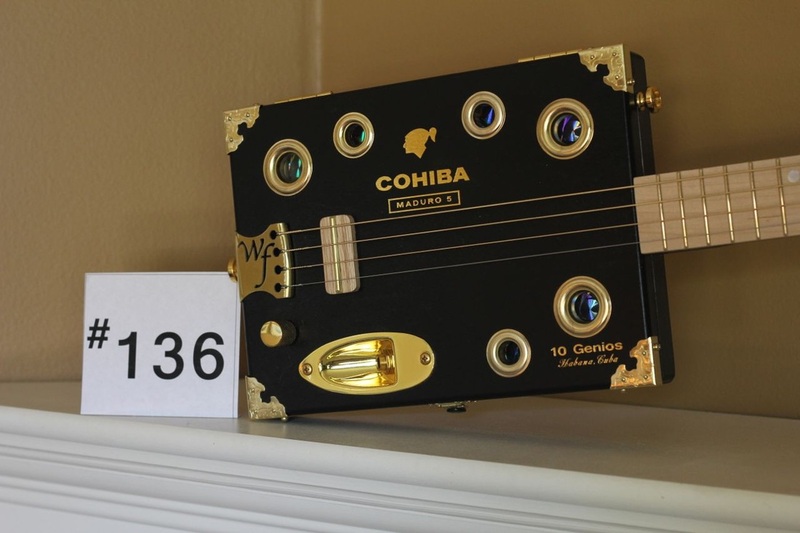 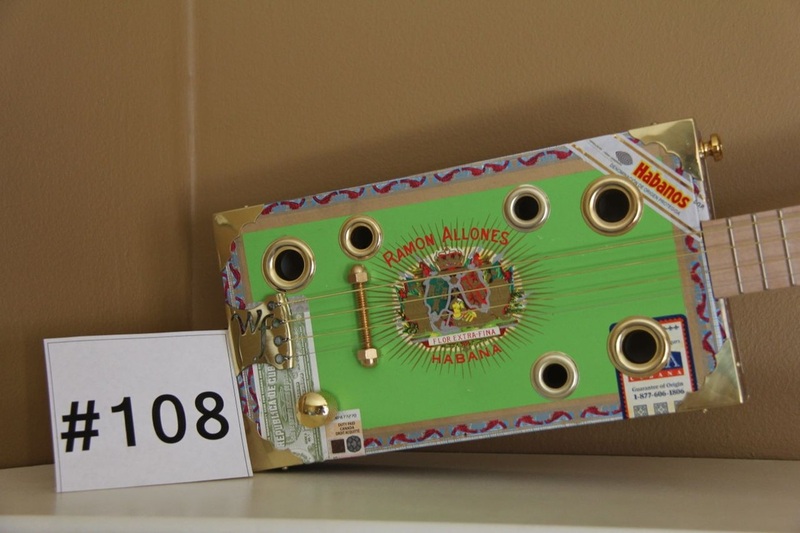 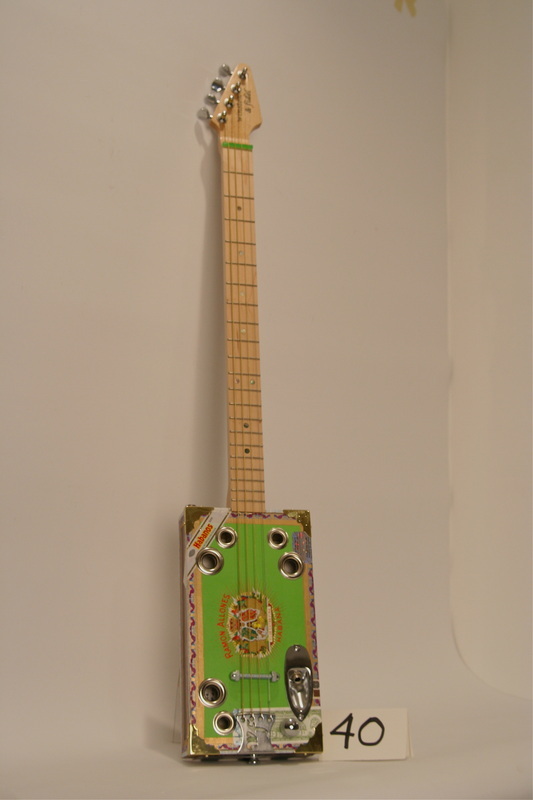 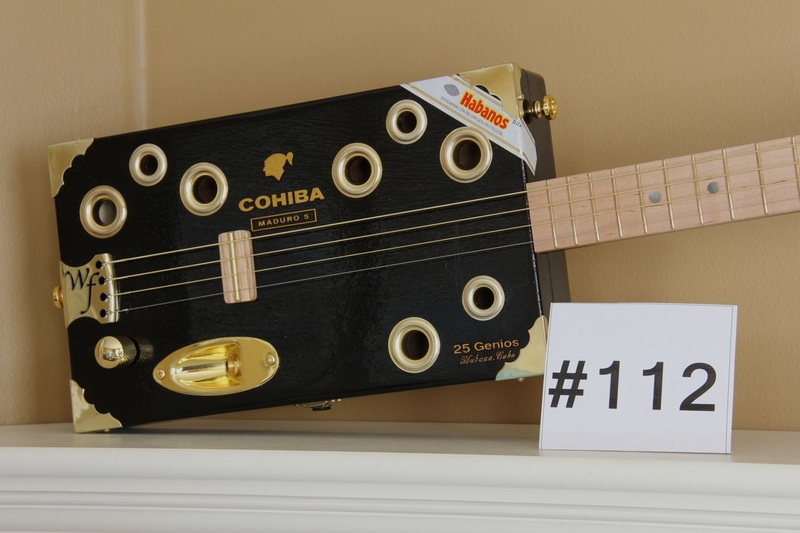 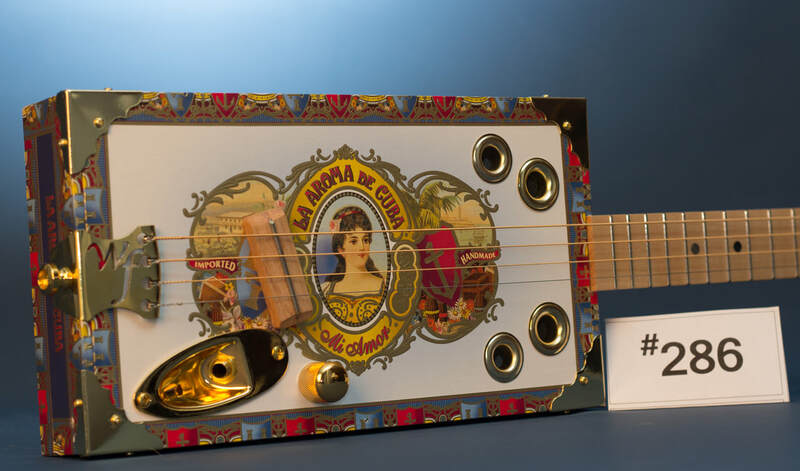 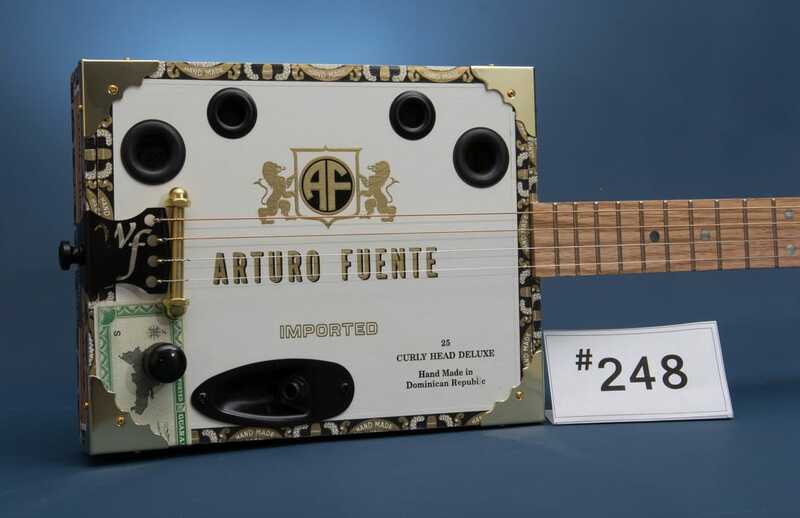 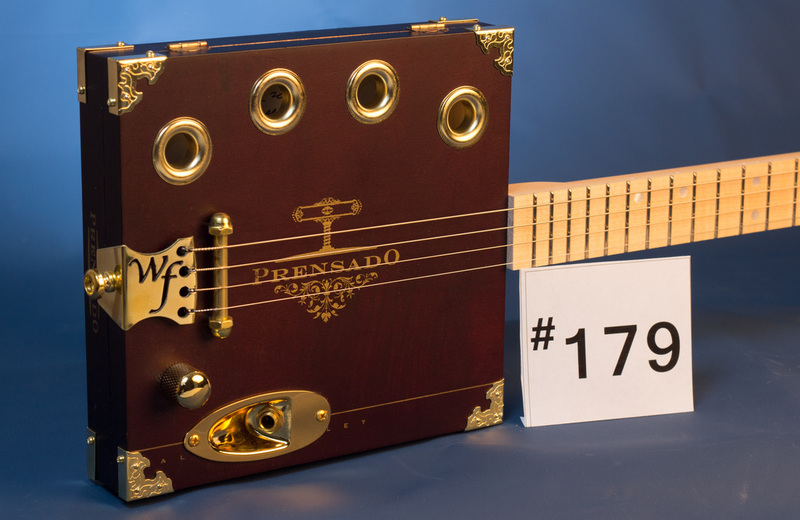 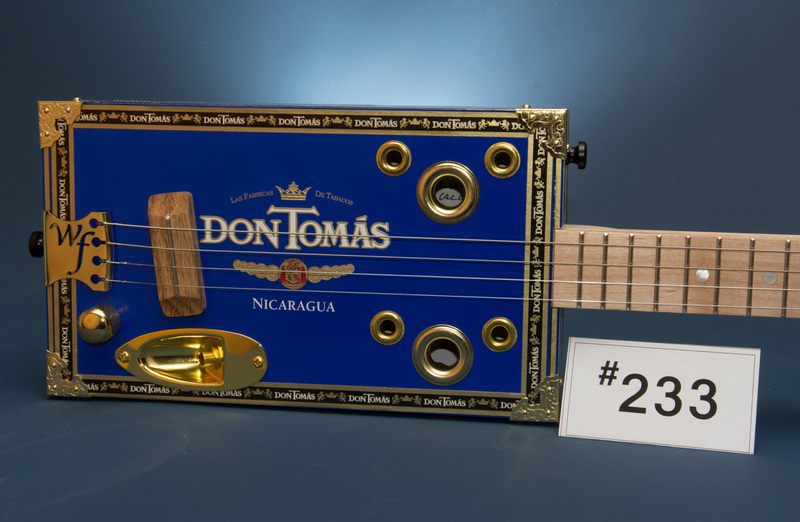 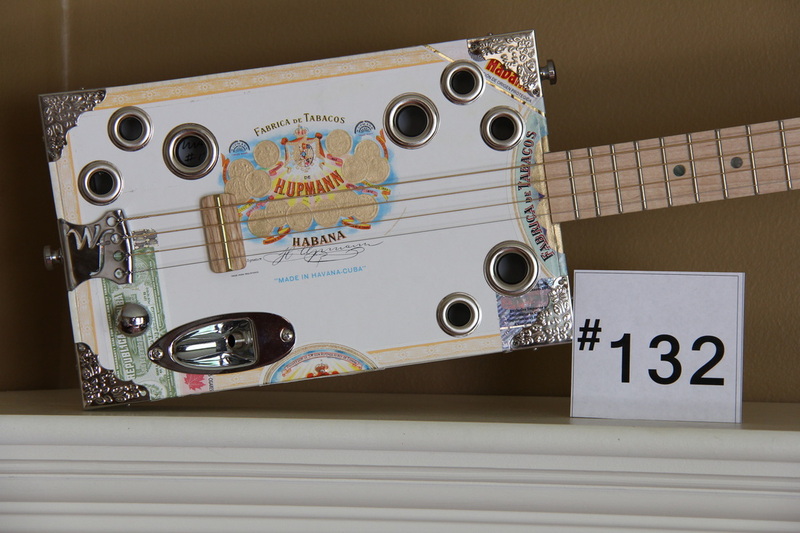 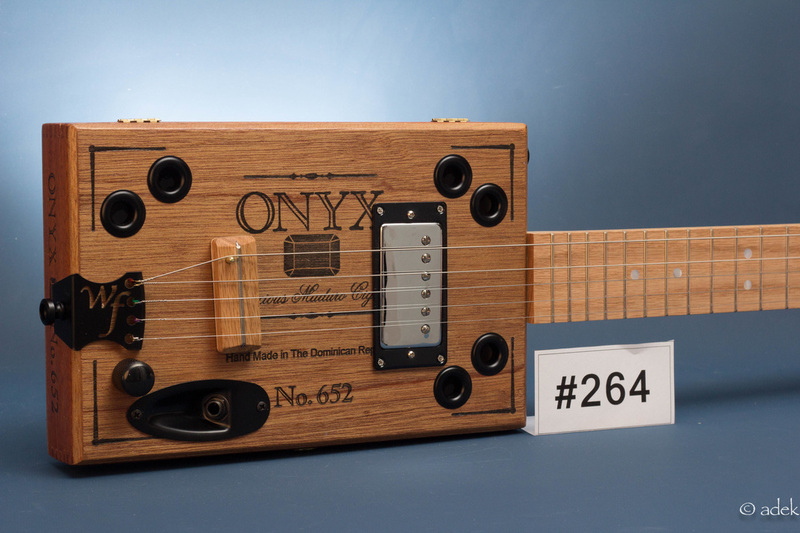 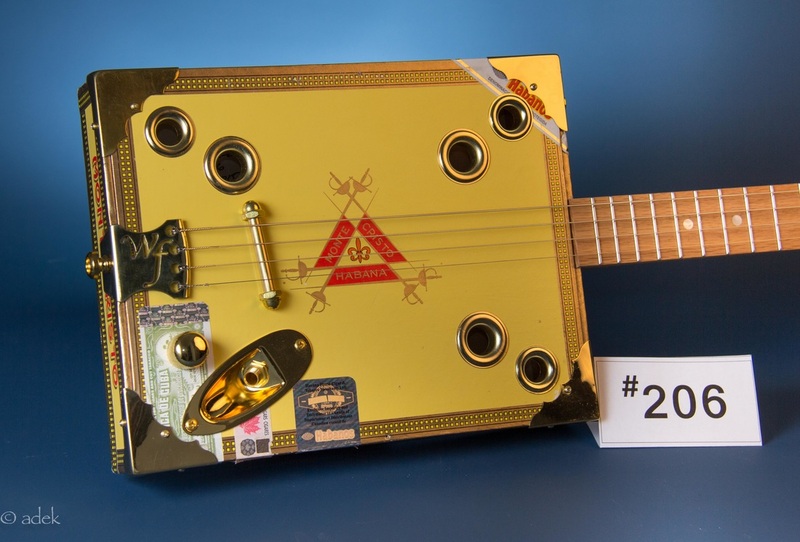 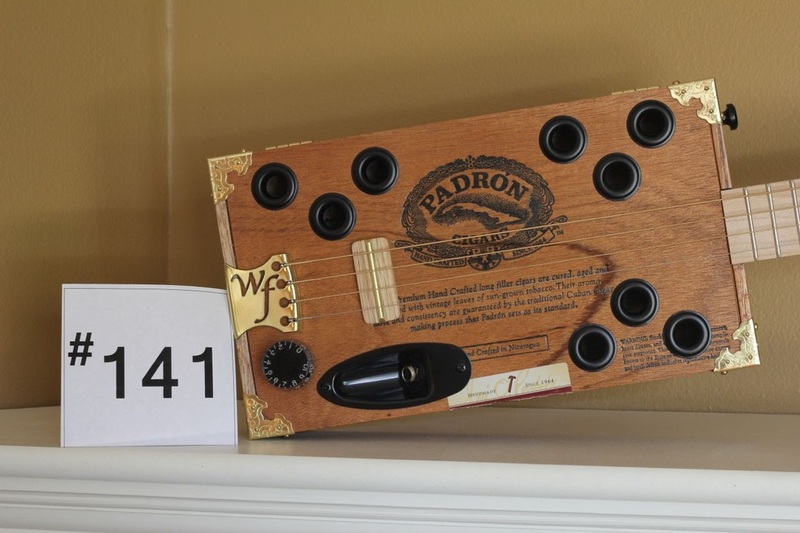 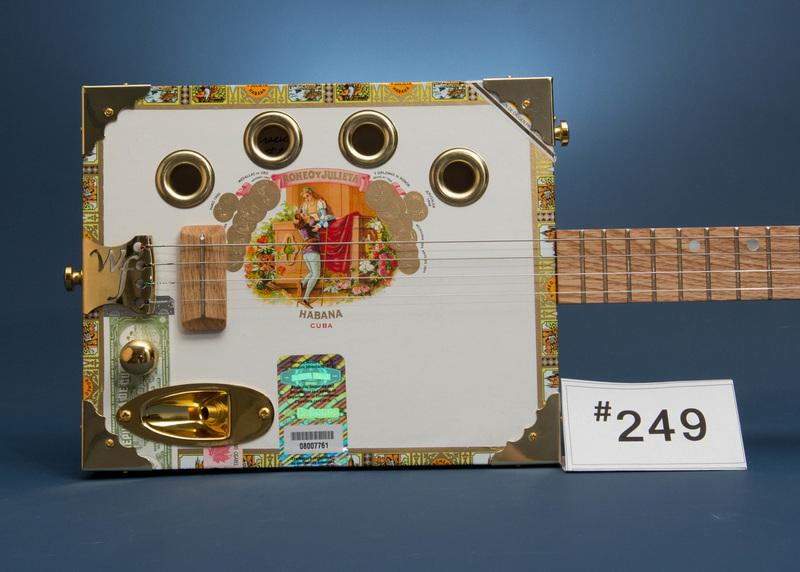 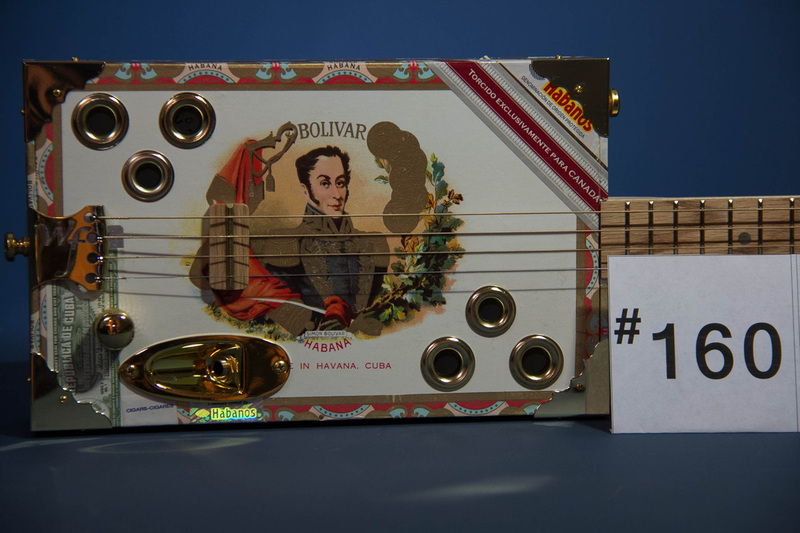 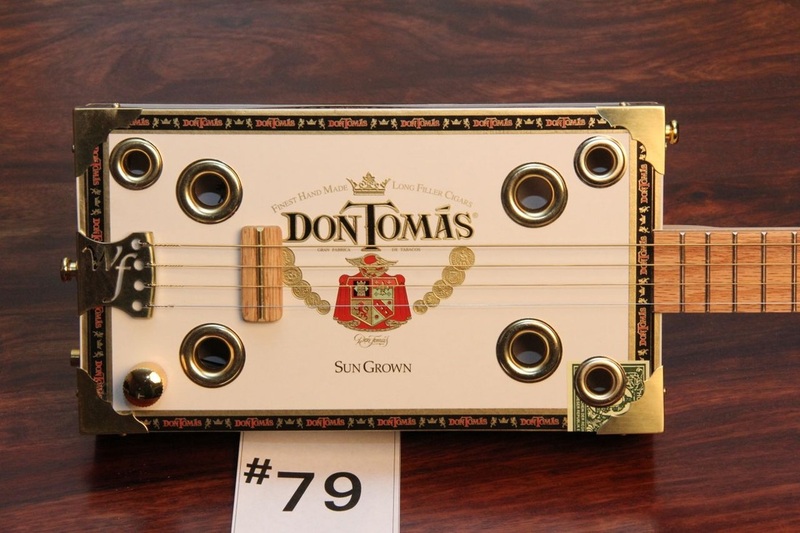 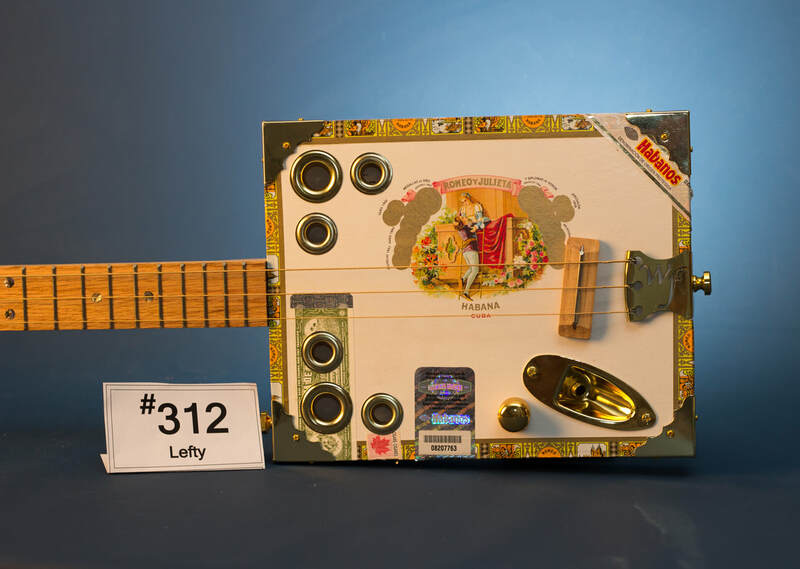 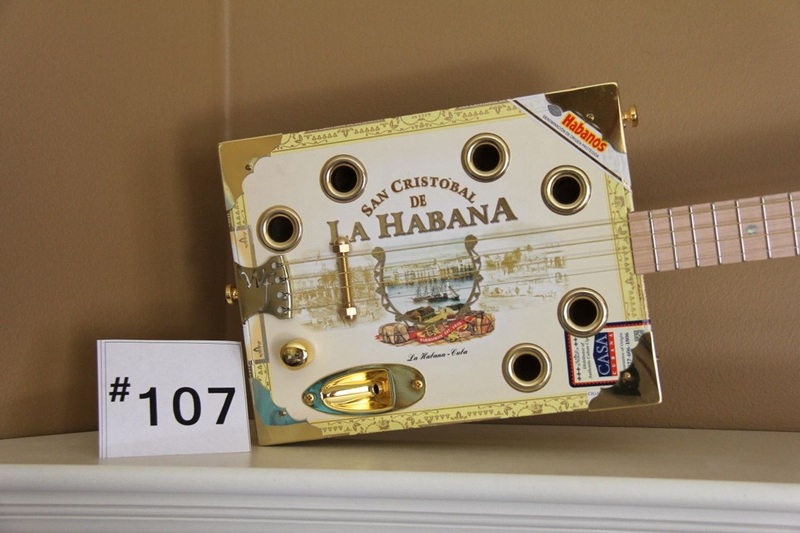 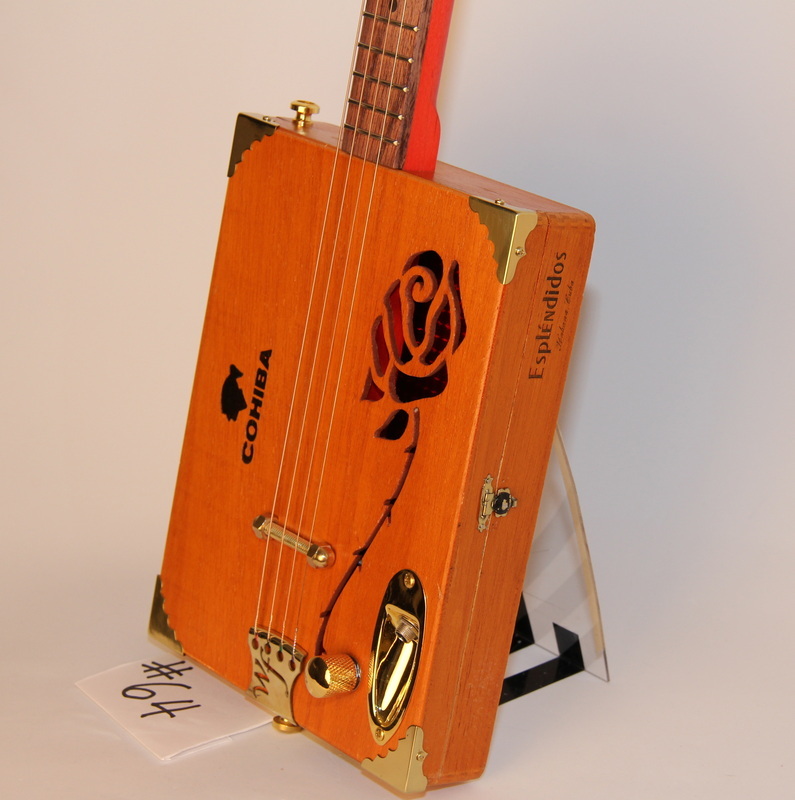 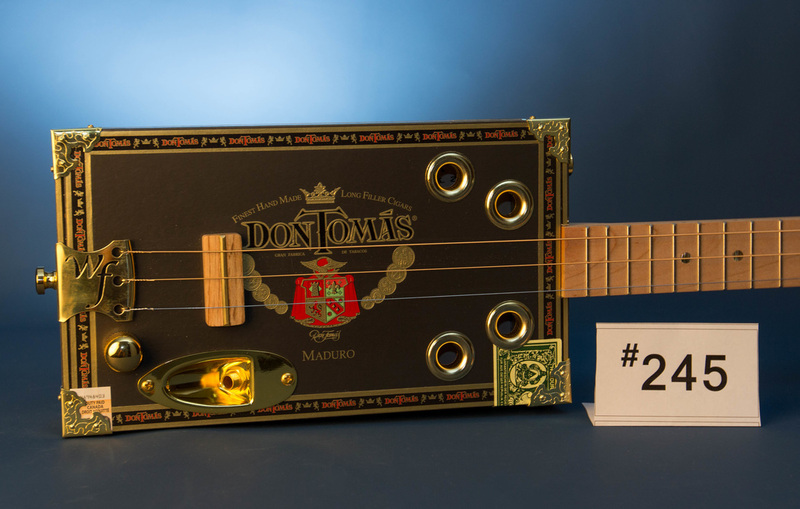 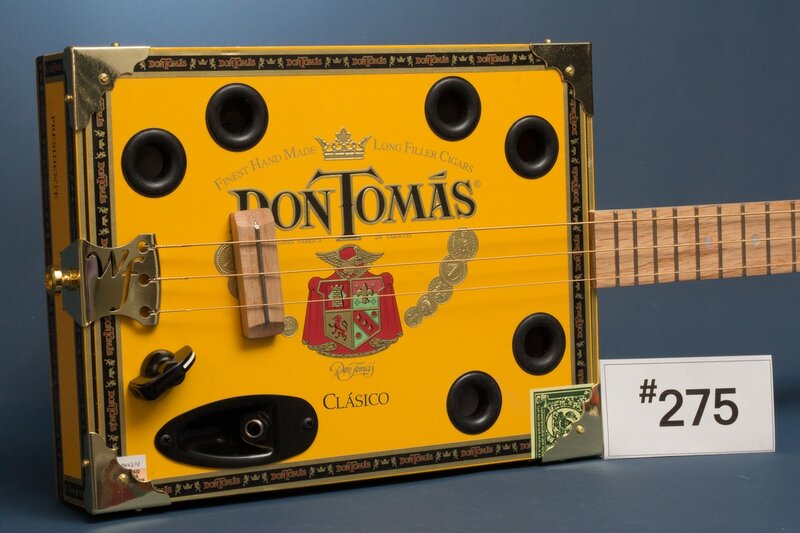 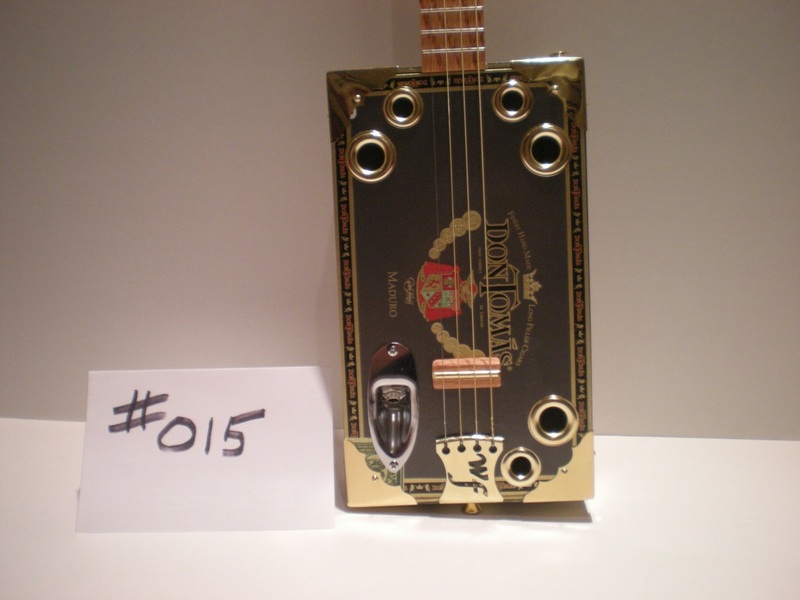 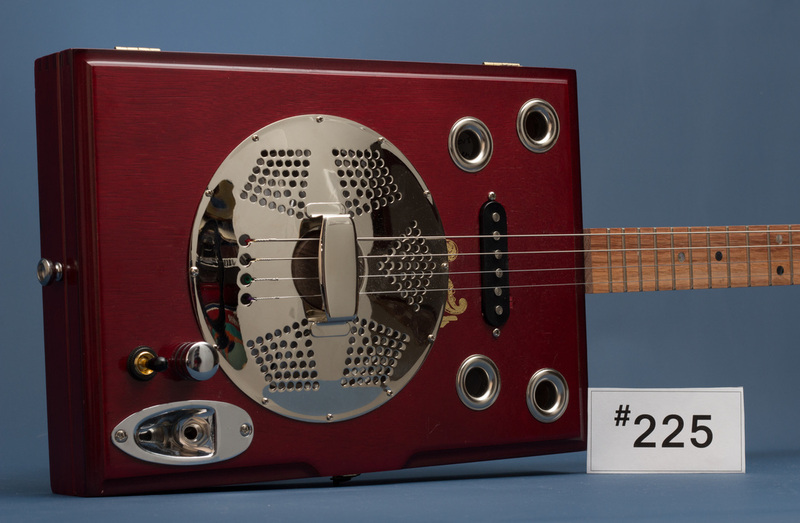 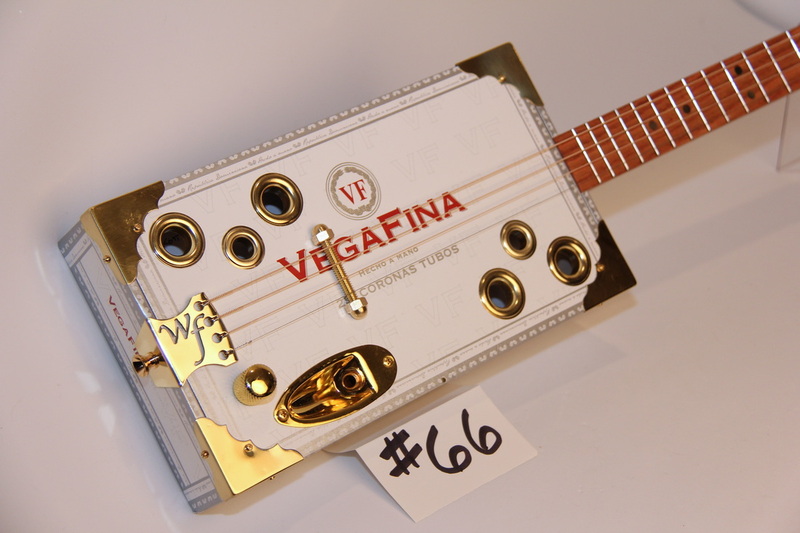 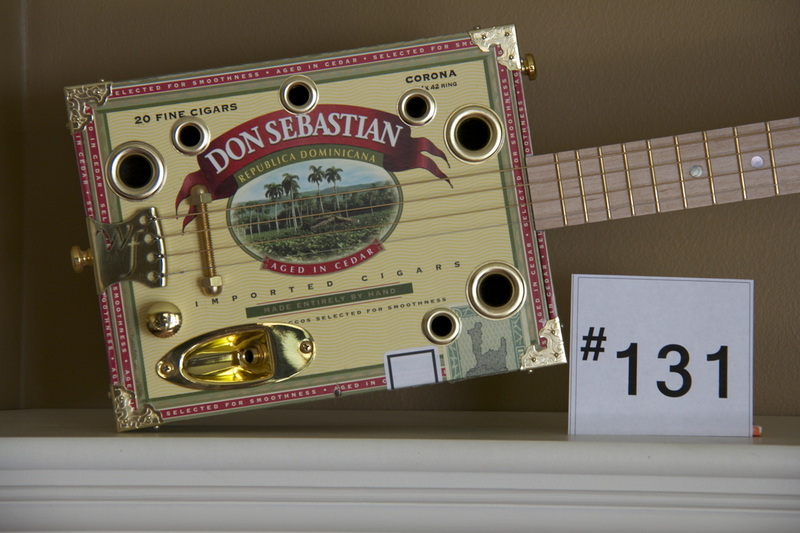 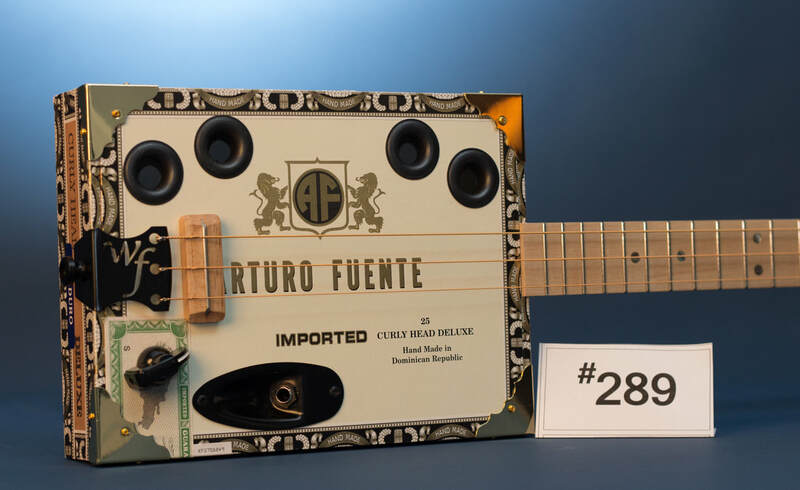 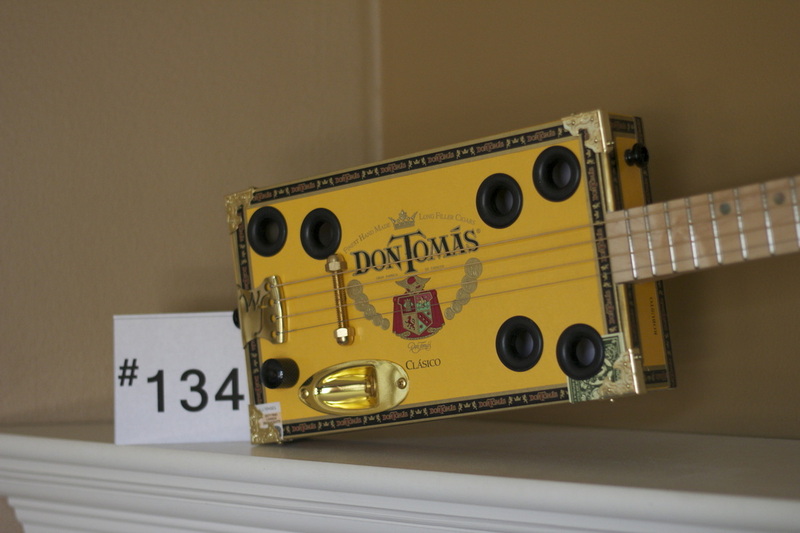 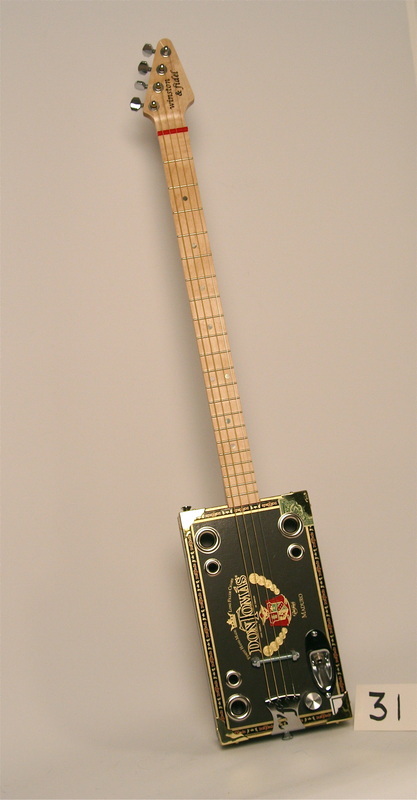 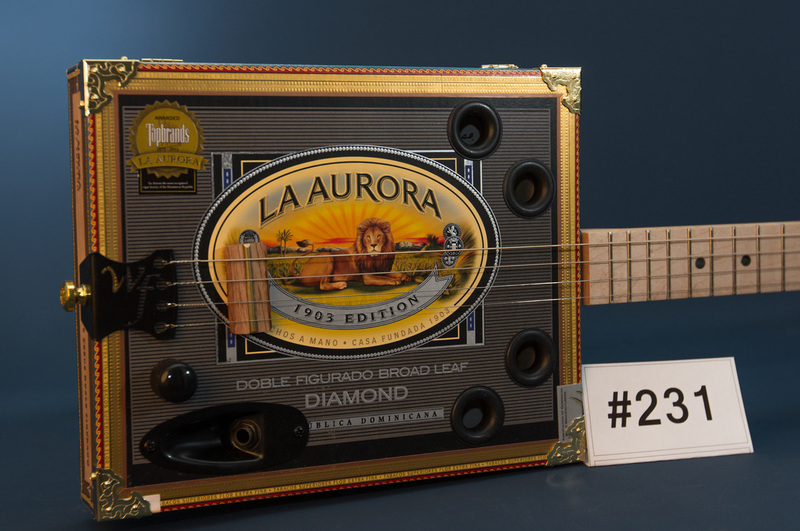 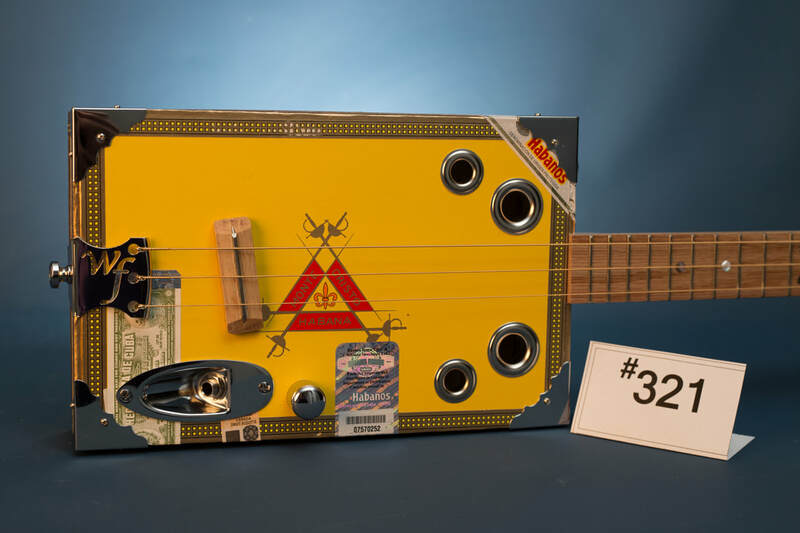 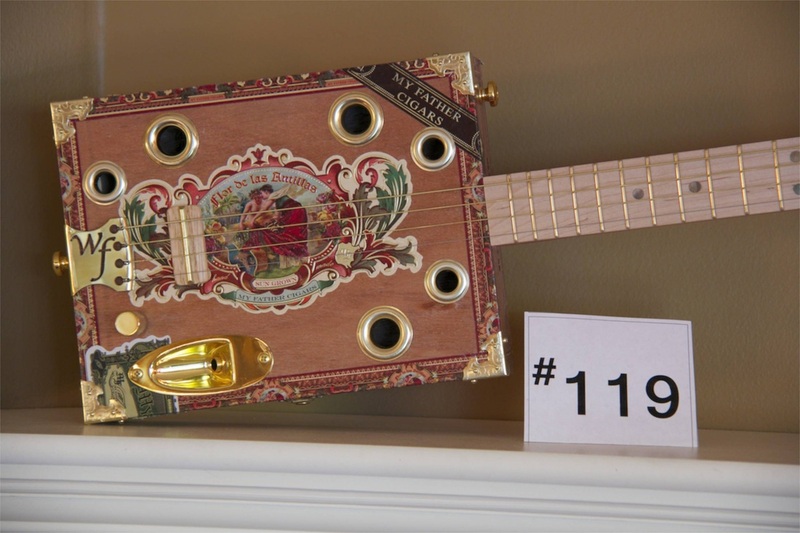 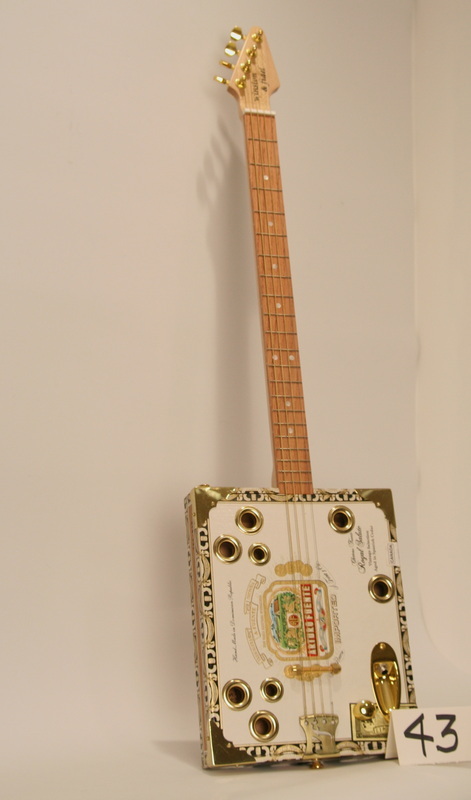 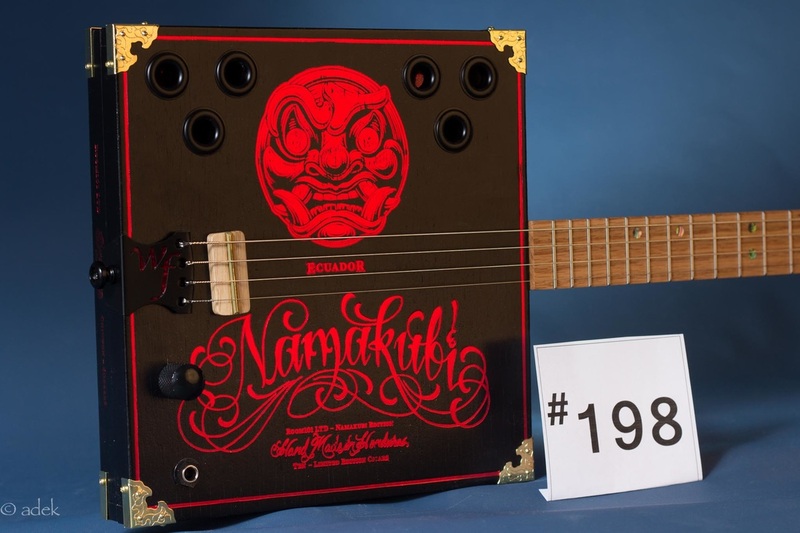 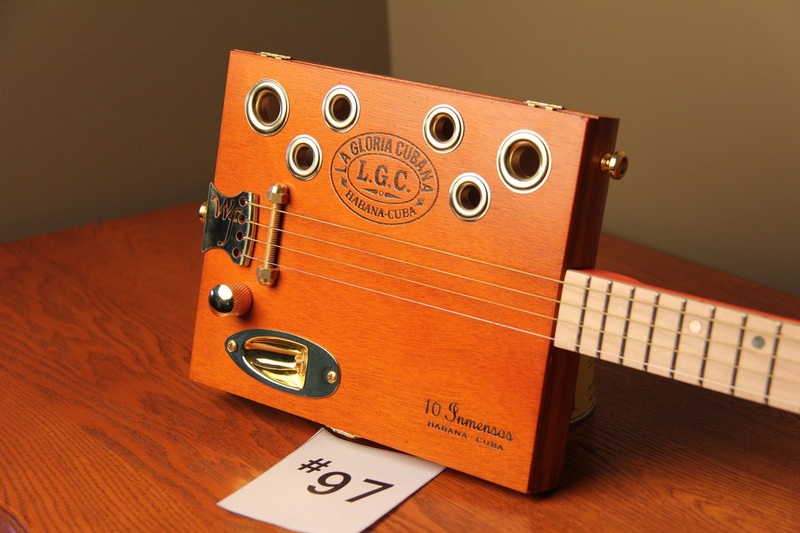 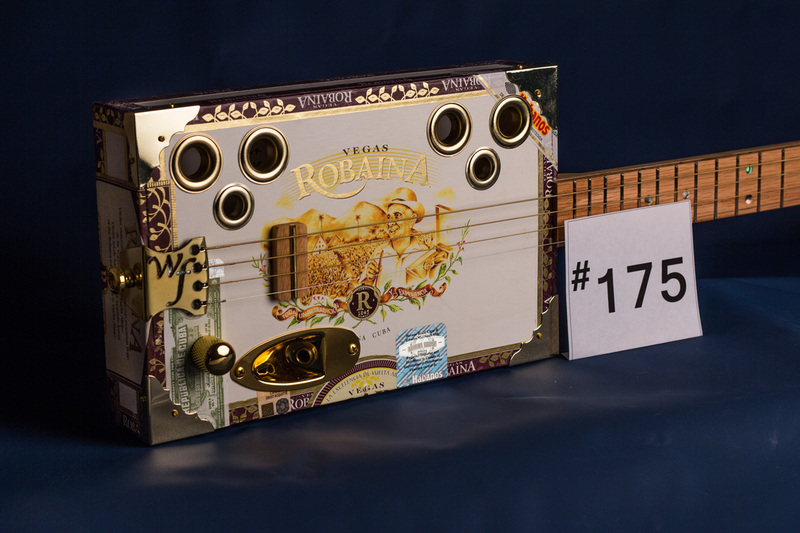 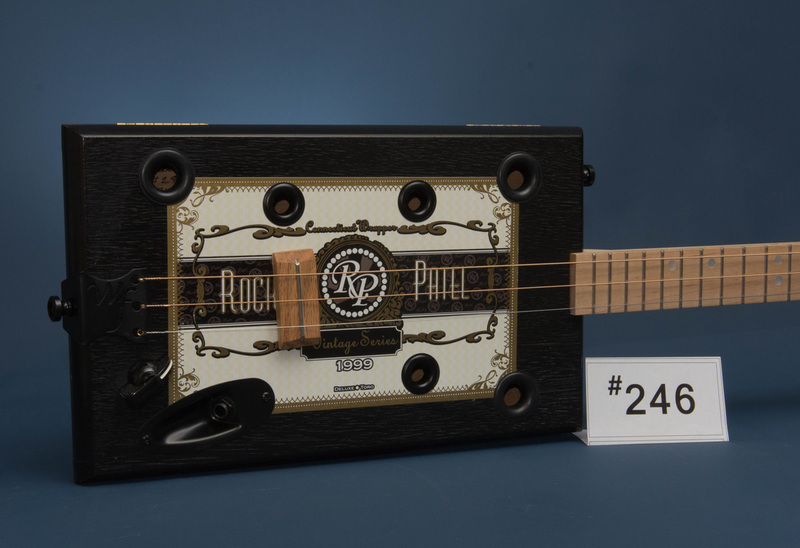 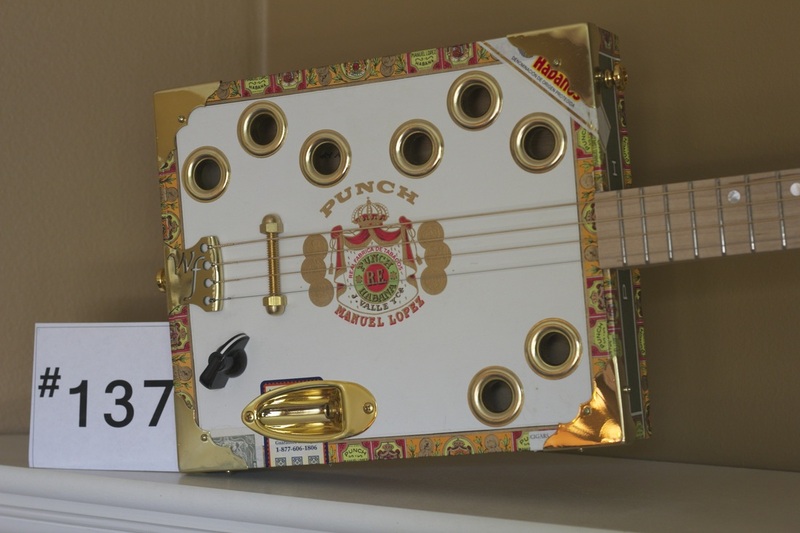 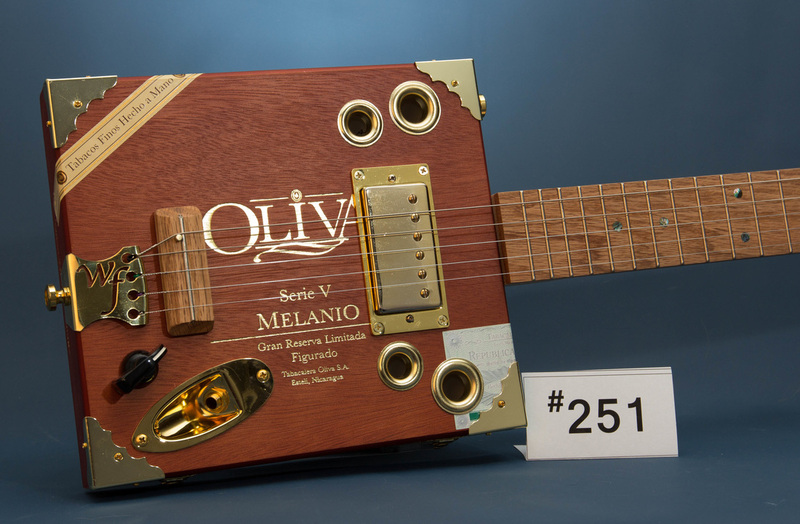 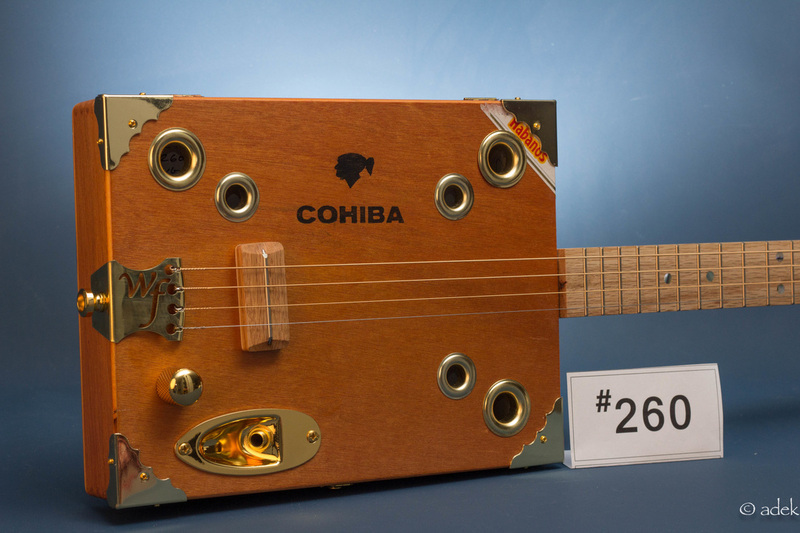 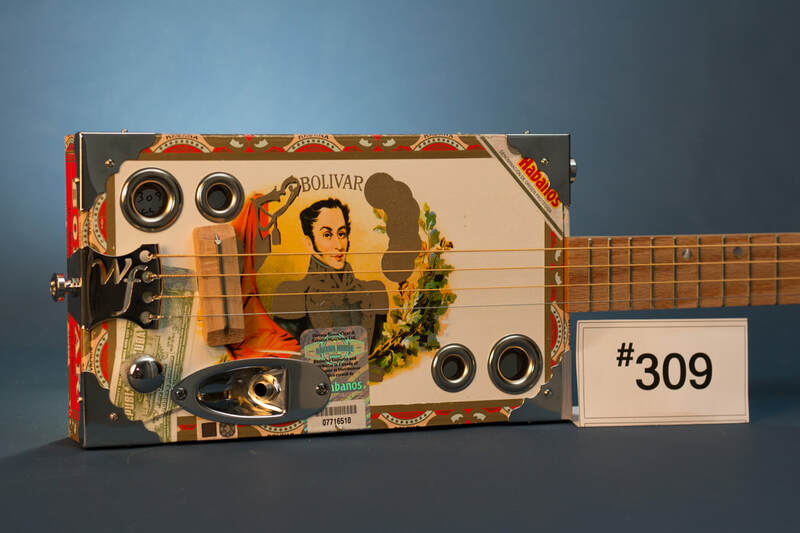 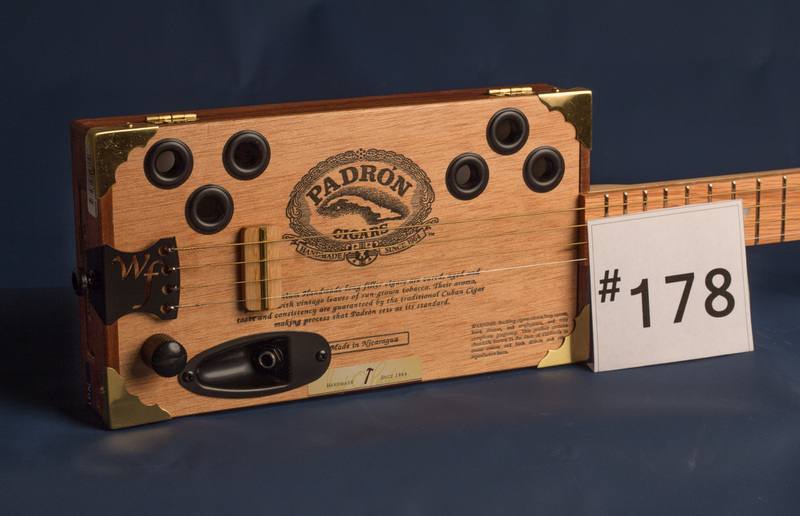 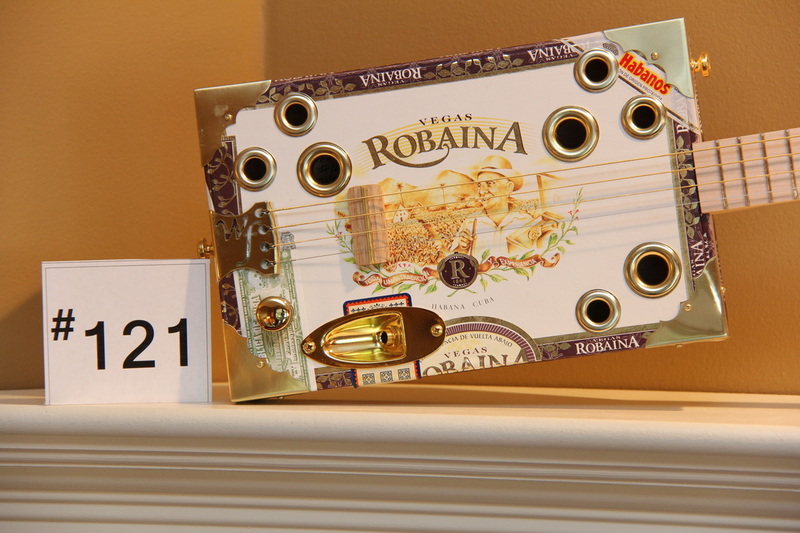 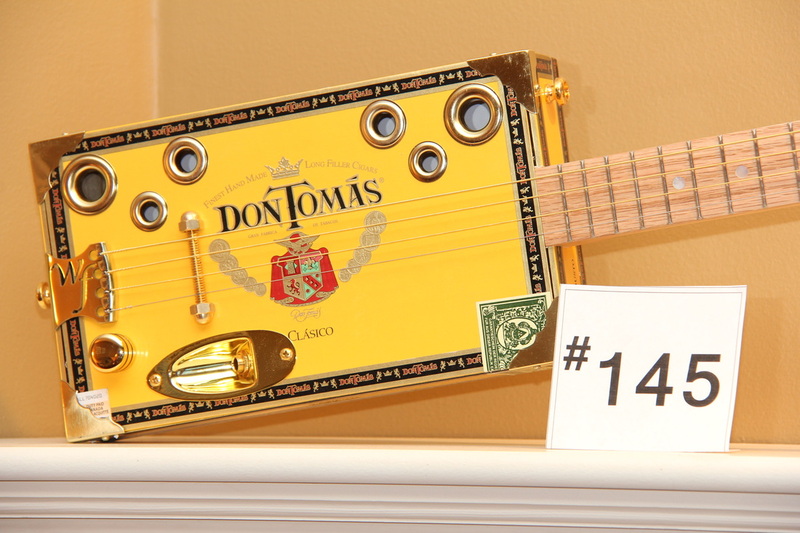 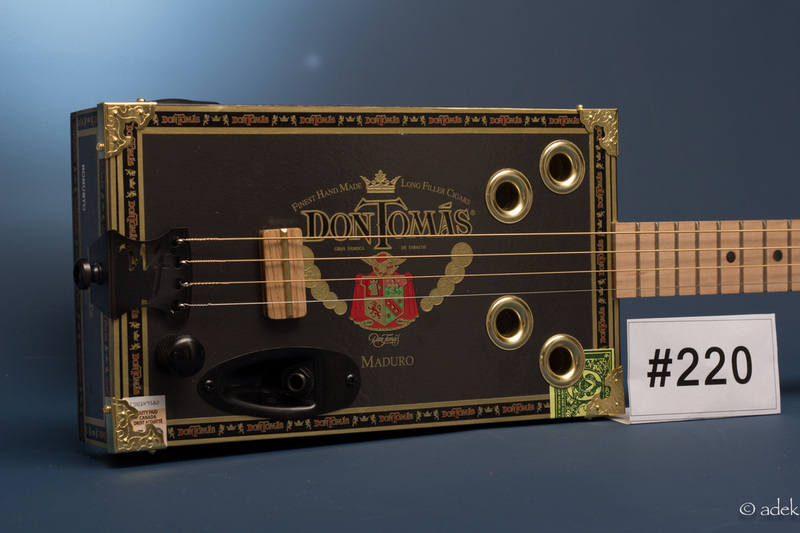 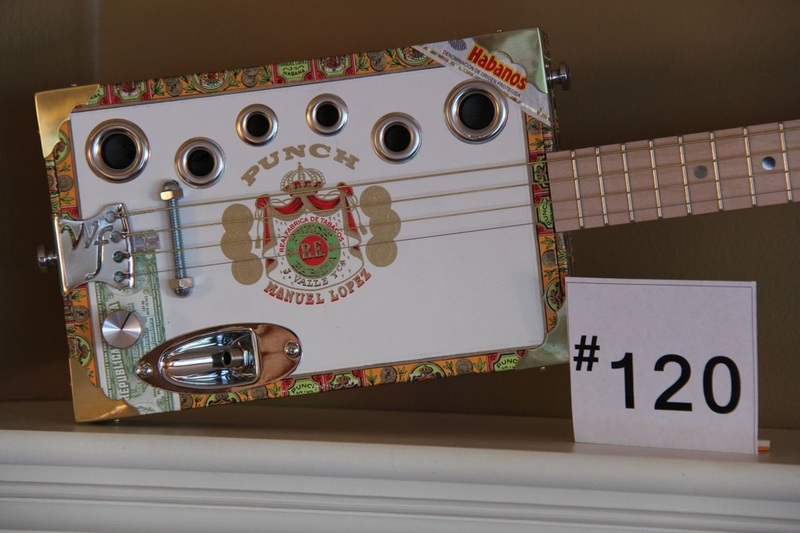 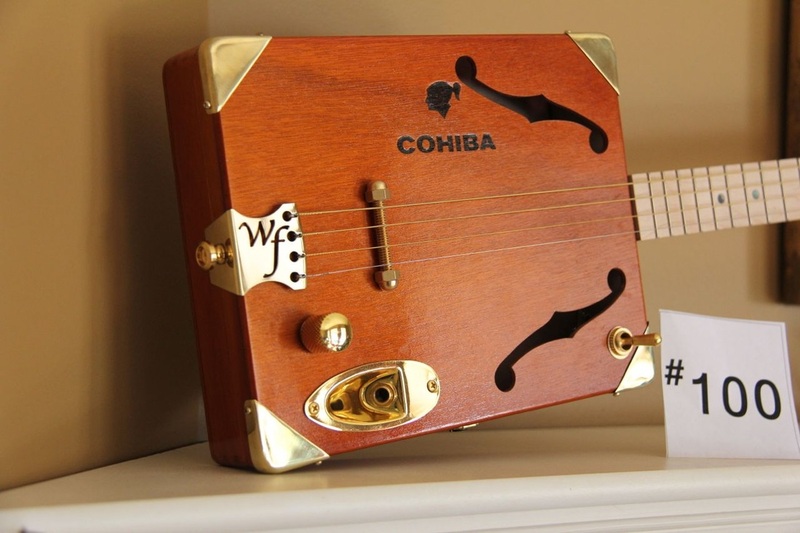 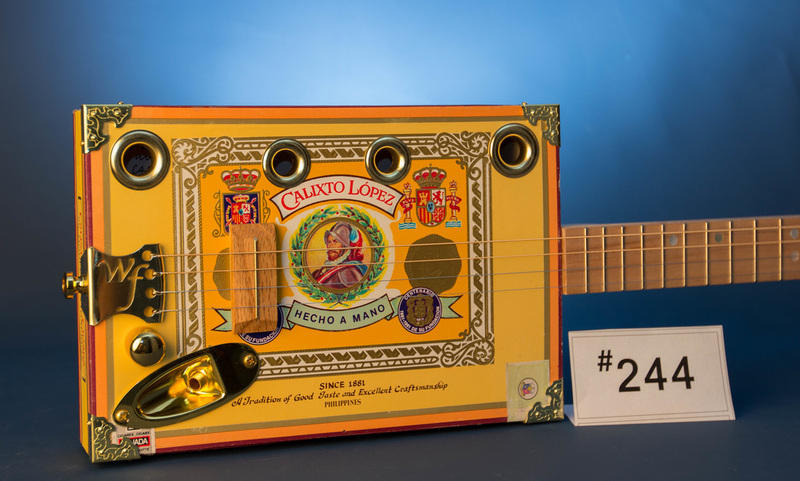 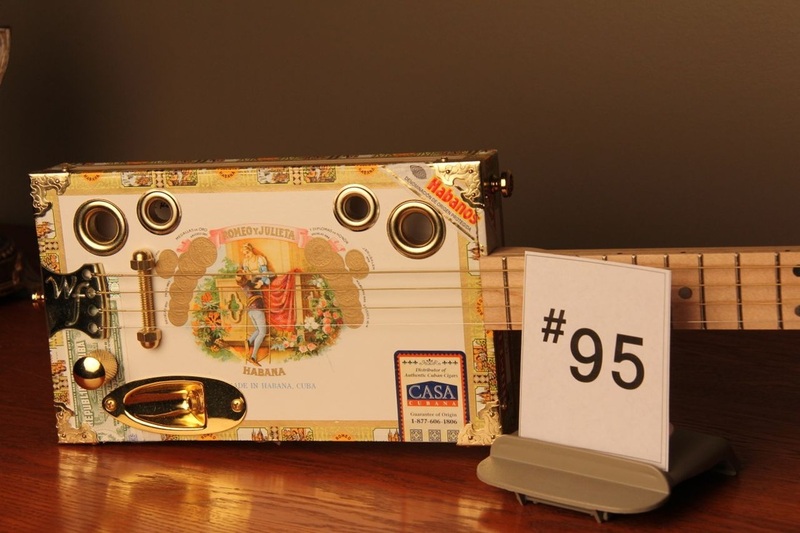 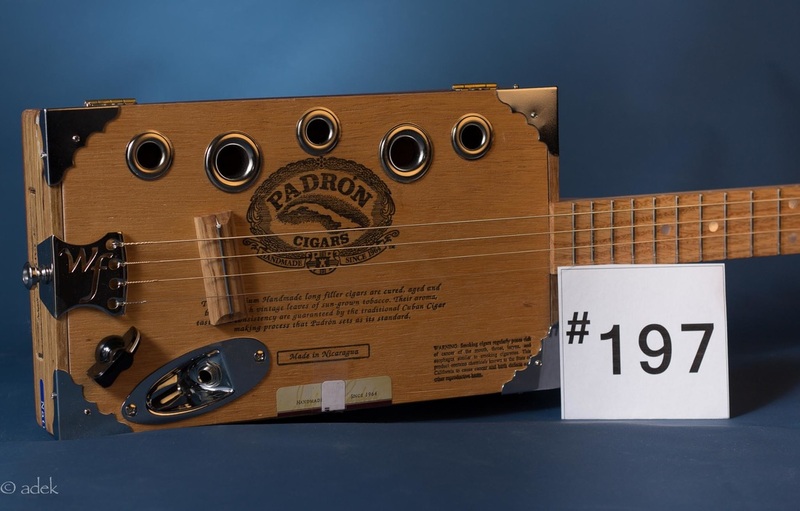 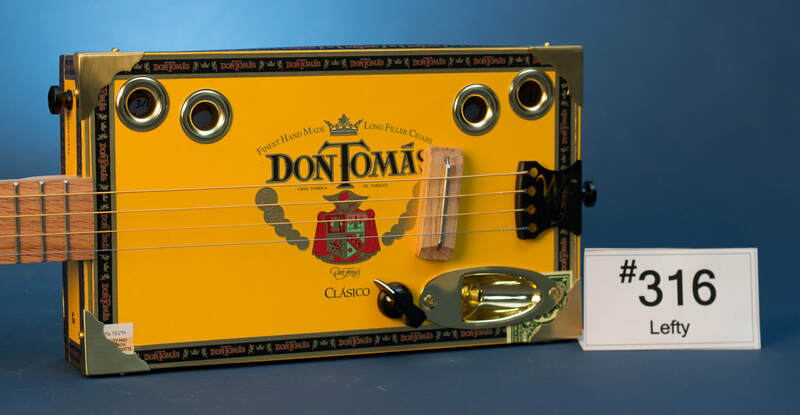 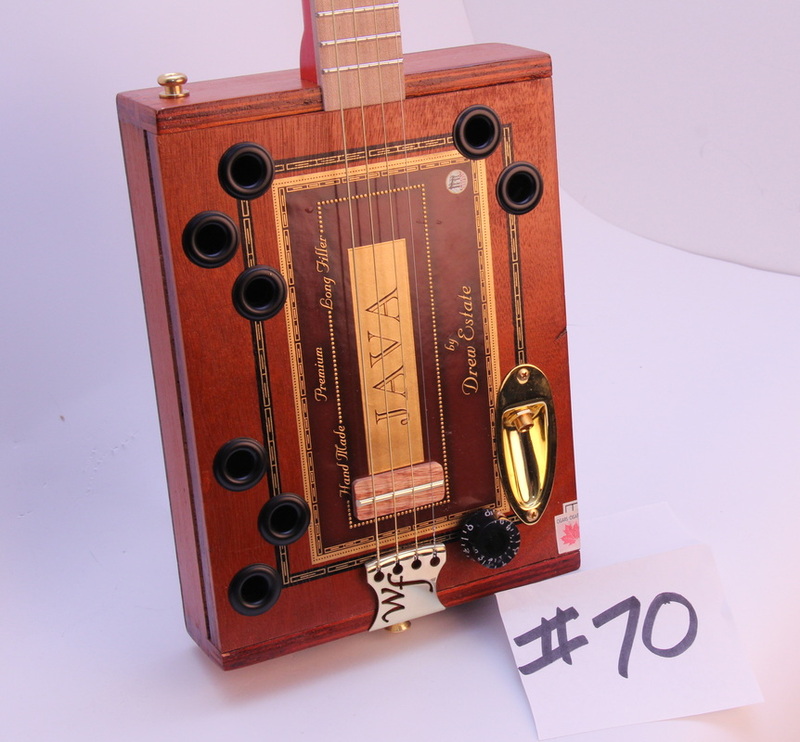 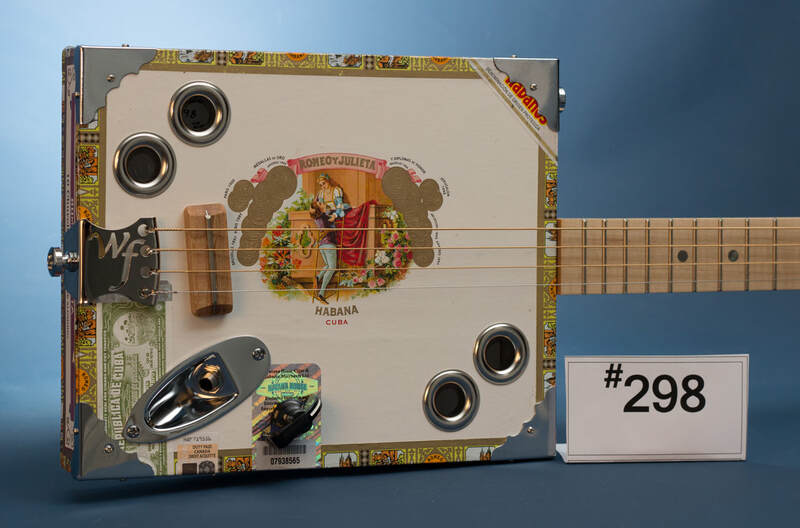 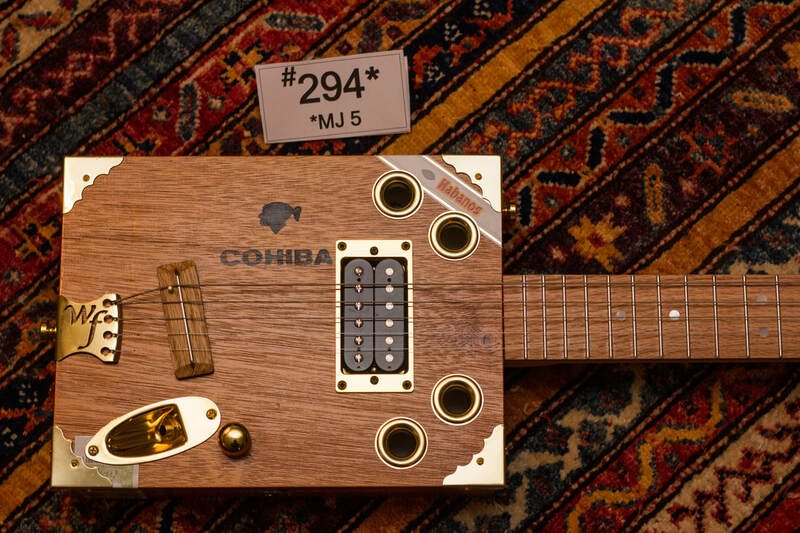 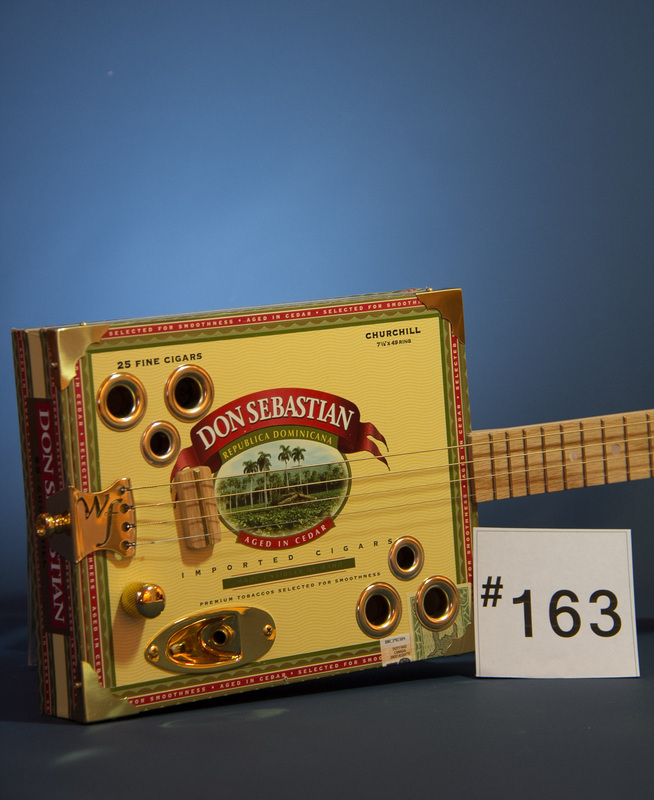 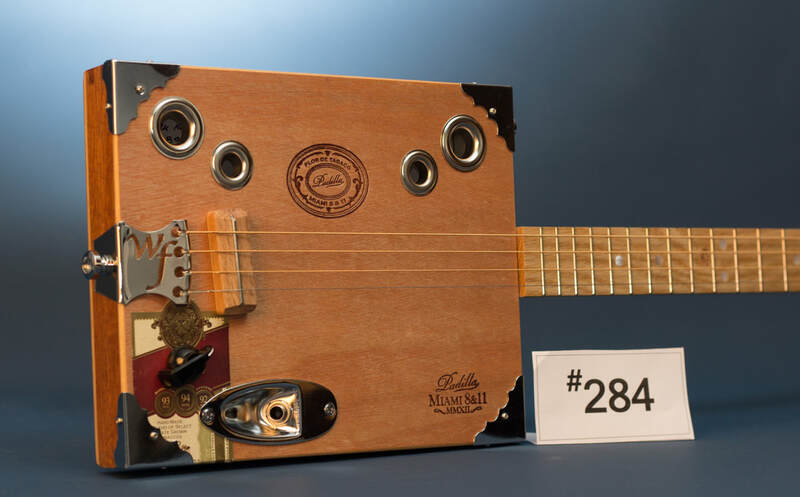 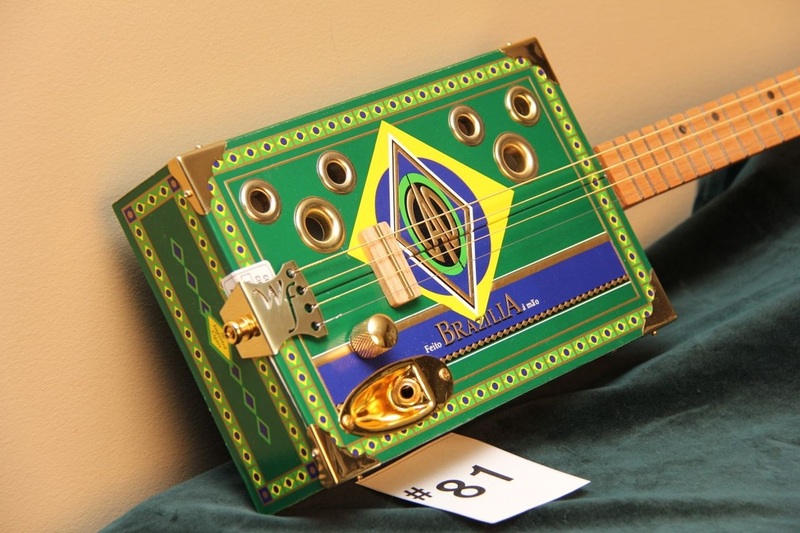 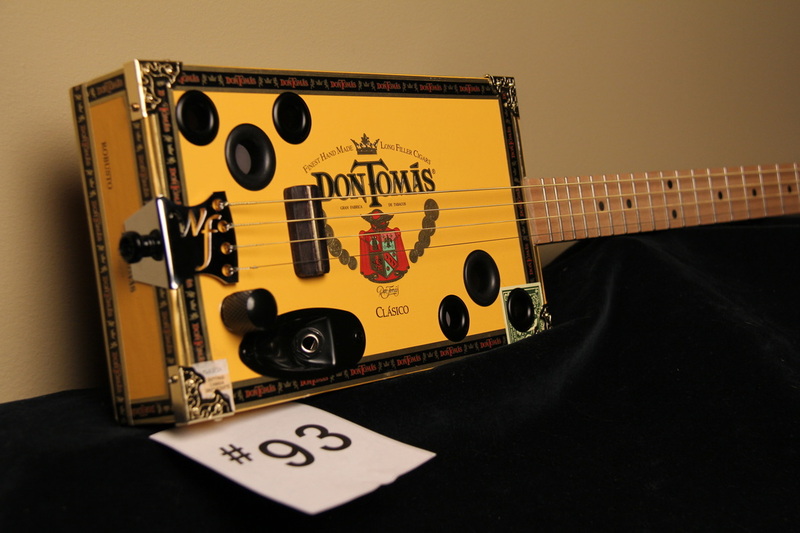 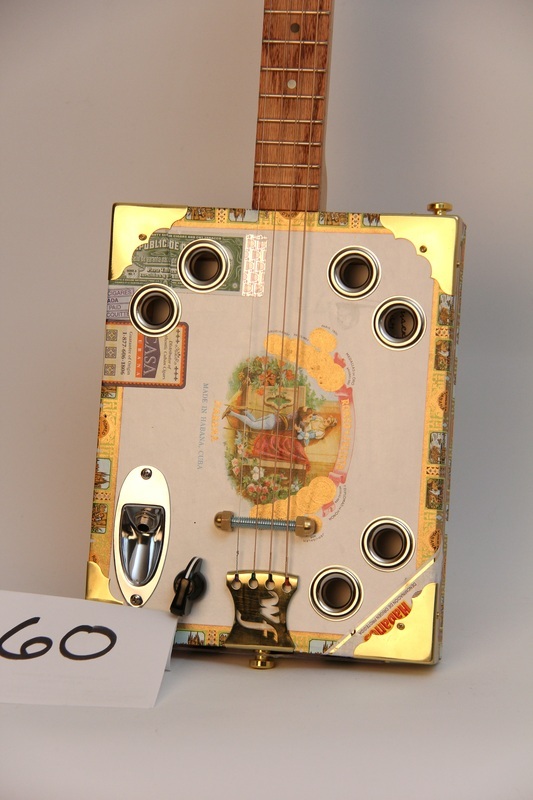 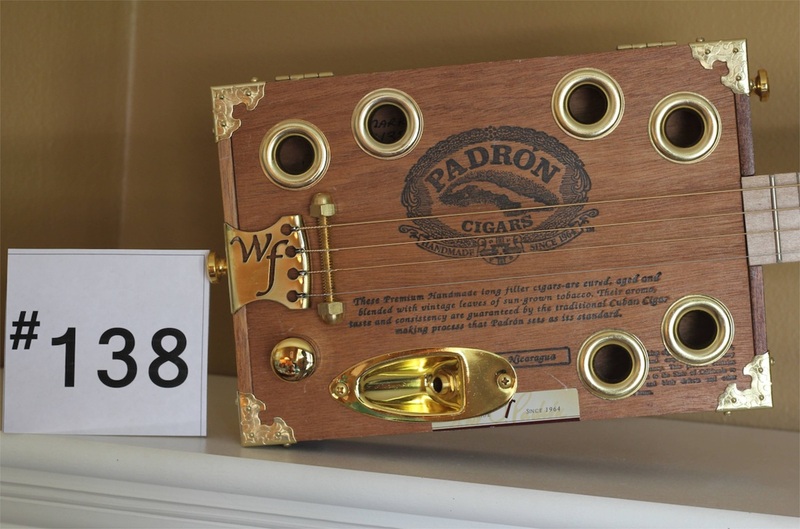 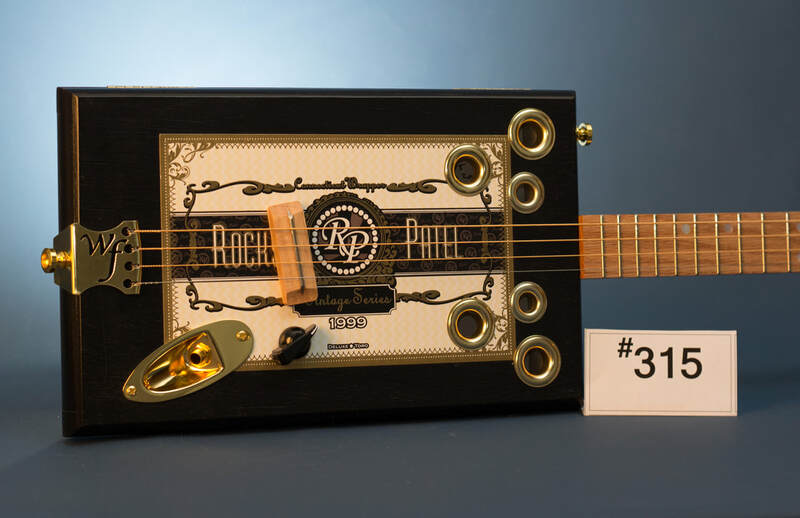 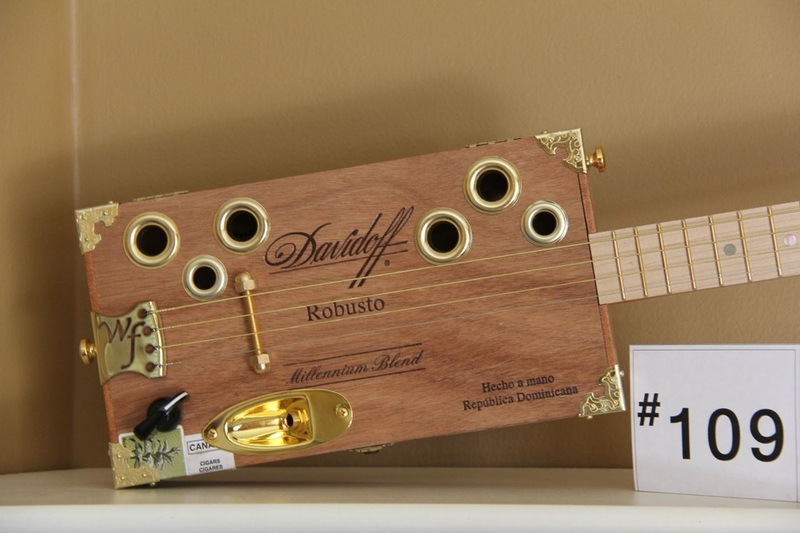 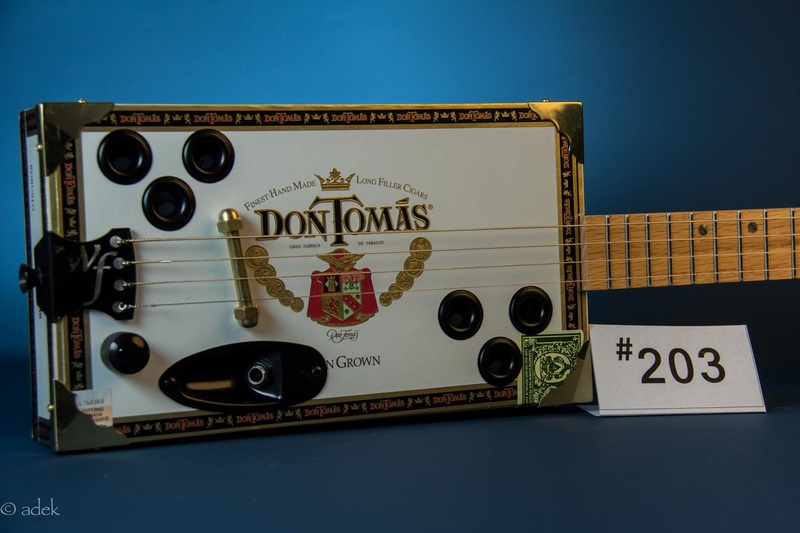 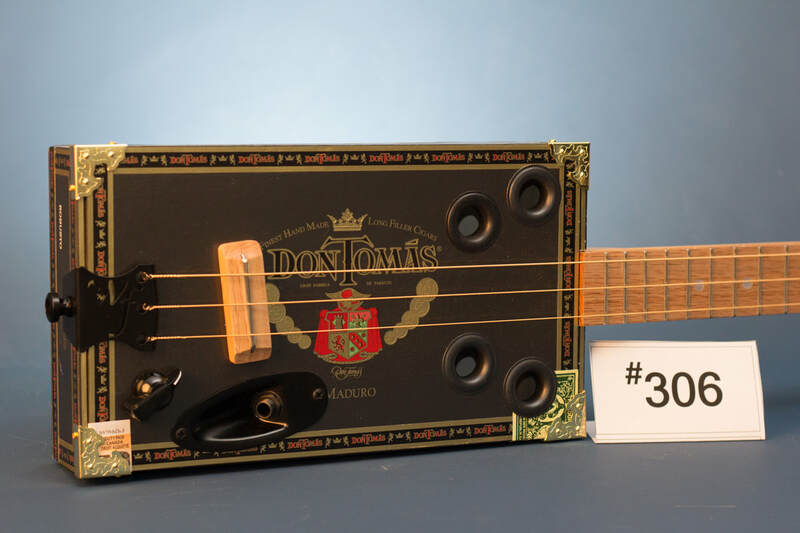 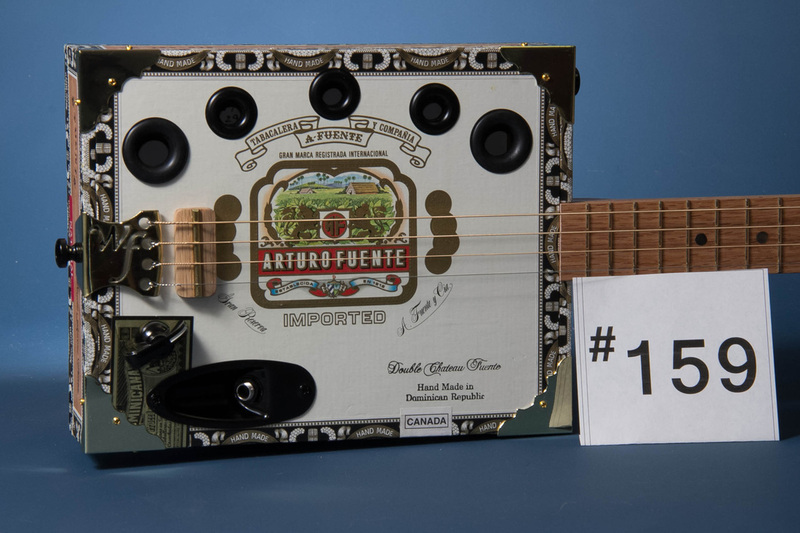 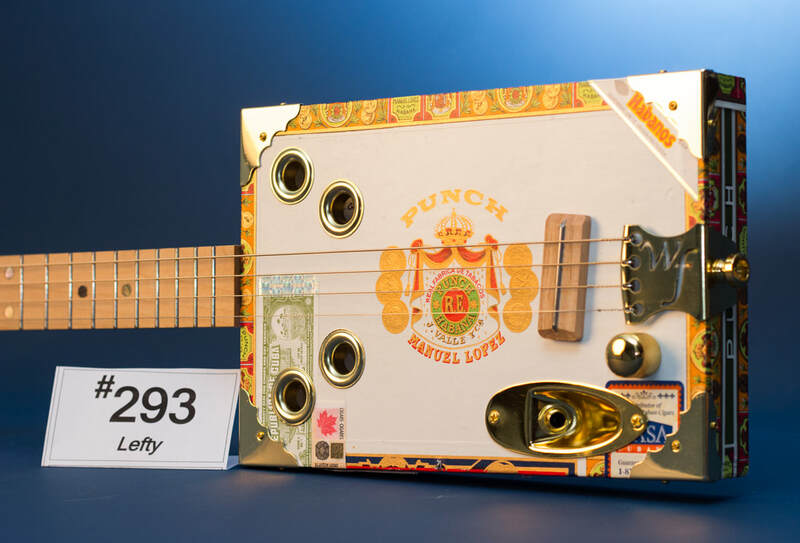 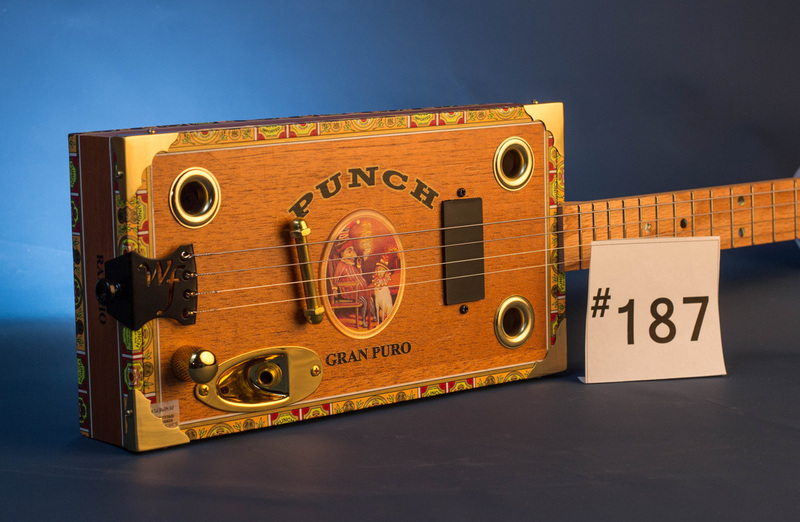 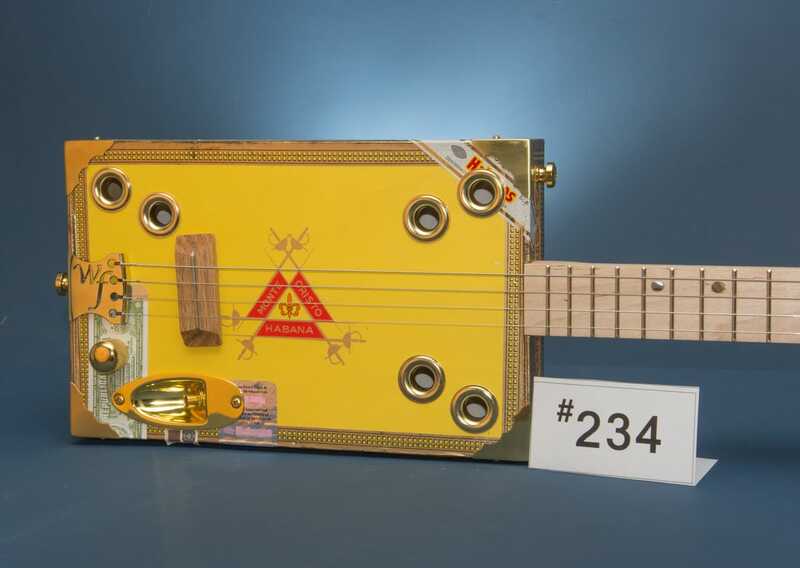 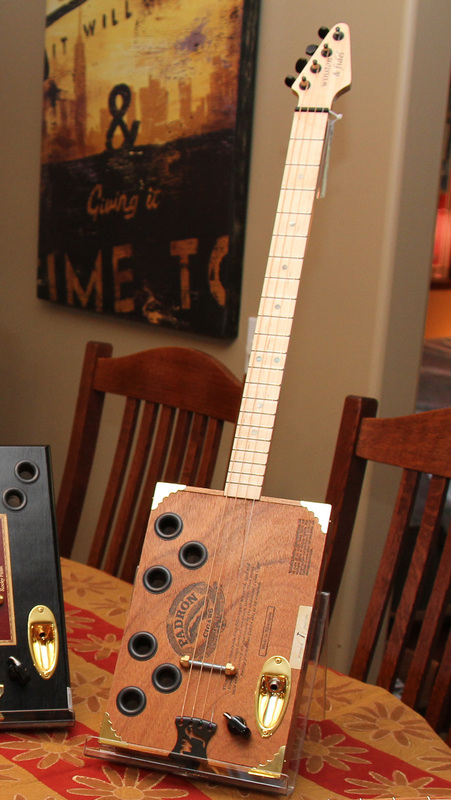 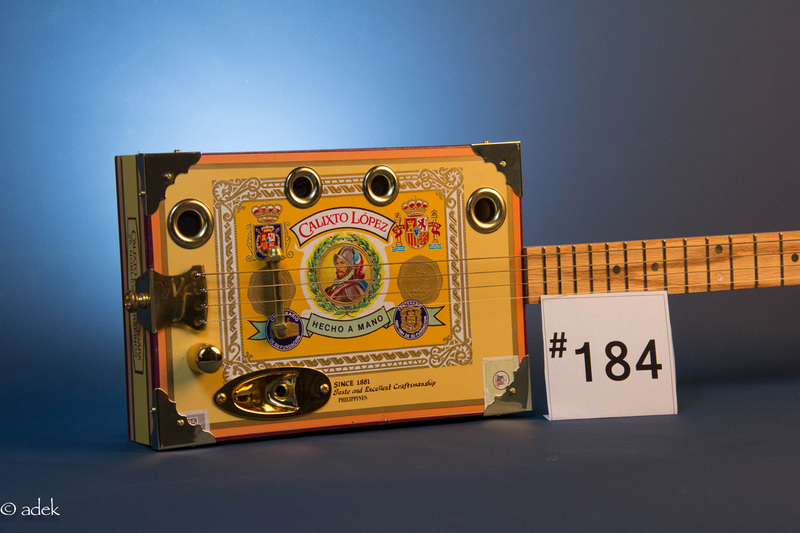 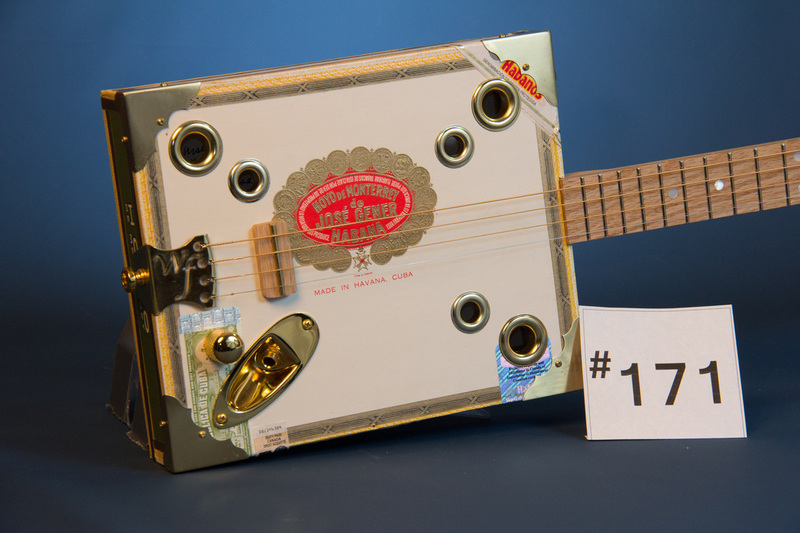 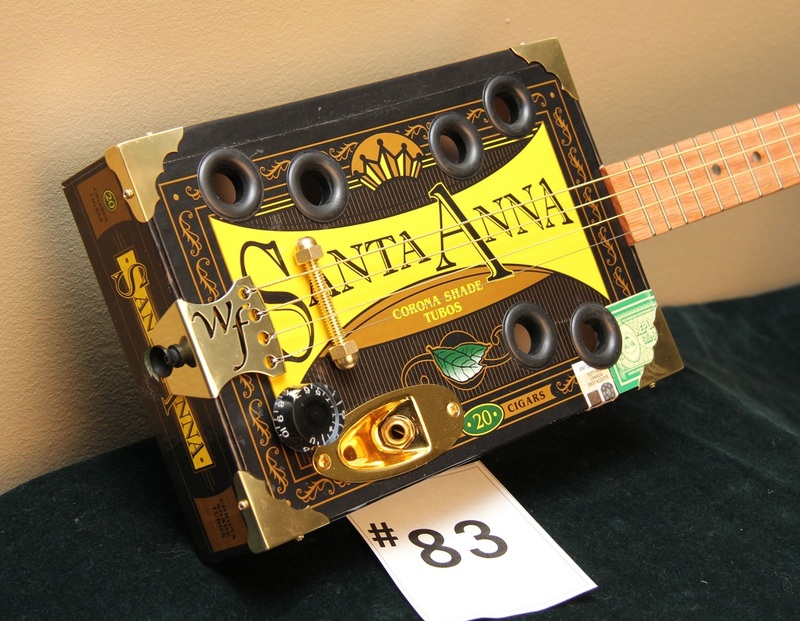 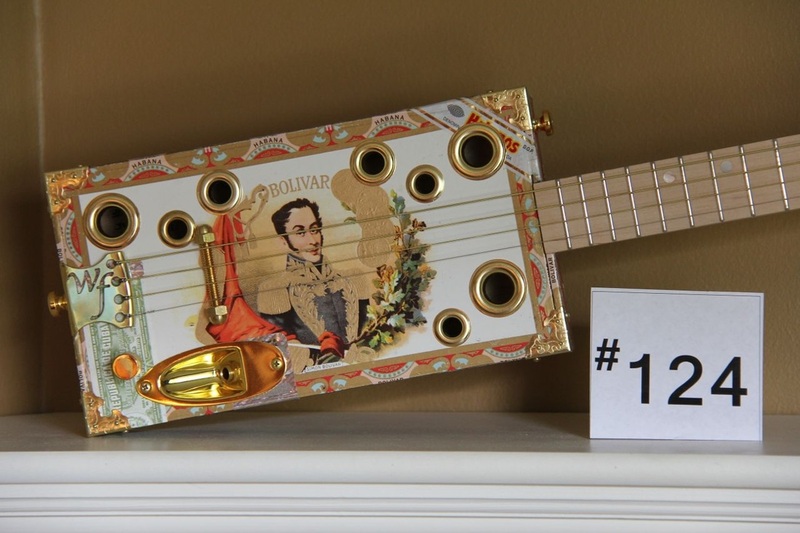 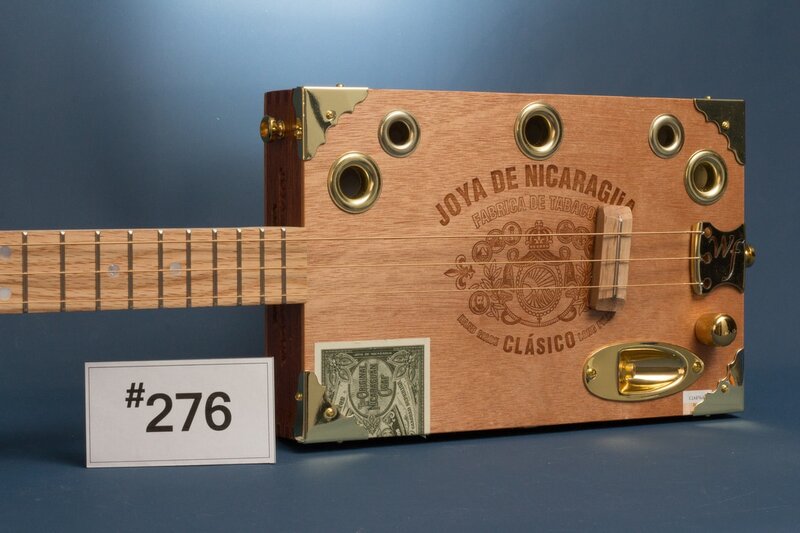 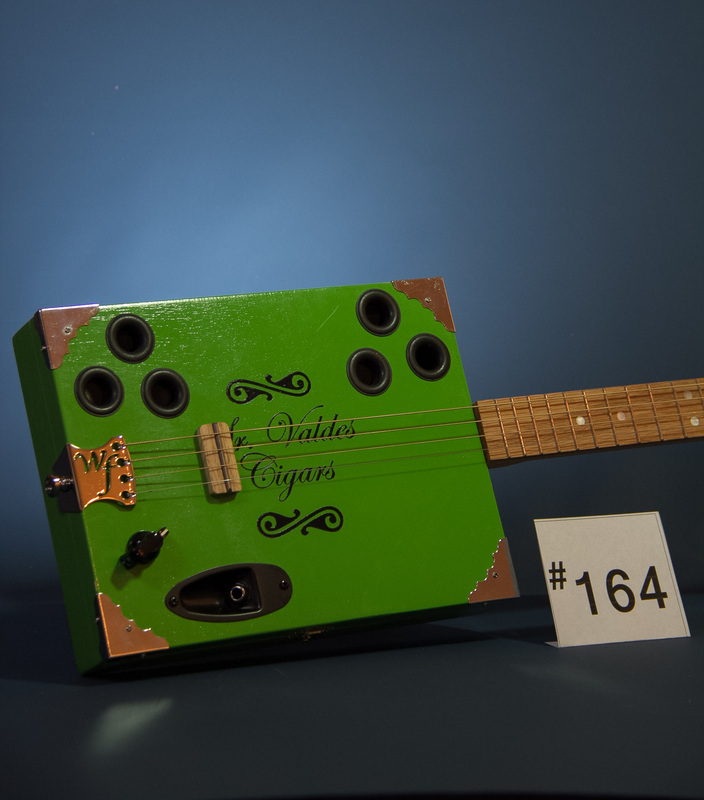 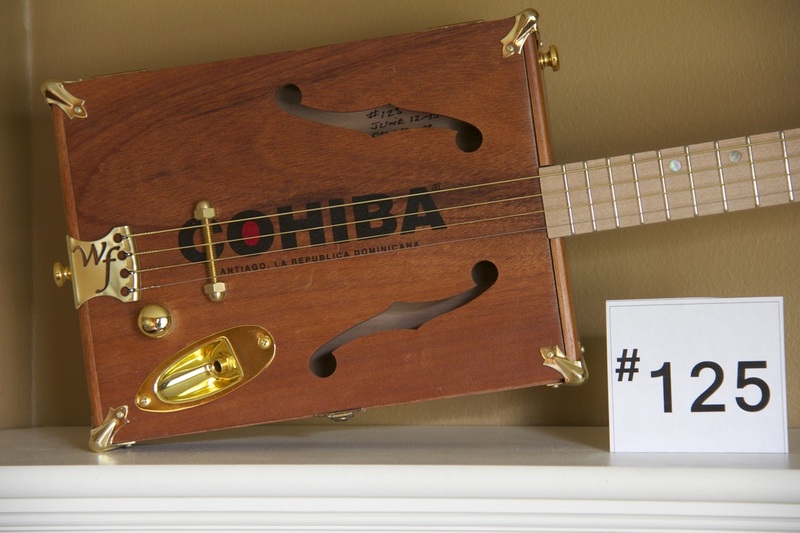 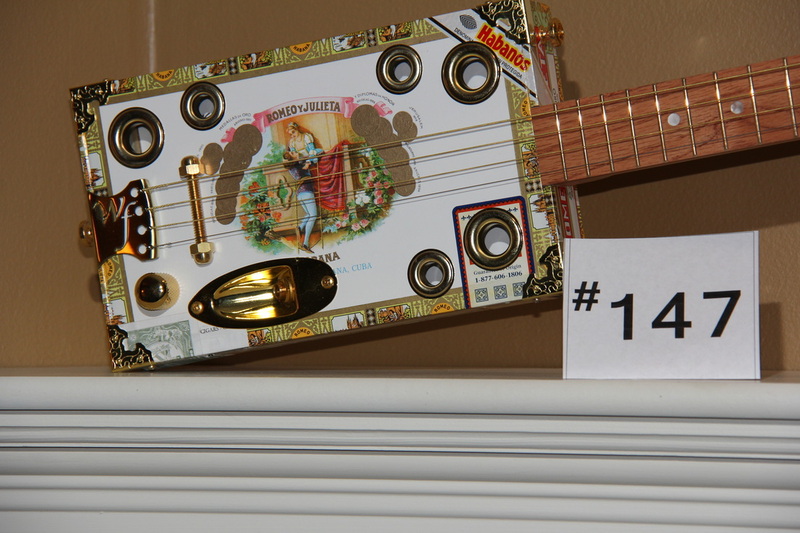 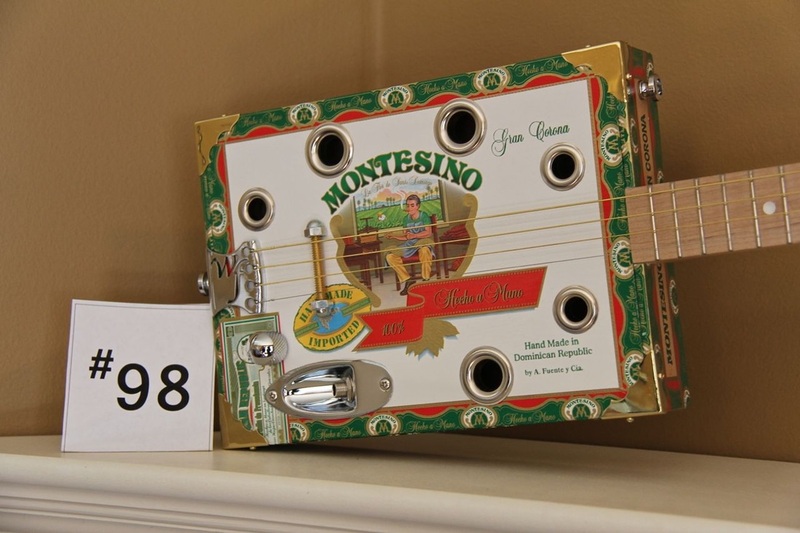 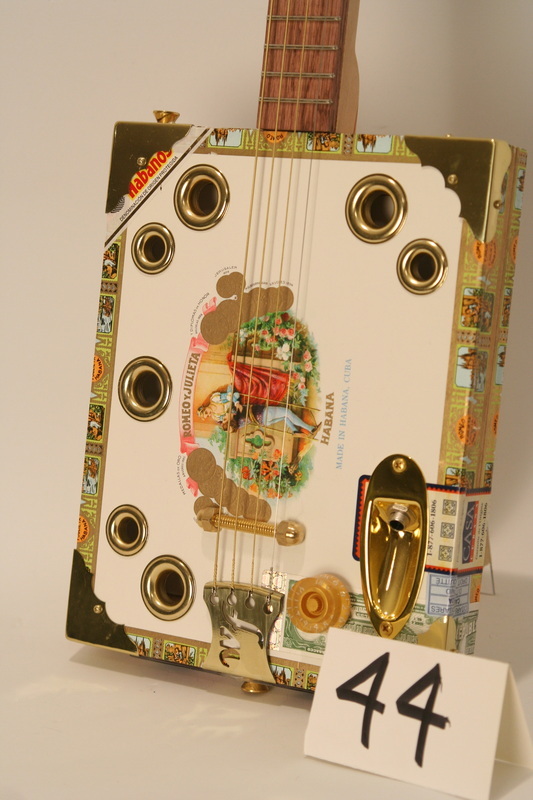 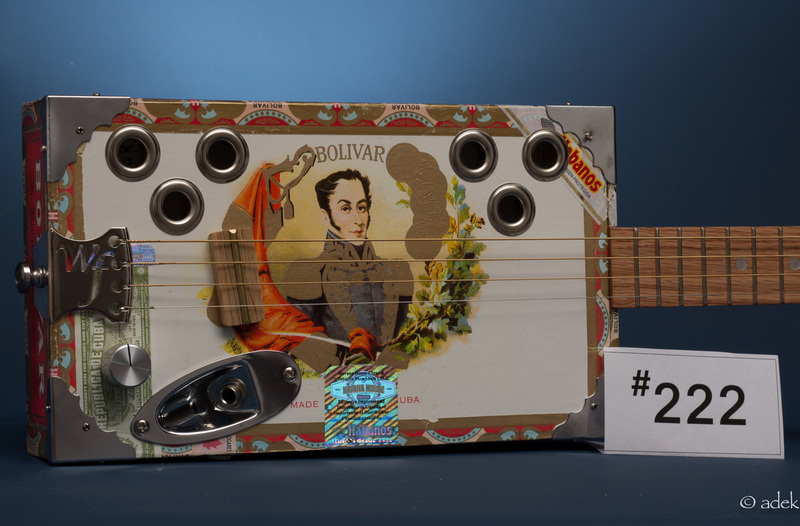 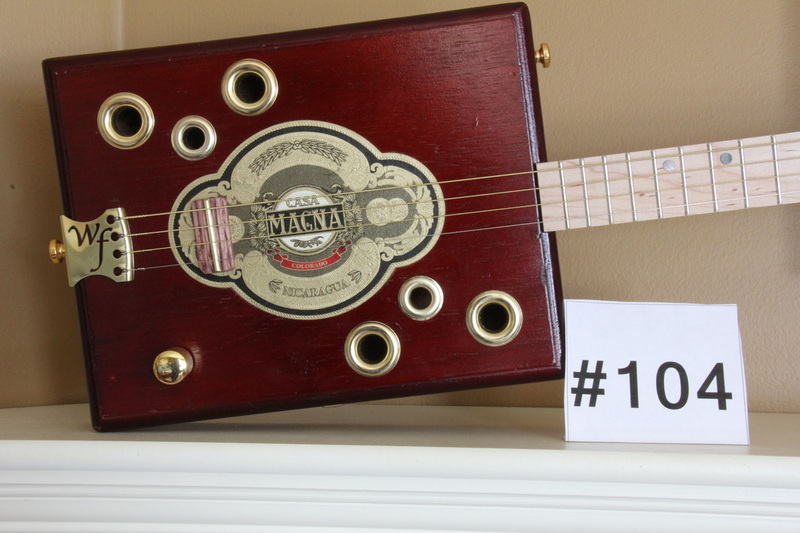 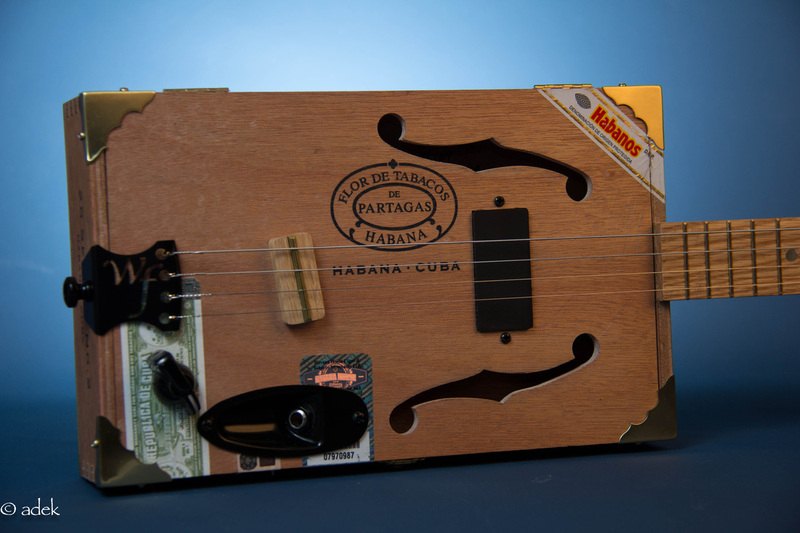 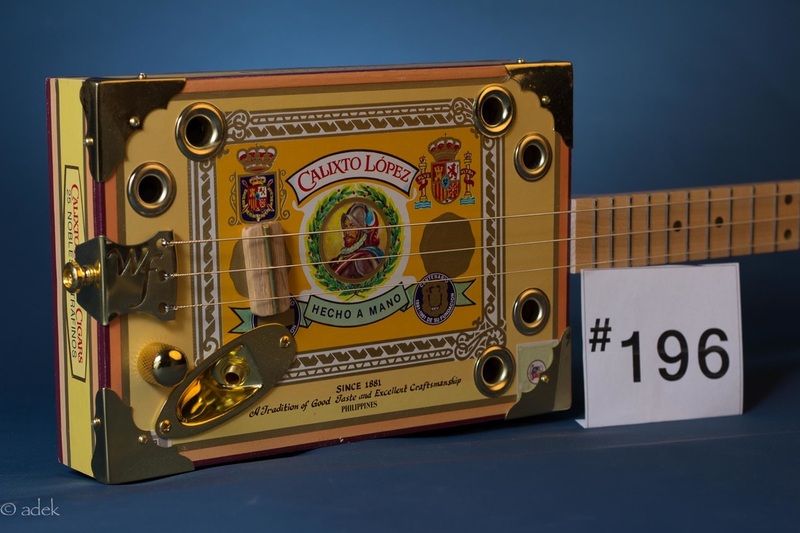 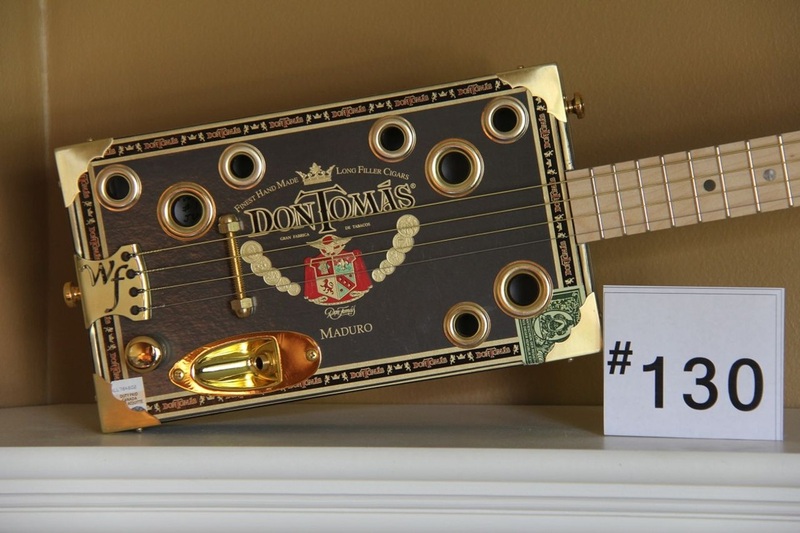 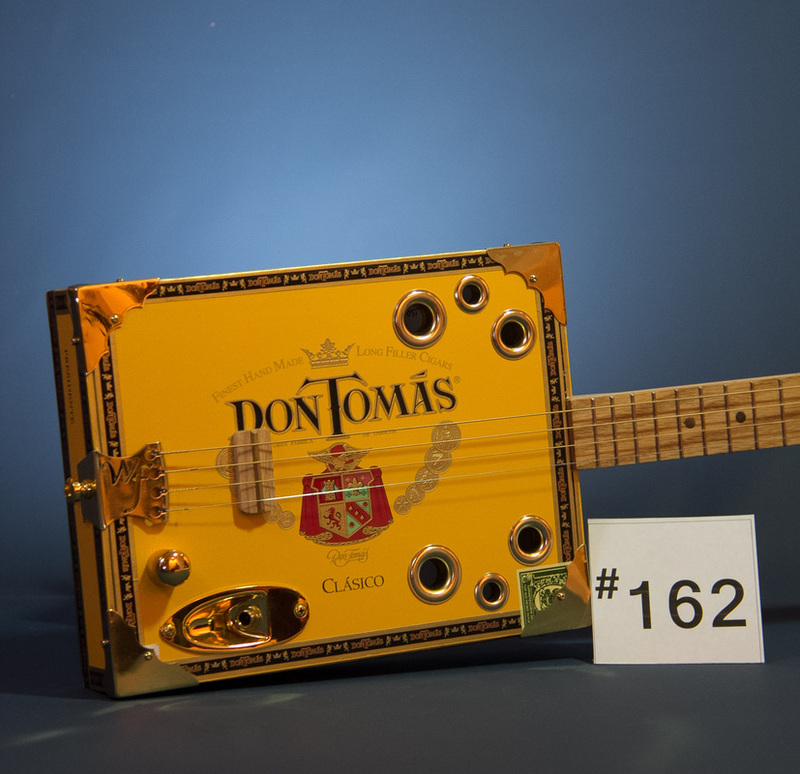 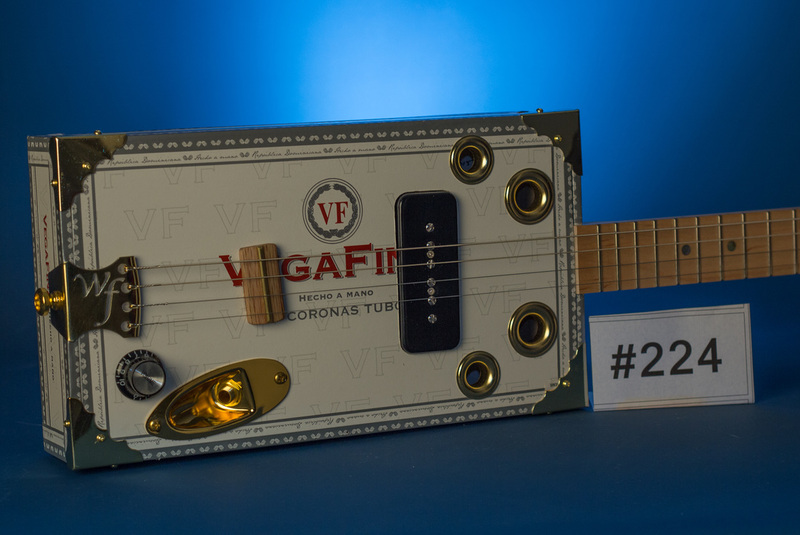 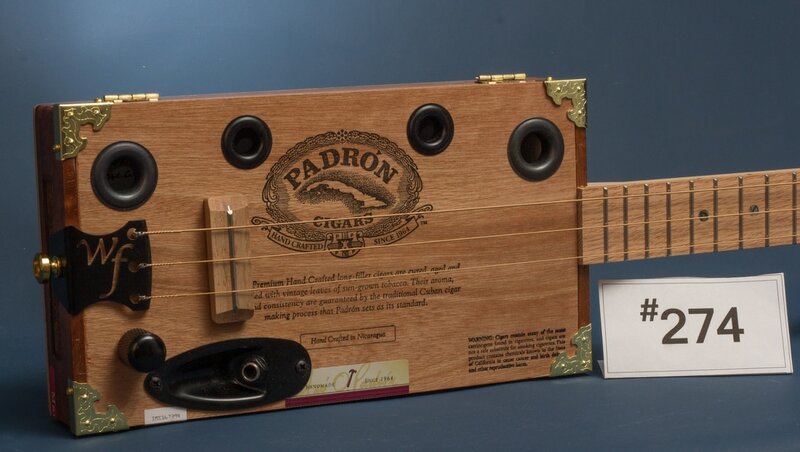 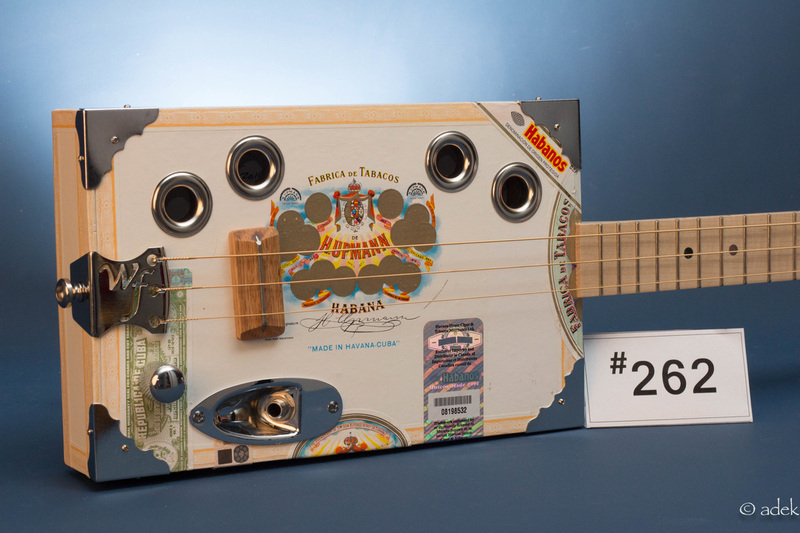 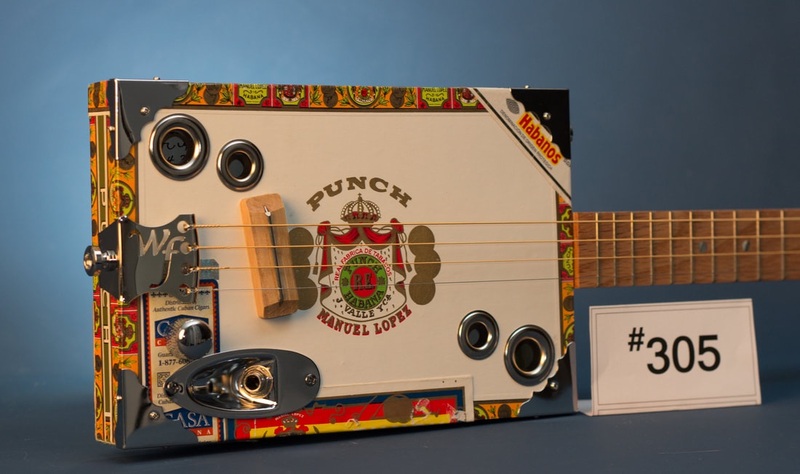 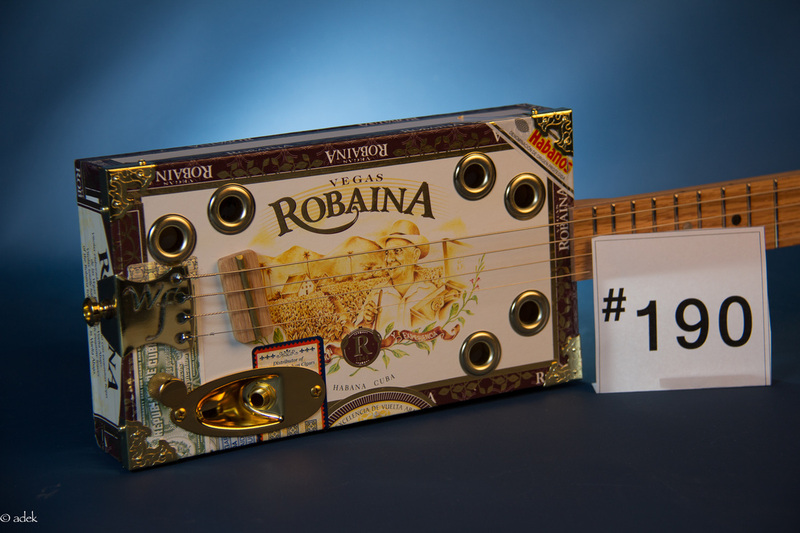 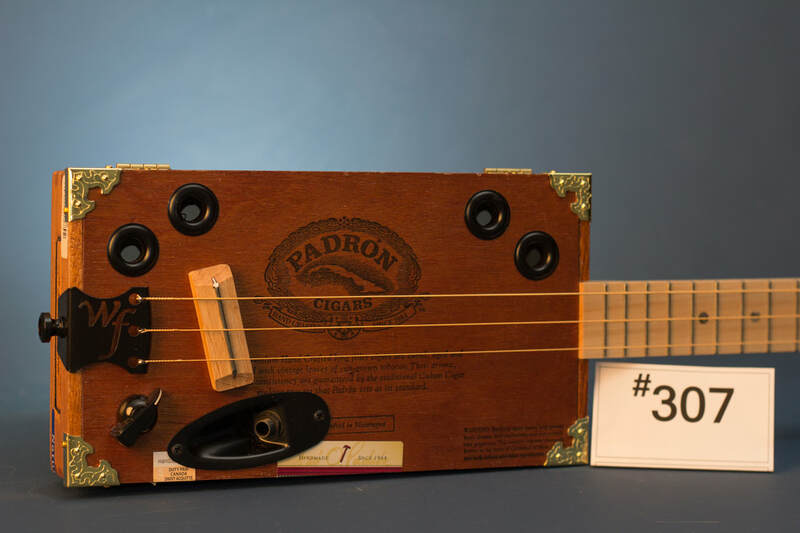 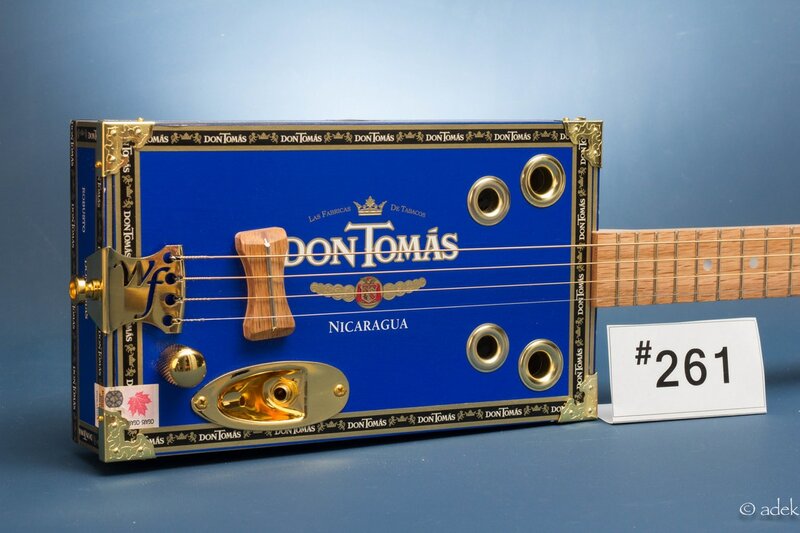 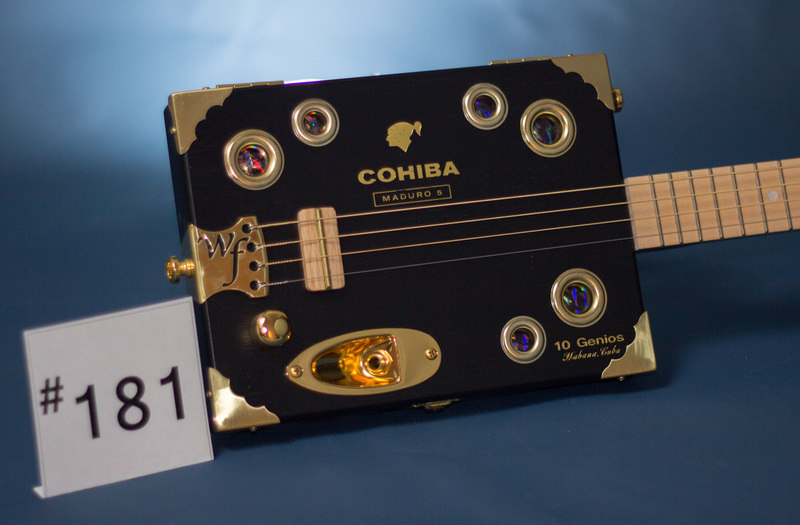 ​​All cigar box guitars have a 25.5 inch nut-to-bridge measurement, incorporating 21 frets. 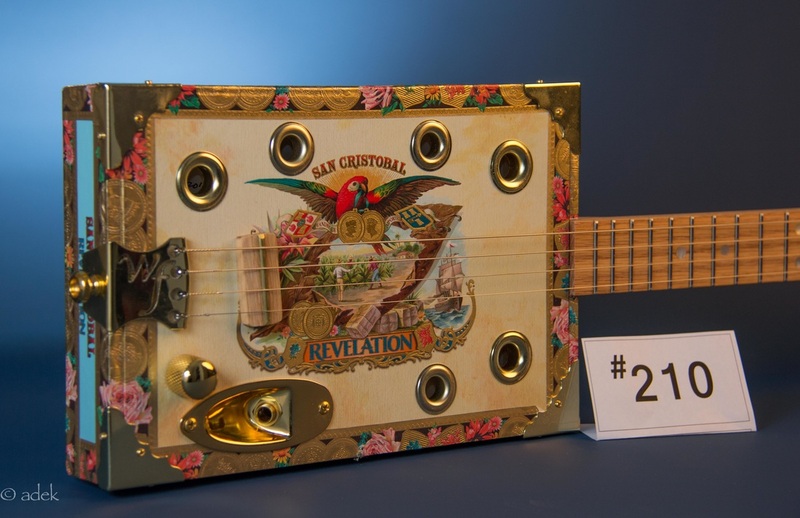 Please keep in mind that all guitars are created from recycled cigar boxes, so there may be handling-induced blemishes and flaws which are beyond my control. 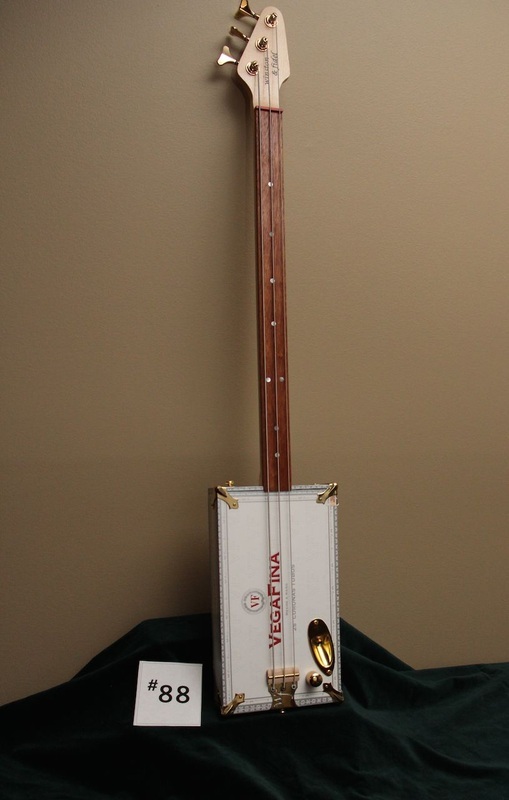 We also carry custom soft-sided padded gig bags. 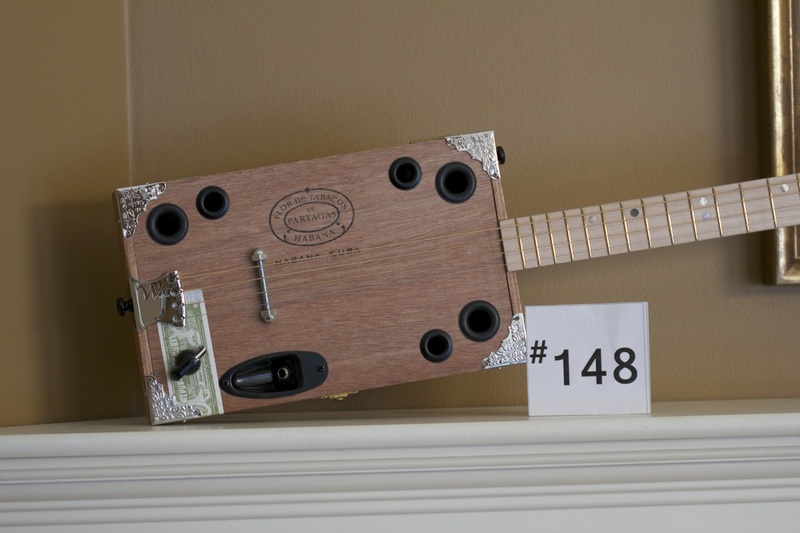 Pictures to come. 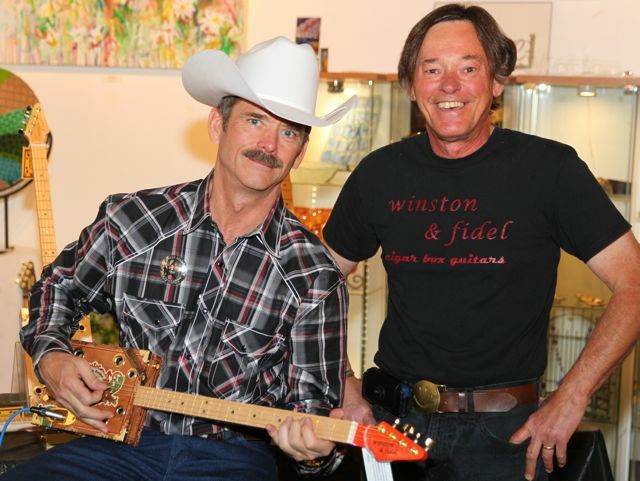 Contact me for more information at winstonandfidel@shaw.ca. 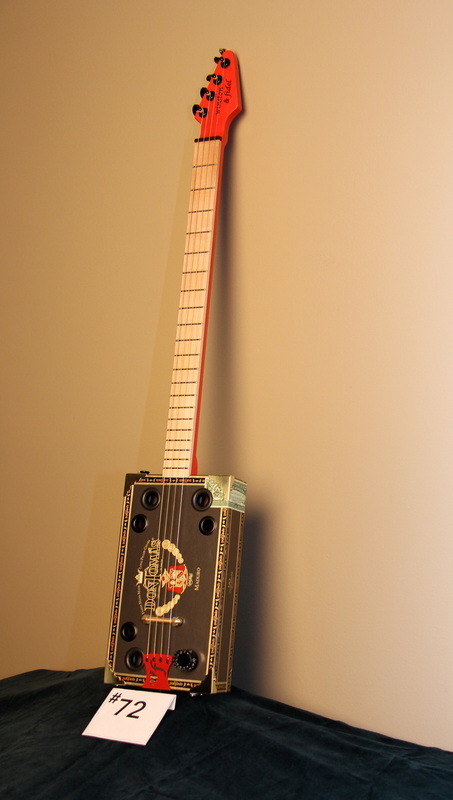 My 300th build. 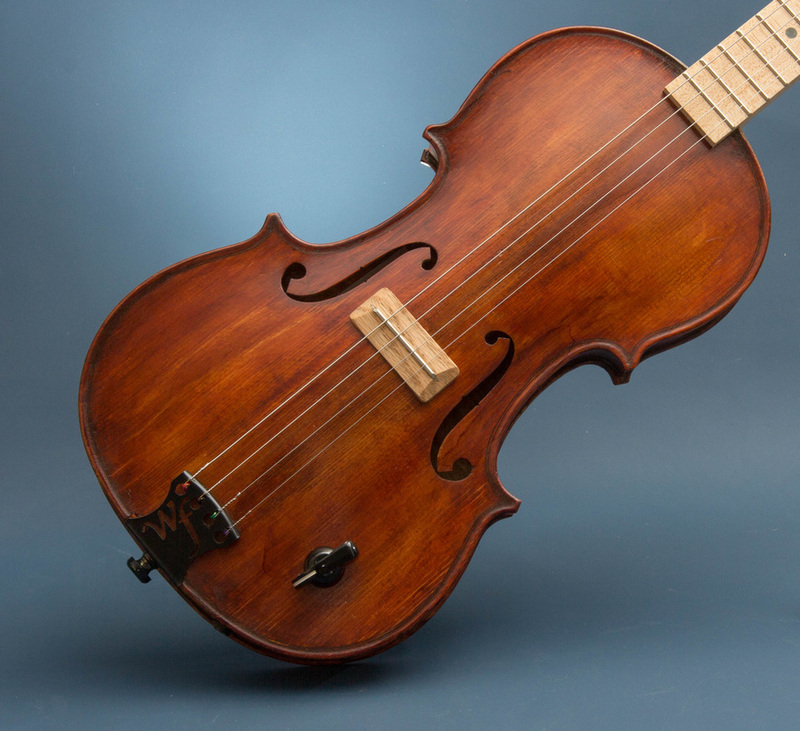 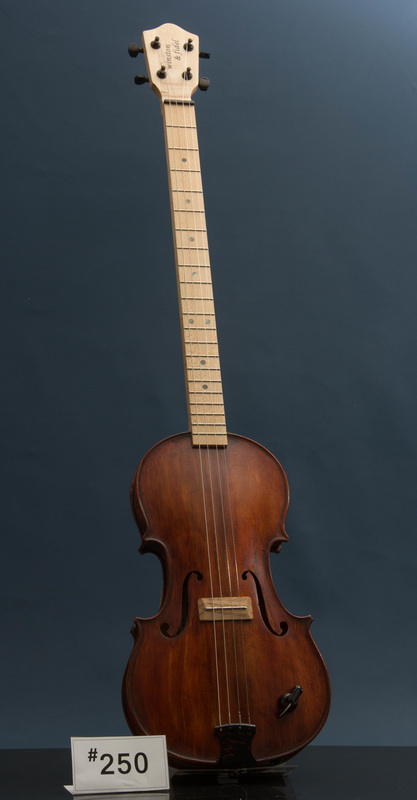 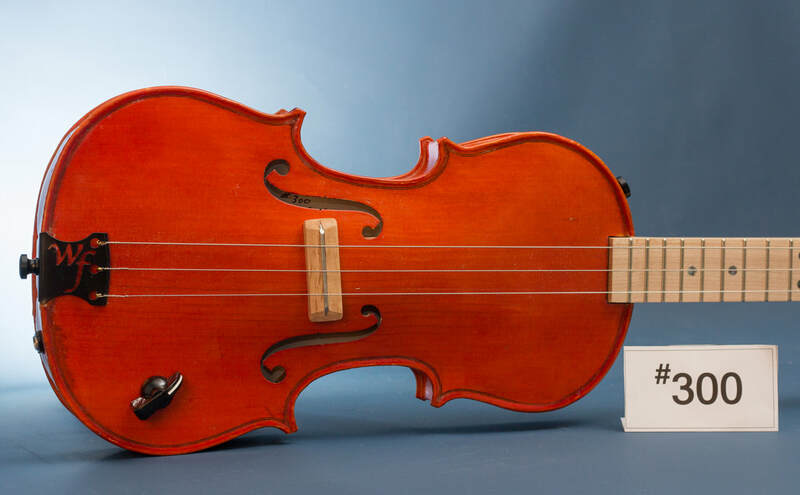 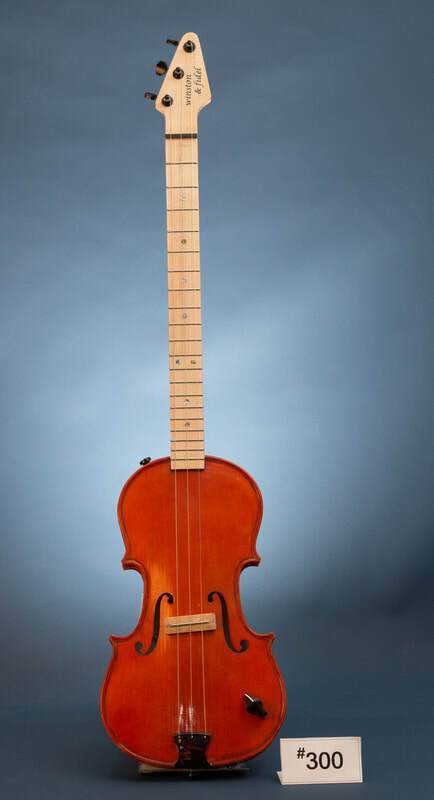 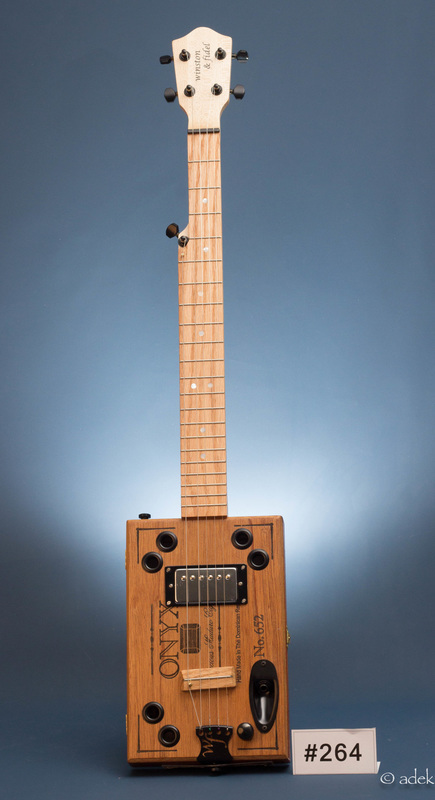 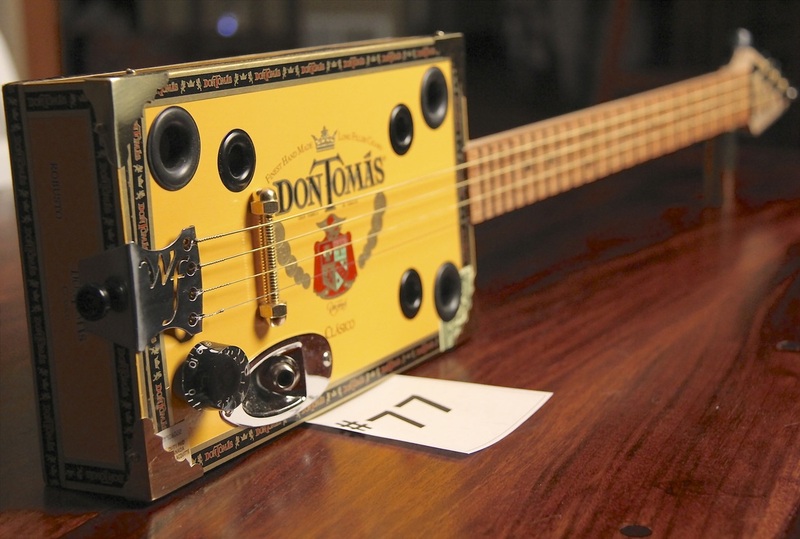 This guitar is made from a salvaged violin body. 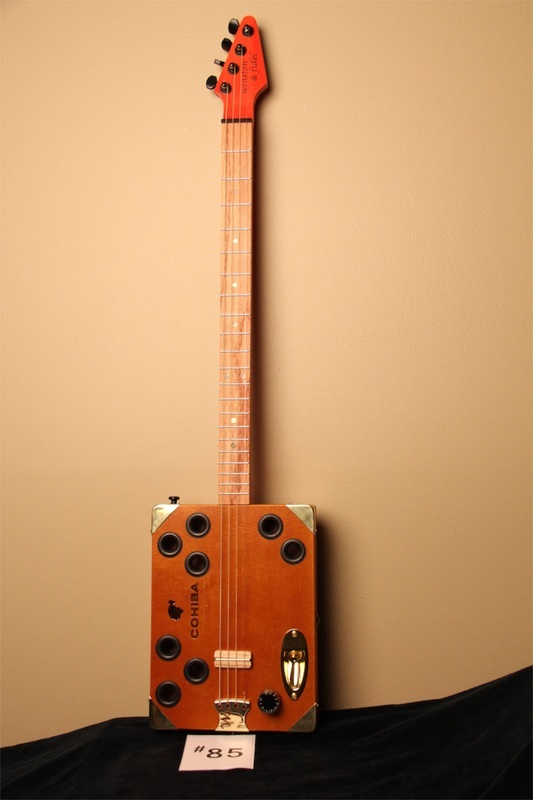 This solid body guitar was a custom order. 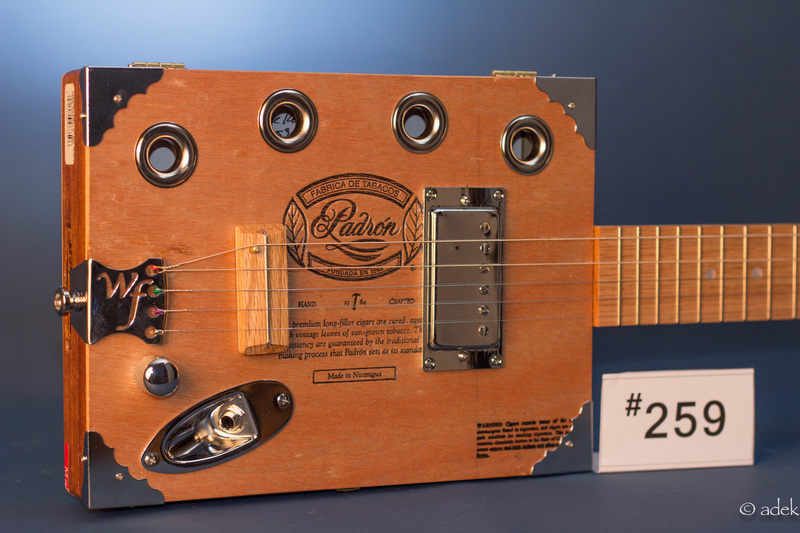 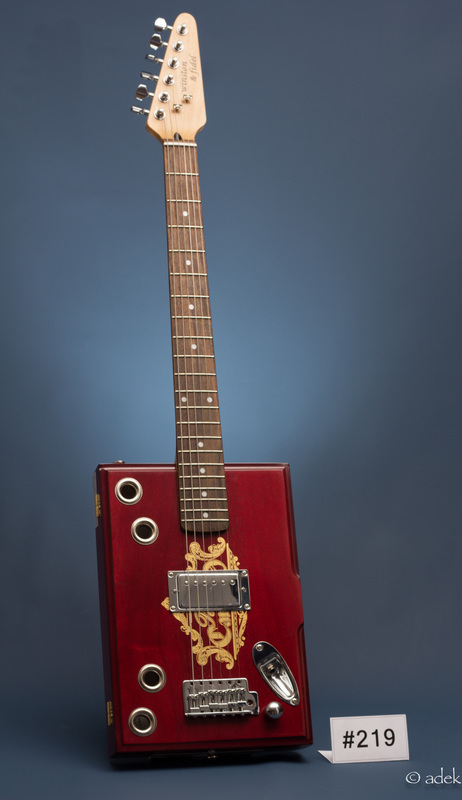 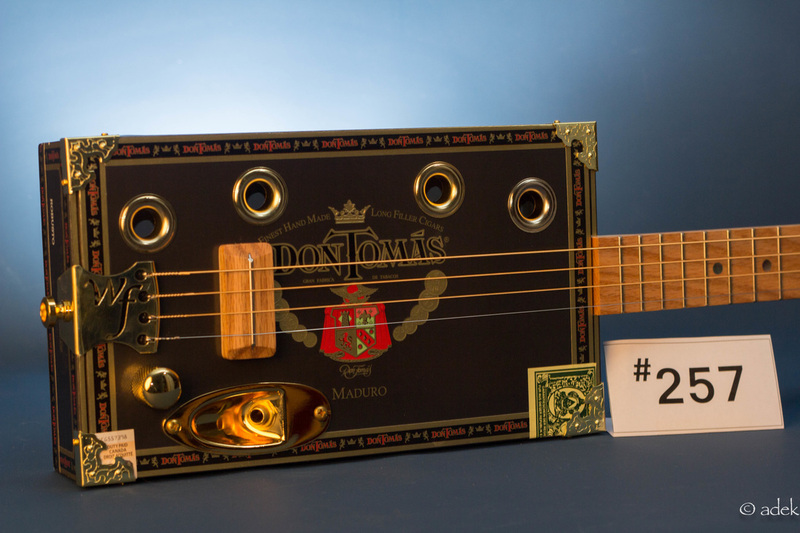 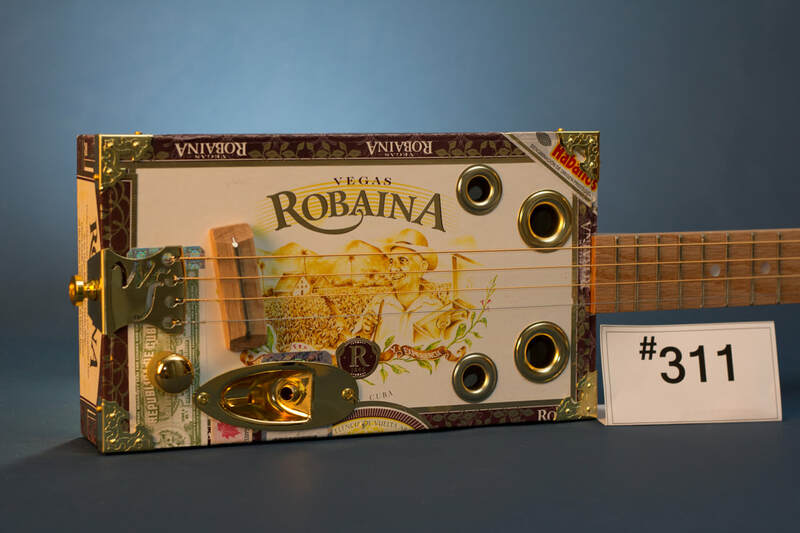 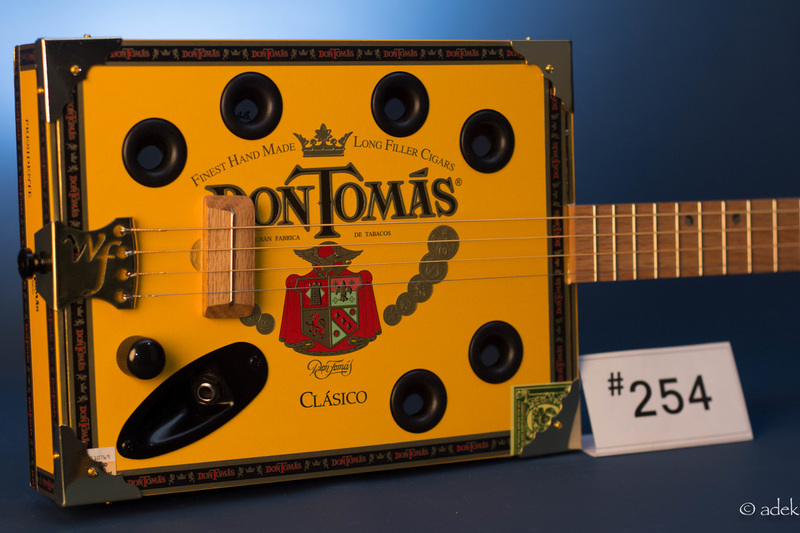 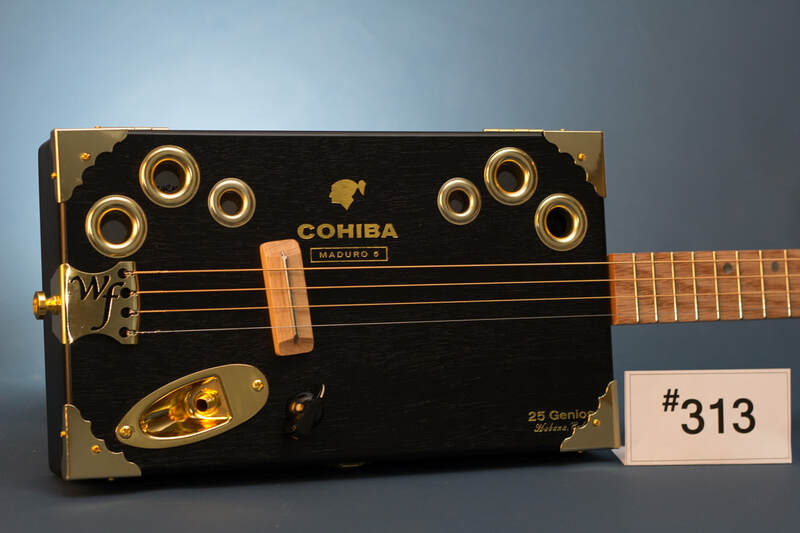 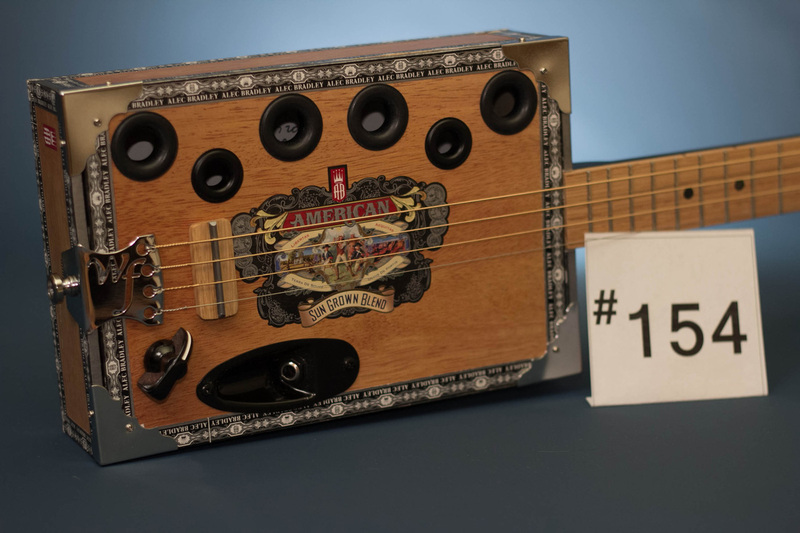 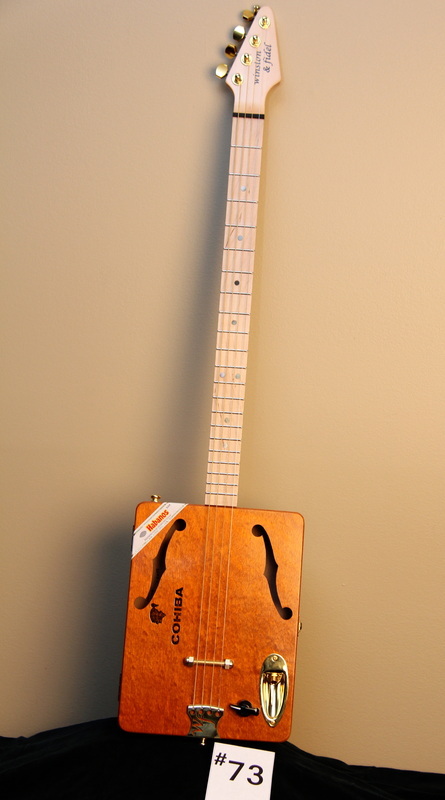 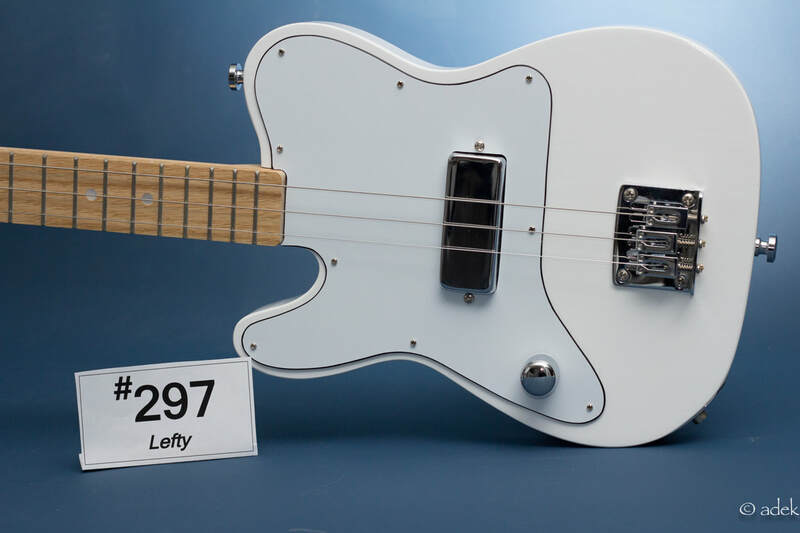 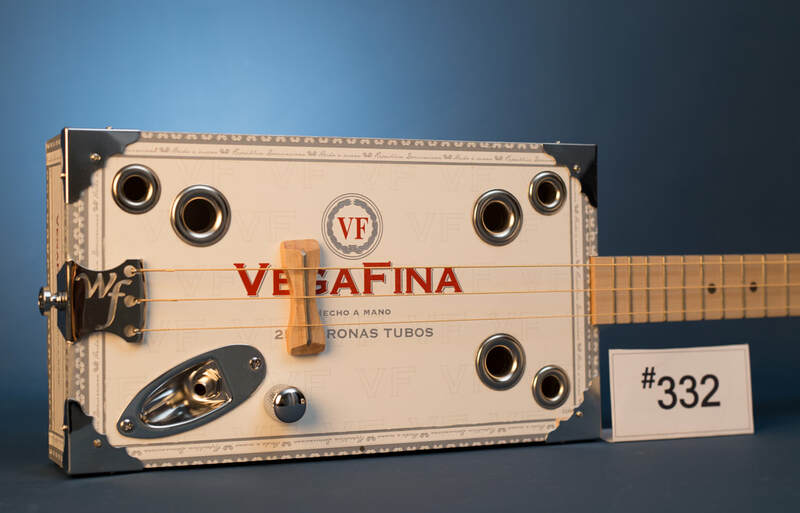 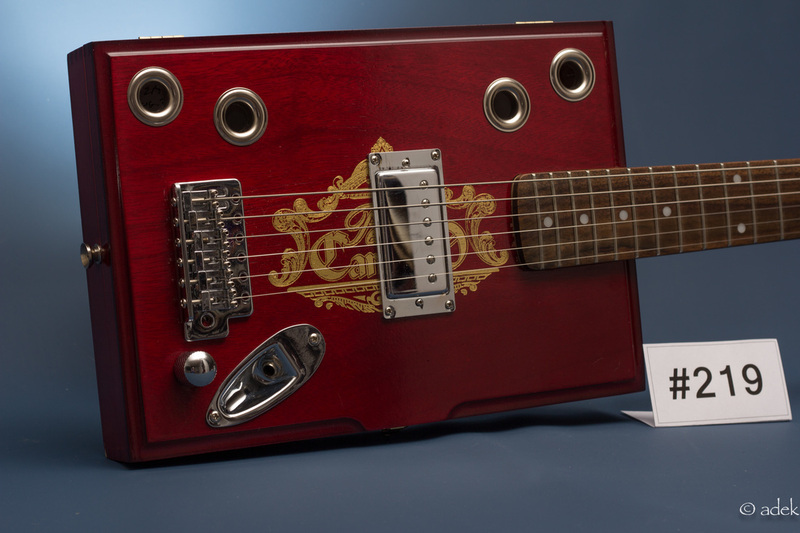 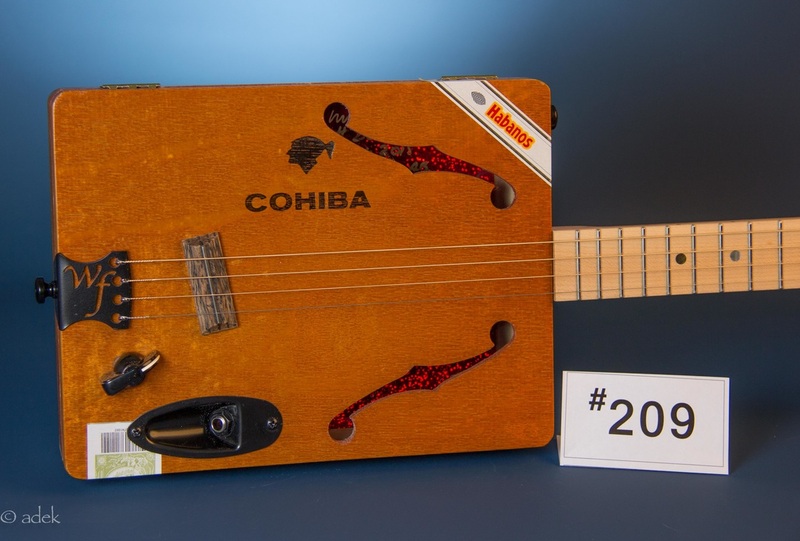 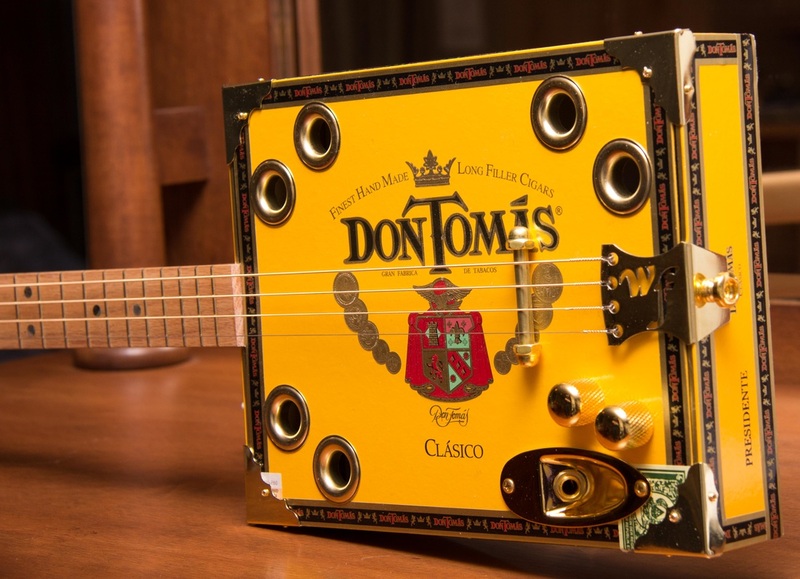 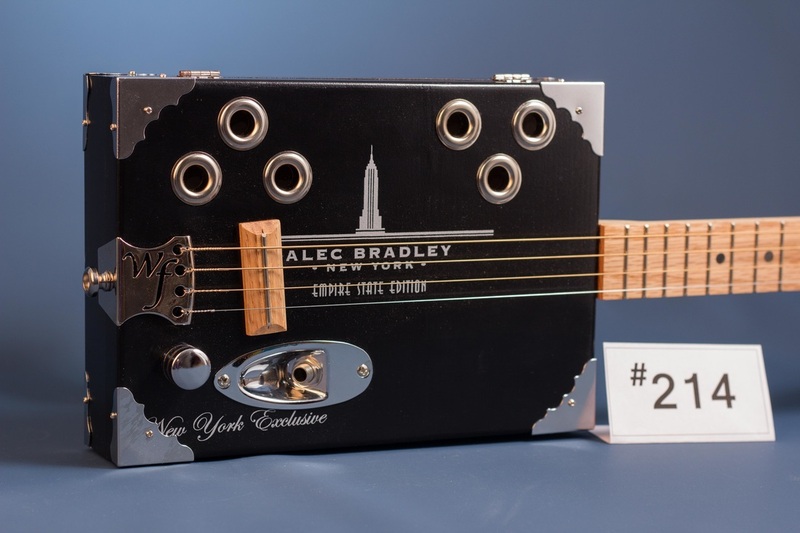 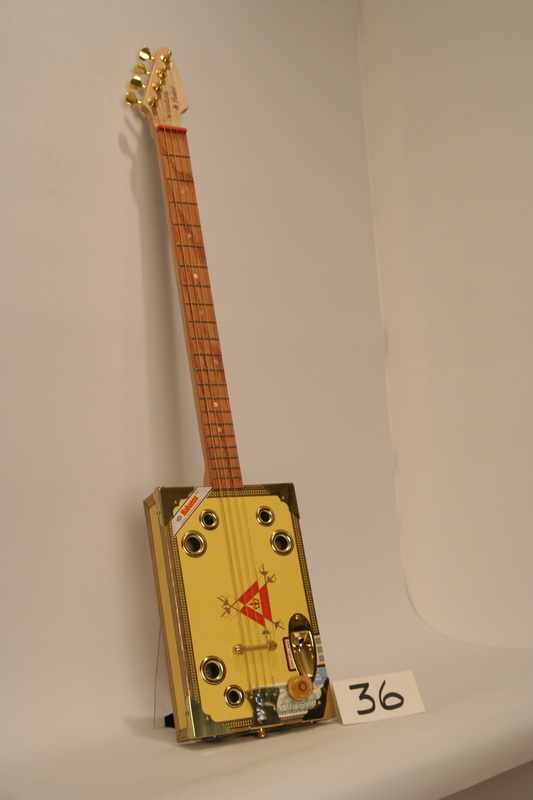 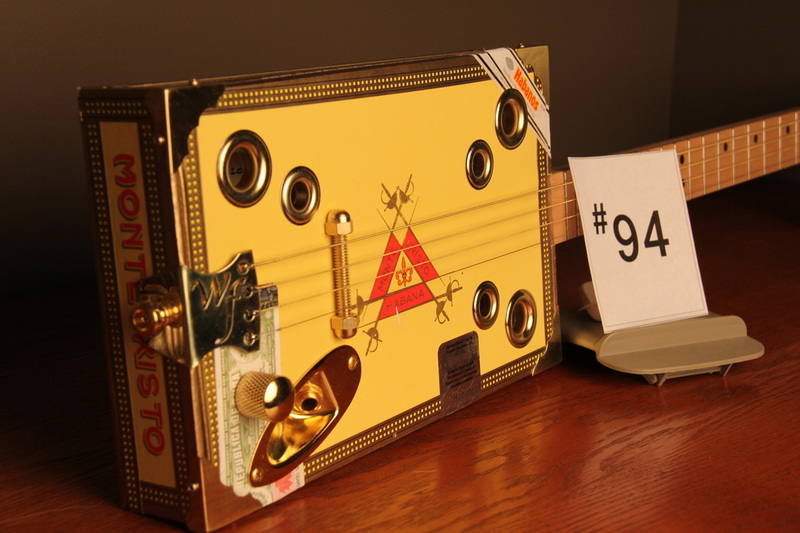 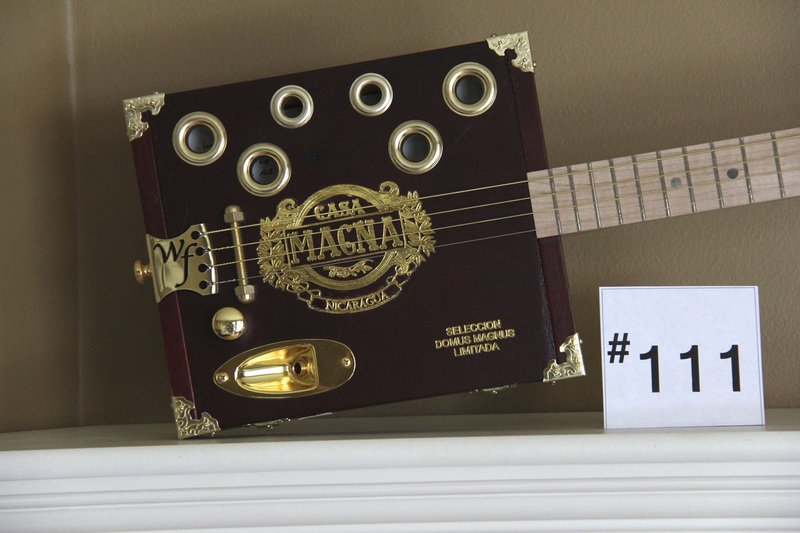 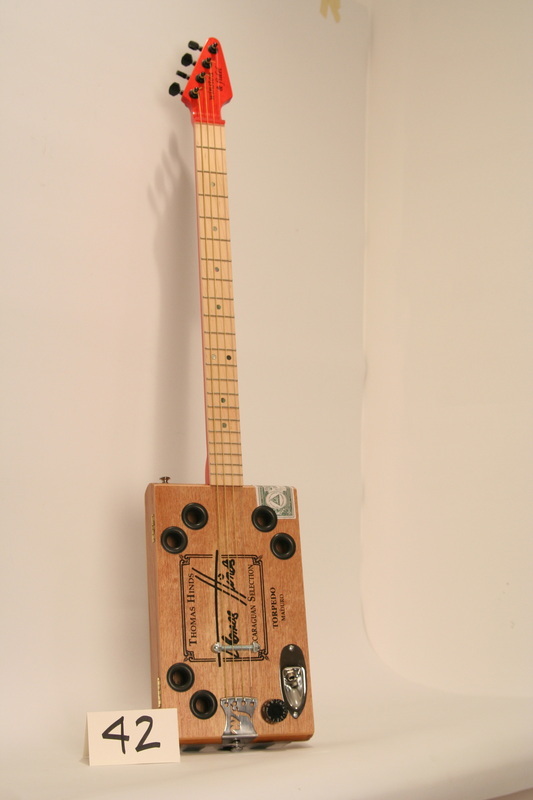 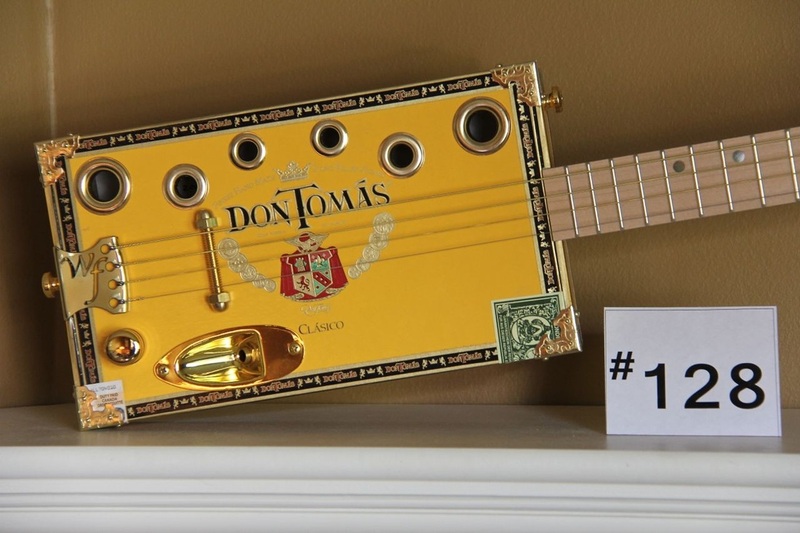 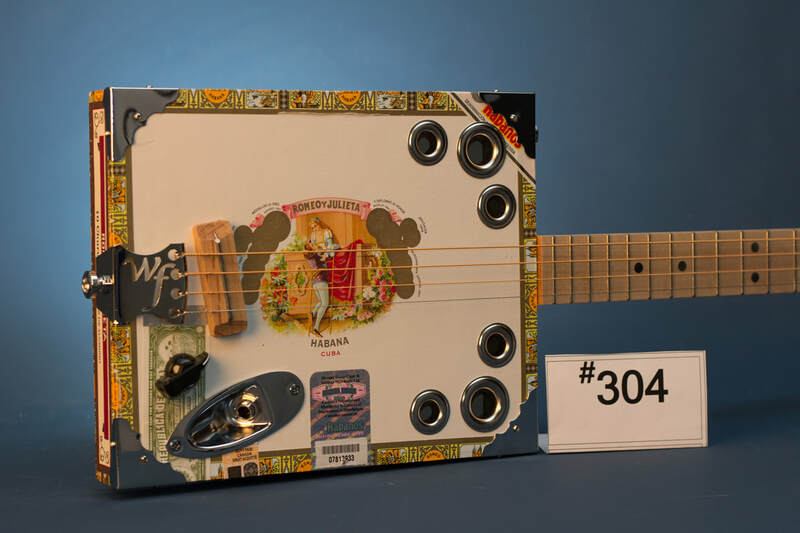 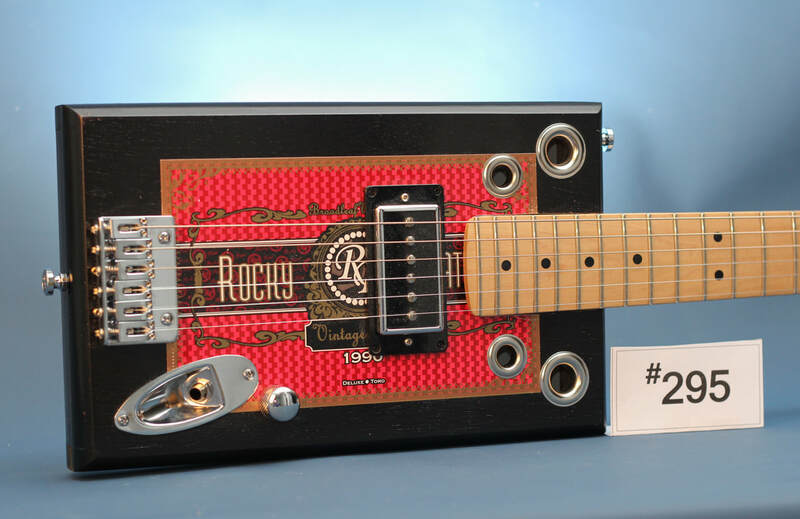 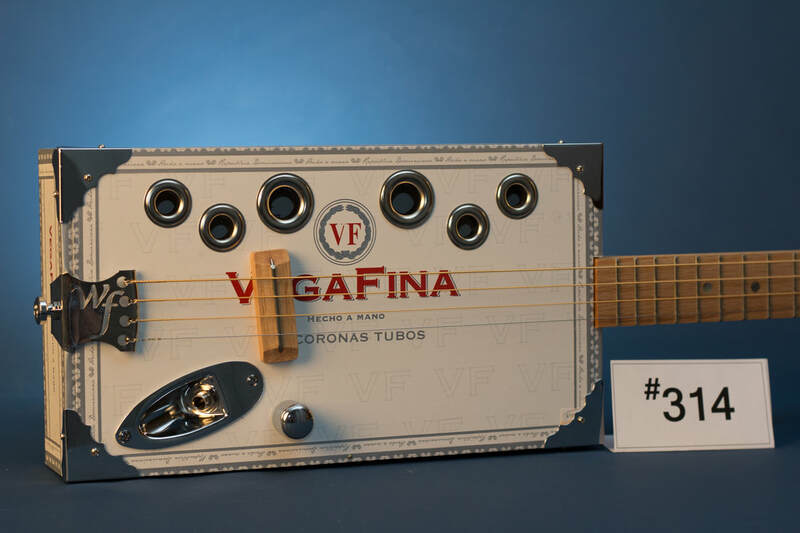 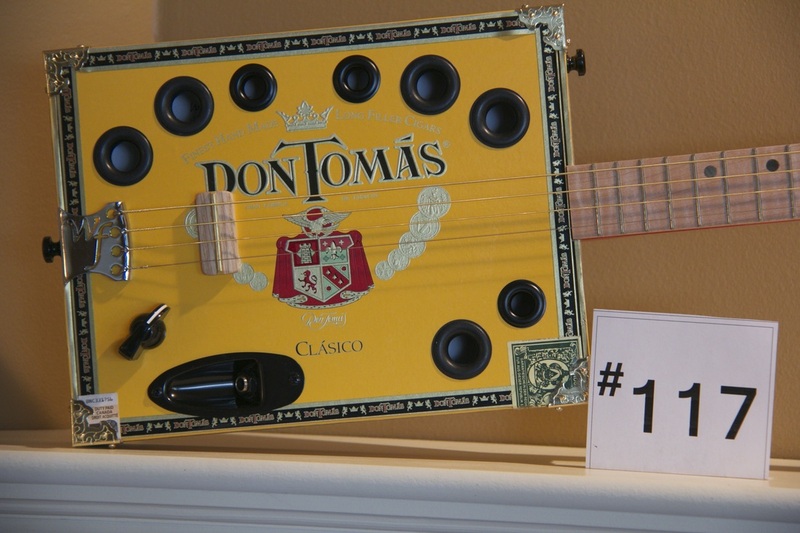 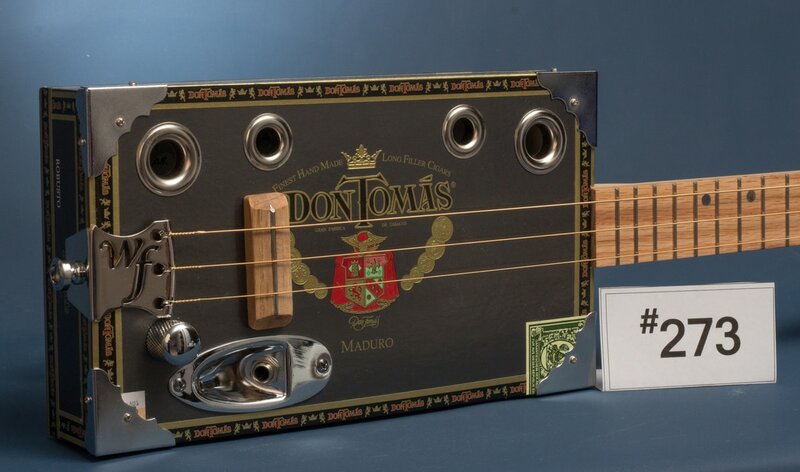 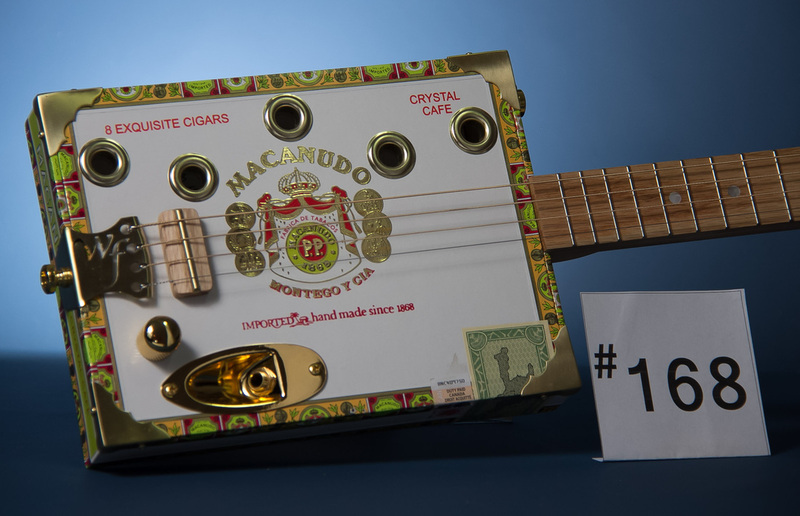 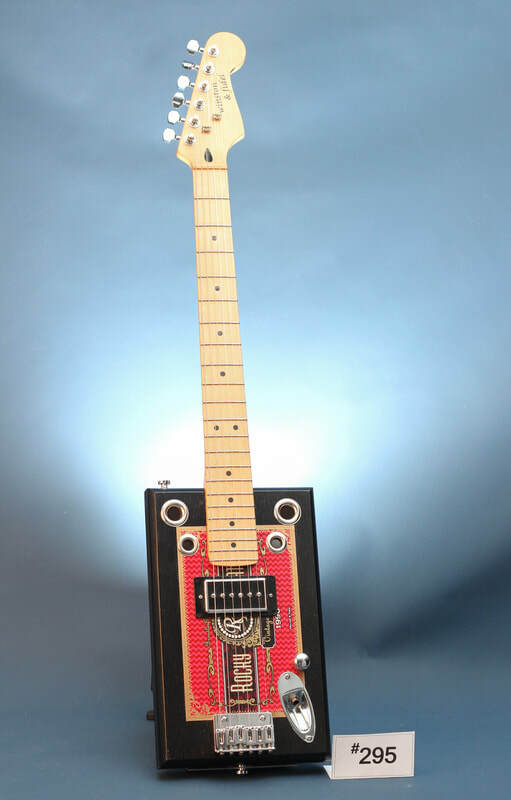 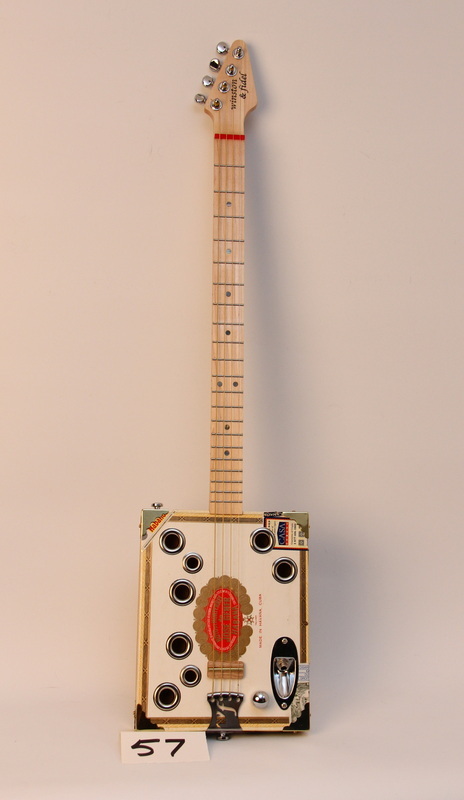 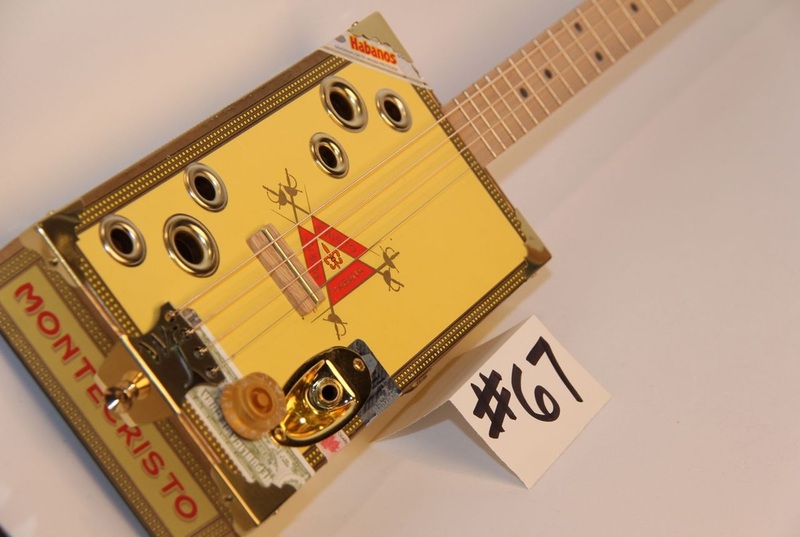 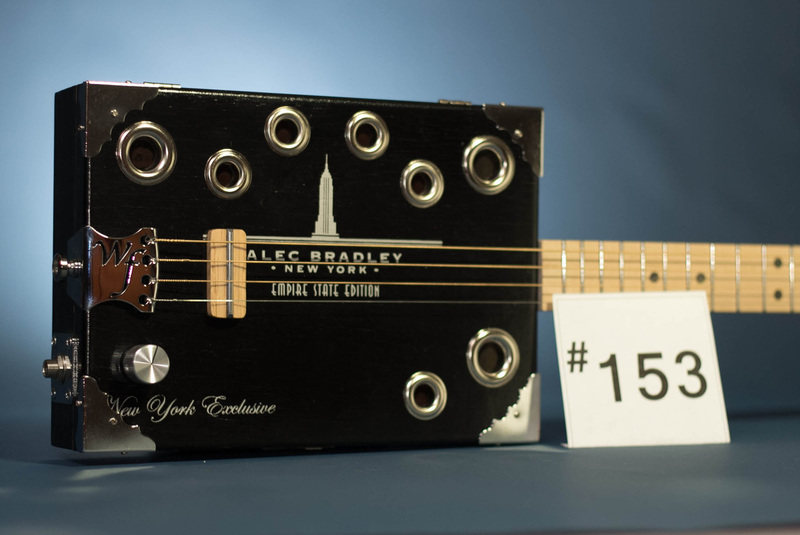 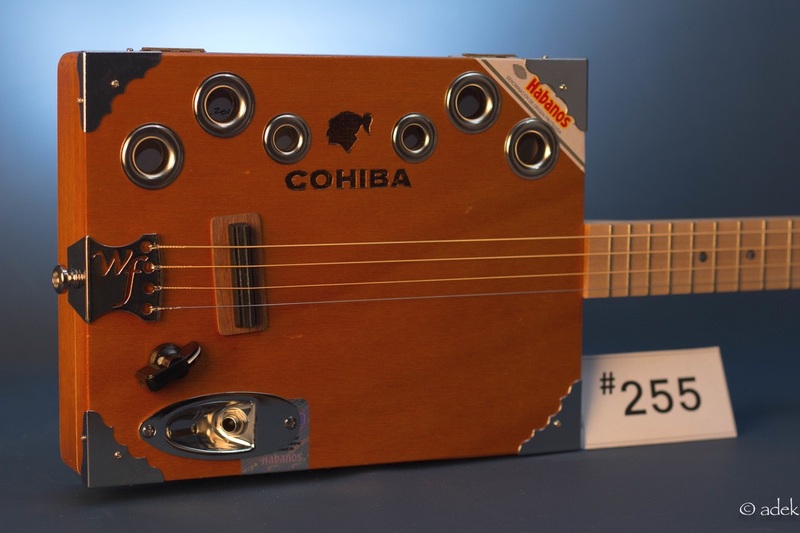 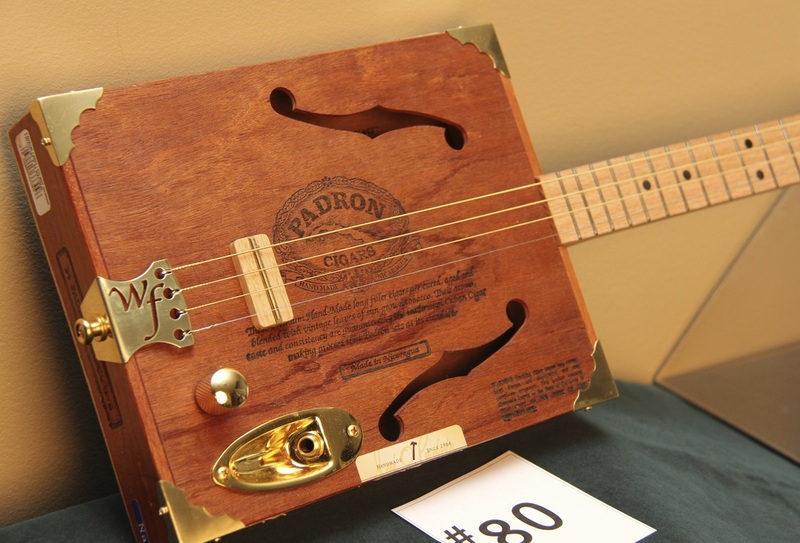 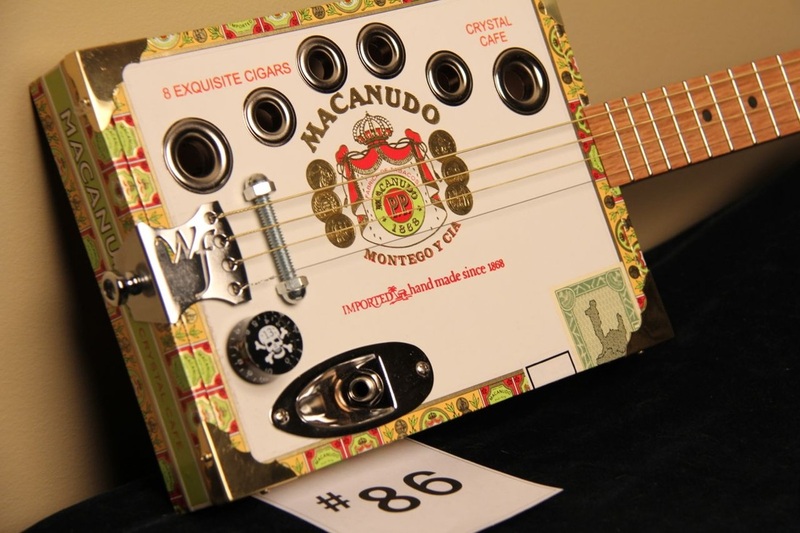 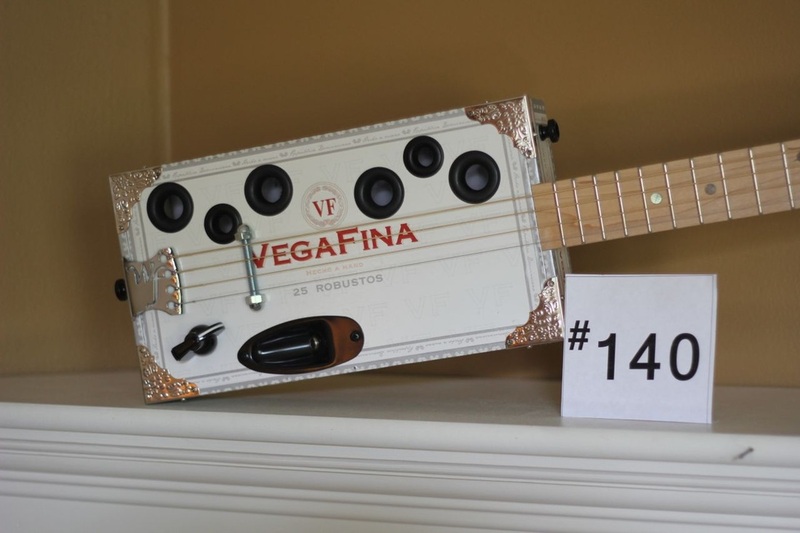 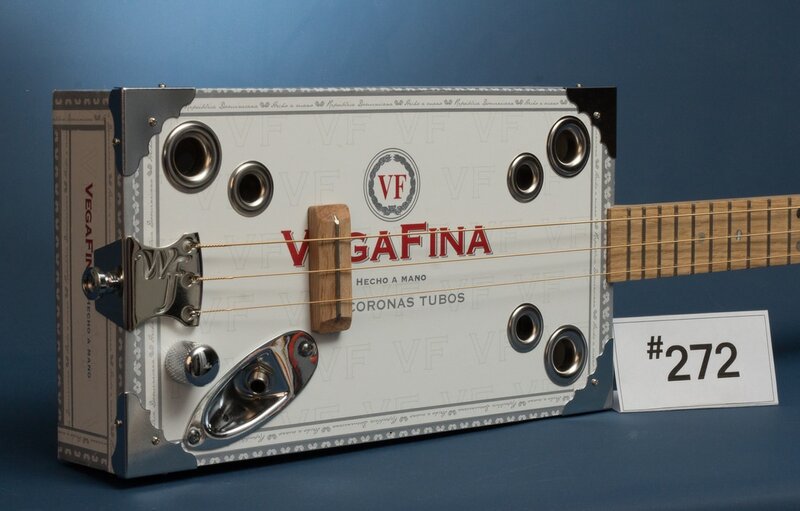 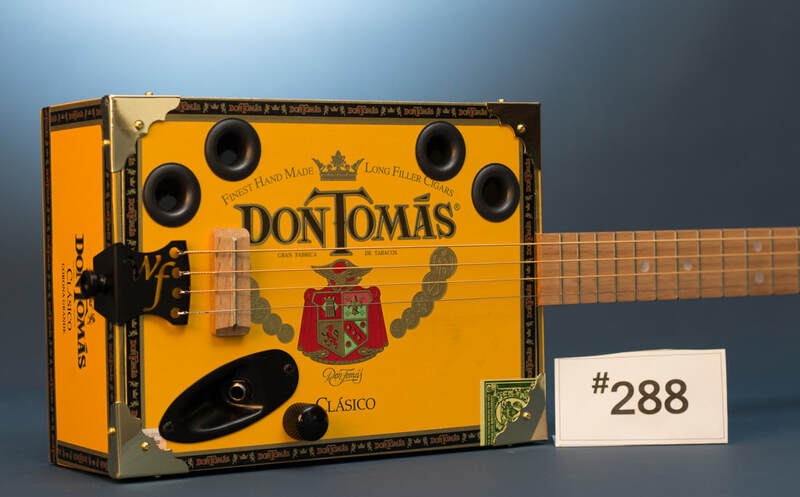 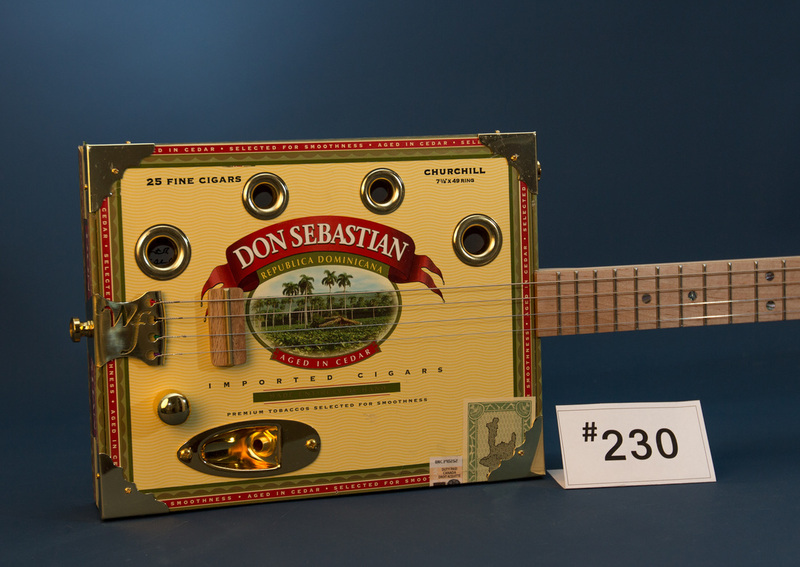 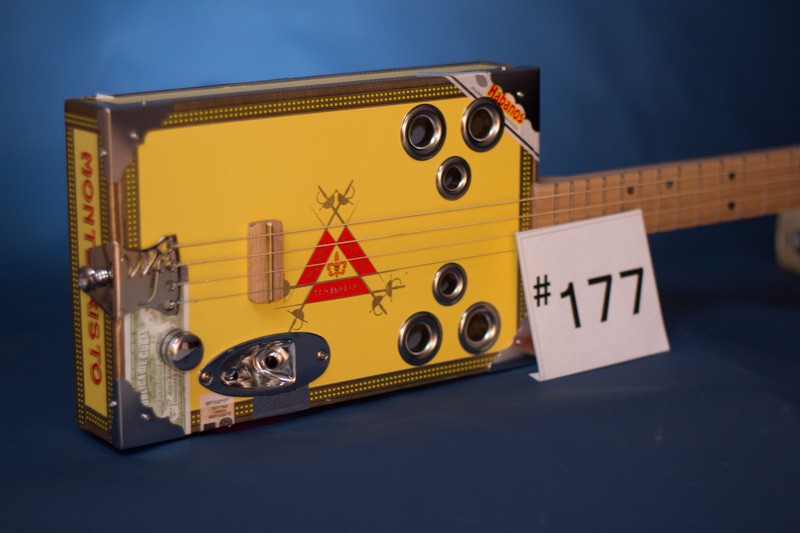 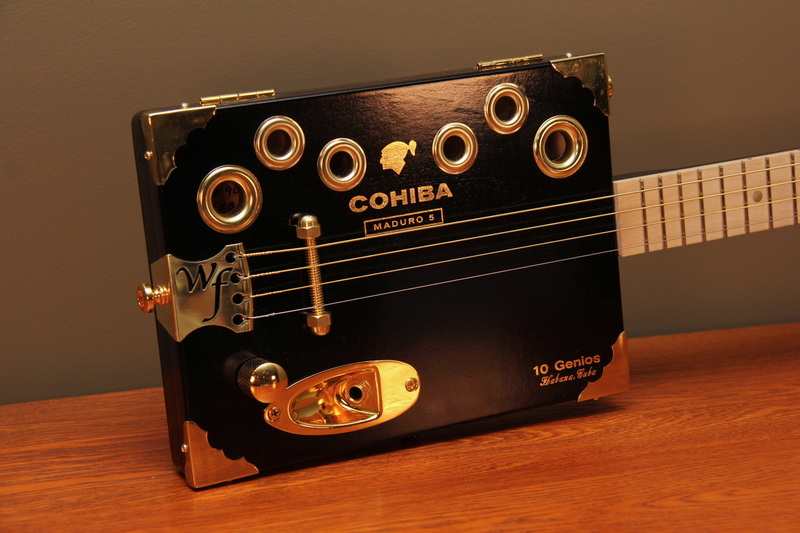 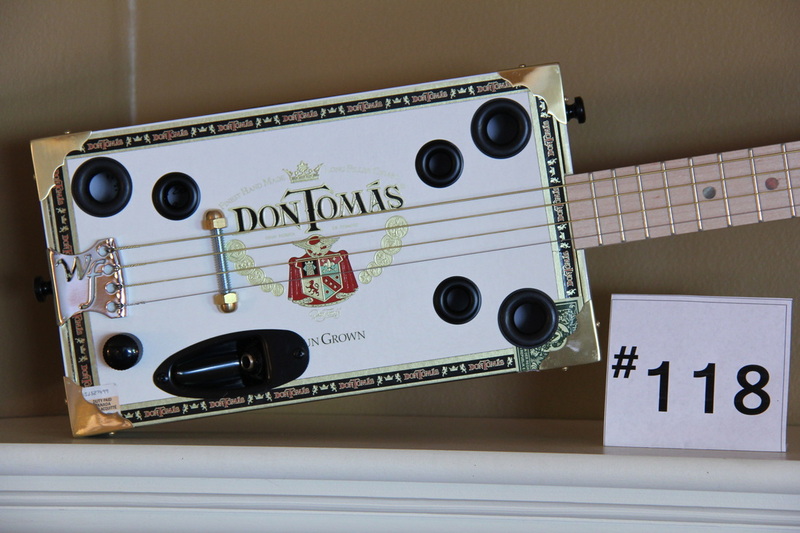 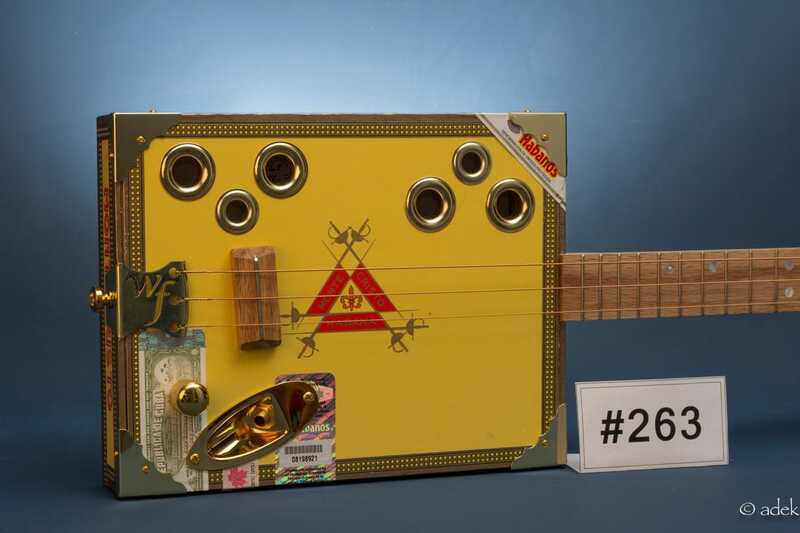 It's a cigar-box sized Telecaster style guitar. 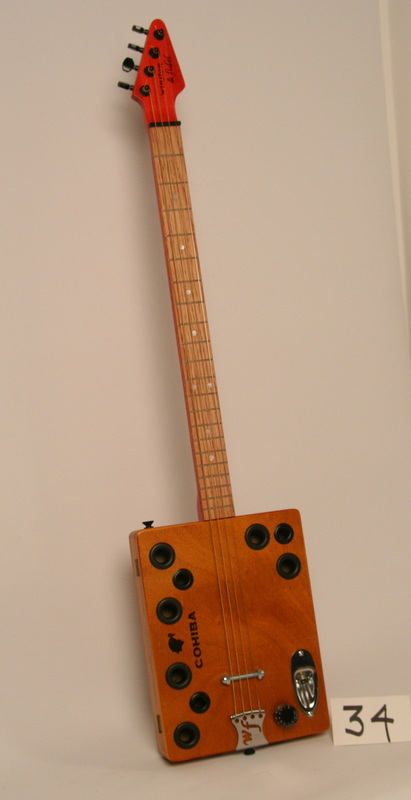 Three string lefty incorporating a mini Humbucker and 3 string floating bridge. 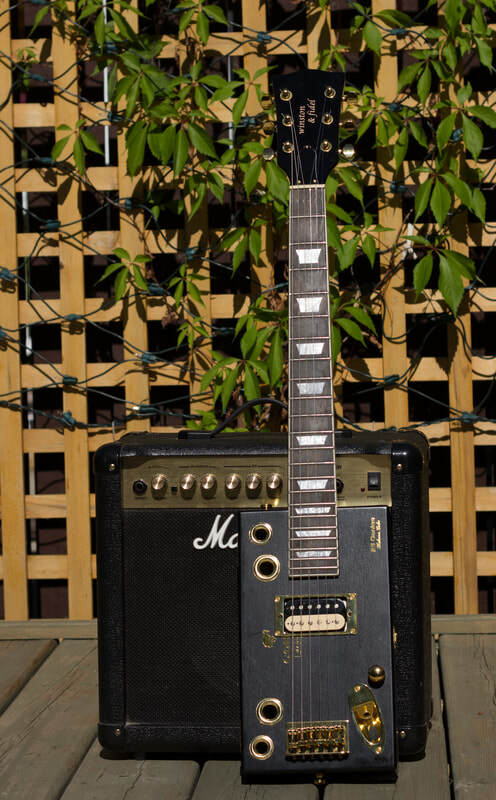 Custom build for American blues musician Matthew Ritchie, who plays under the name " Matthew J". 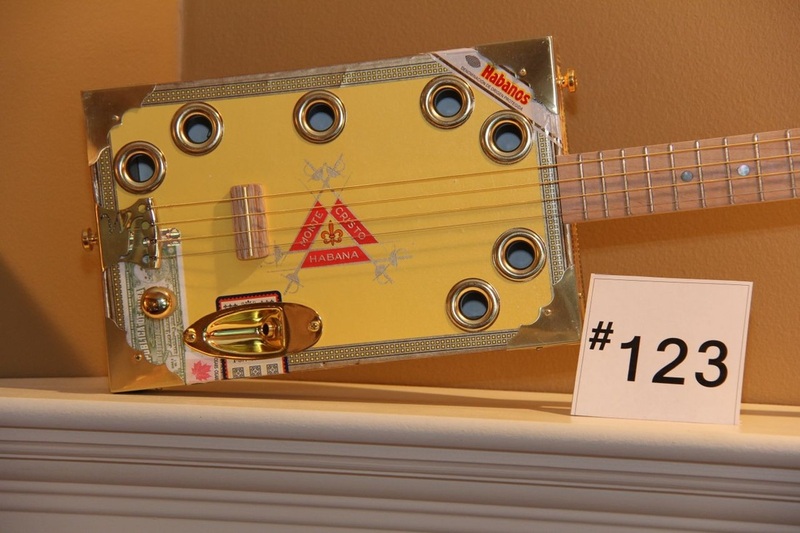 This is the third Winston and Fidel guitar for Matthew. 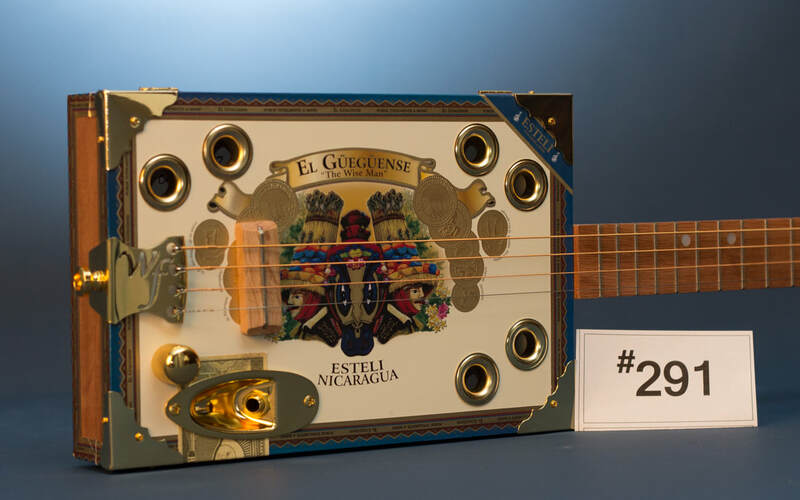 El Güegüense, "The Wise Man"
The third guitar in the MJ Series, all of which feature 5 strings. This guitar was a custom build for a buyer who wanted a fifth string positioned partway down the neck, as in a banjo, so he could use the string as a drone. 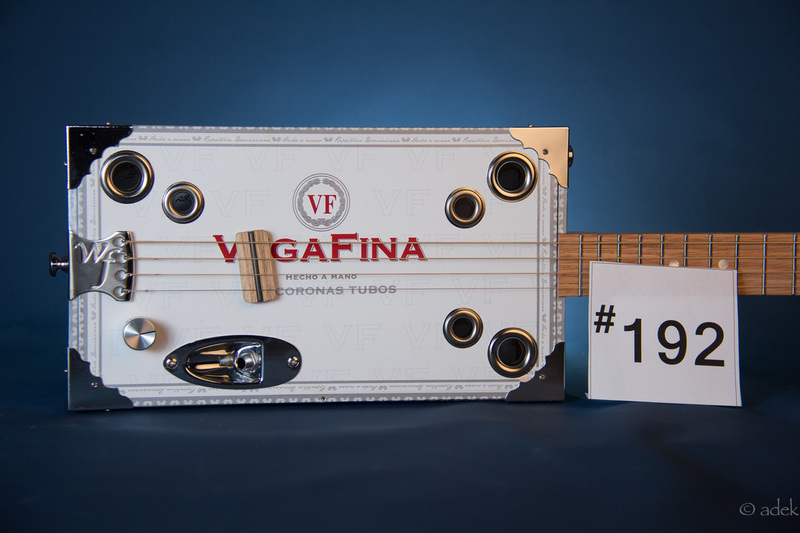 #199 - It's all about that bass! 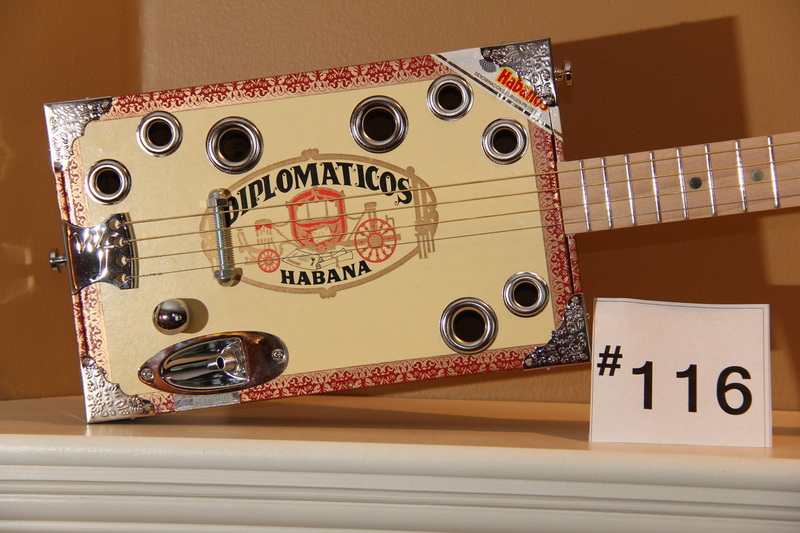 A clean, crisp box, this H. Upmann features black mother of pearl markers on a maple fret board. 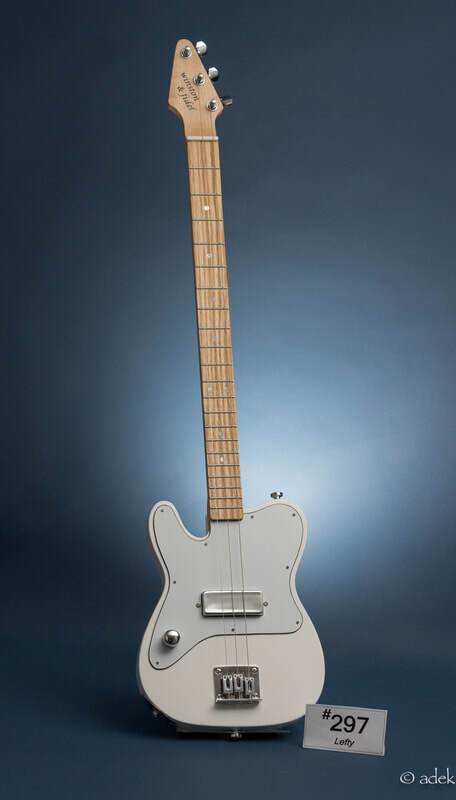 Chrome tail stock, with black tuners, jack plate and accents. 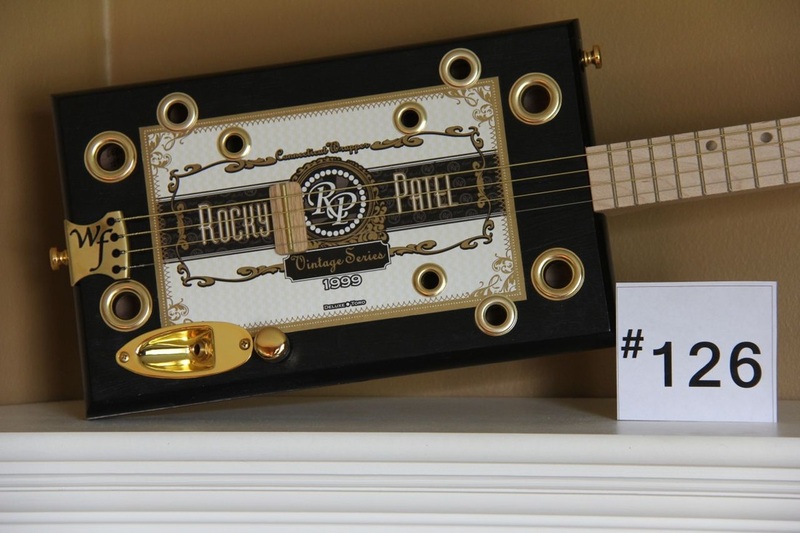 #174 - Rocky Patel wide presentation box. 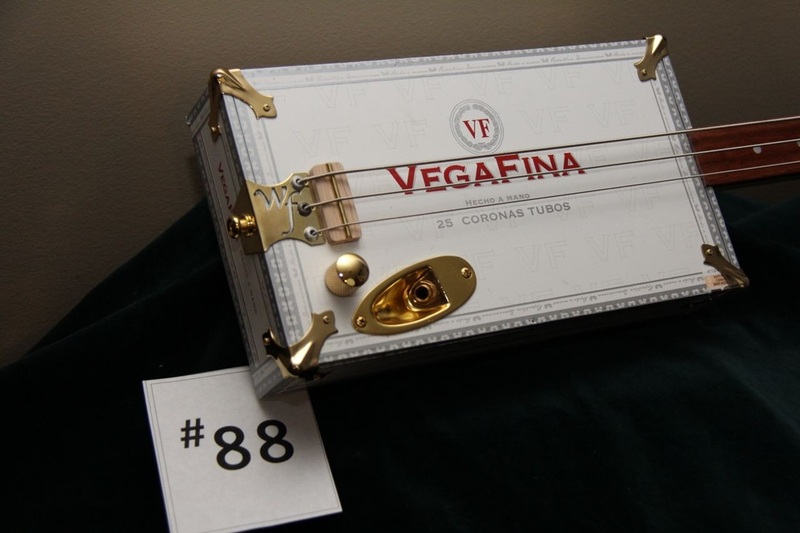 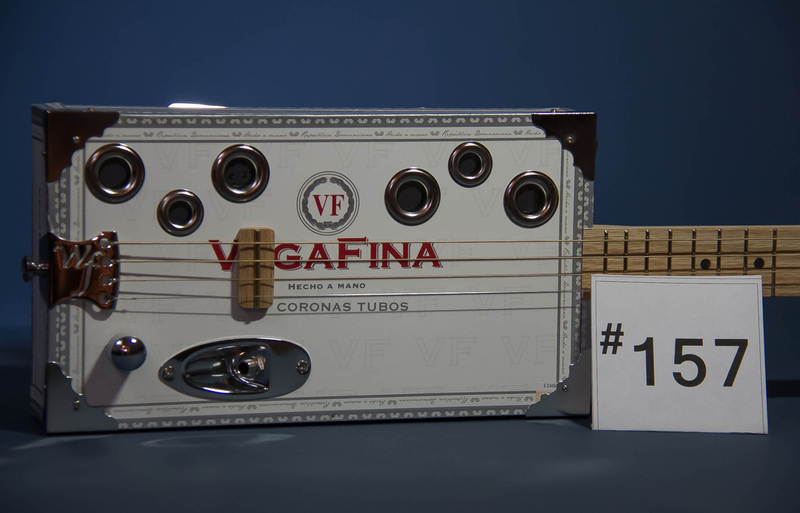 #181 - Cohiba "Little Black Dress"
This is a VegaFina box with no sound holes. 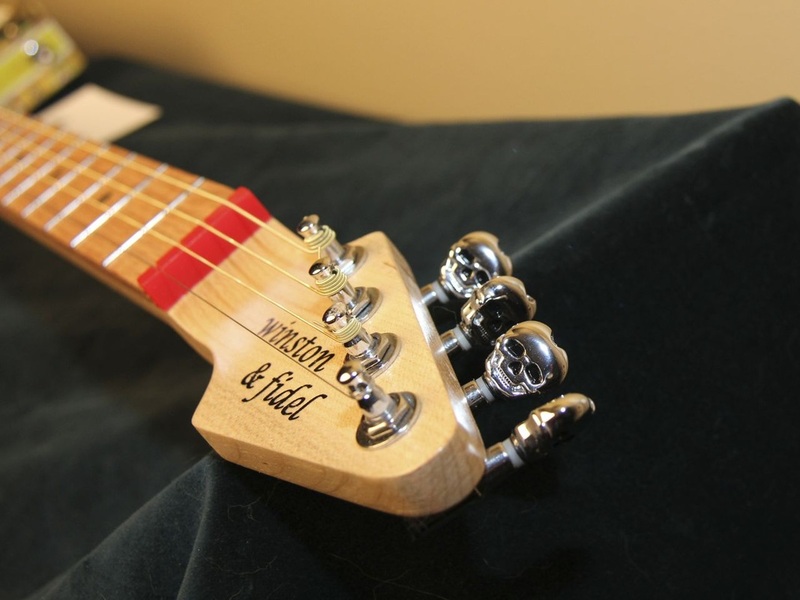 The nut to bridge distance is 30 inches. 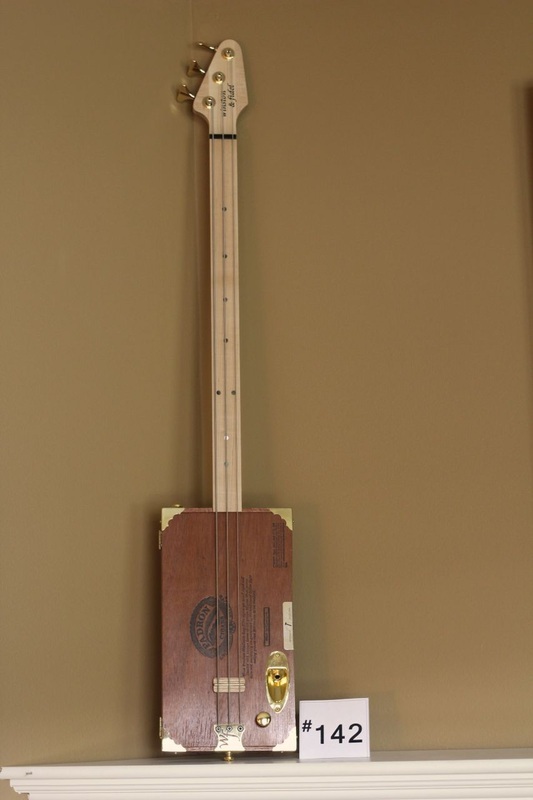 It's fretless with mother of pearl markers, based on 20 frets. 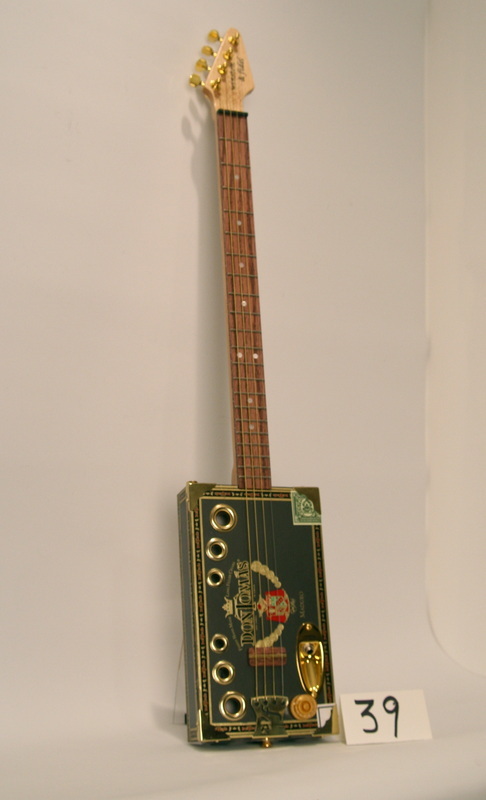 I used the A, D and G strings, and it's tuned as a regular bass. 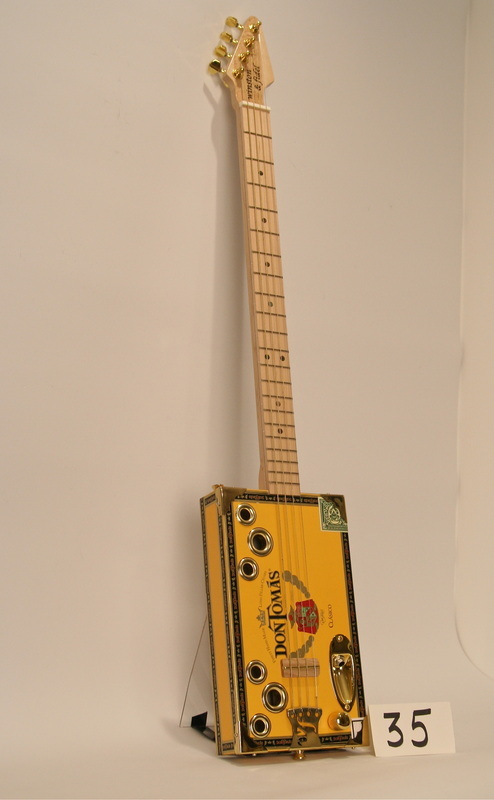 For you bass players, here's my second cigar box bass guitar! 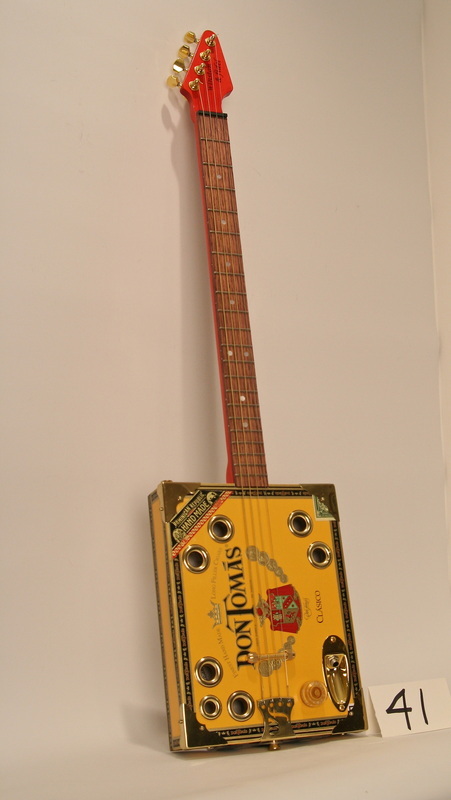 My neighbour Bob the Bass Player, really likes them! 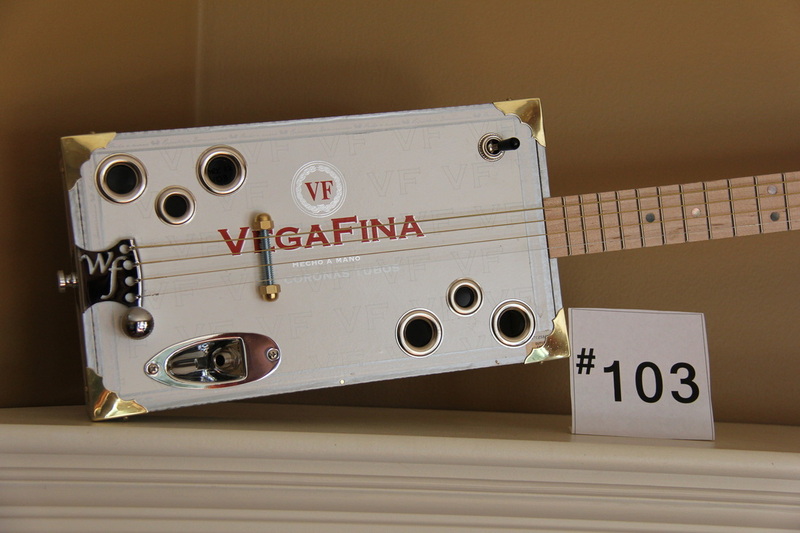 A milestone guitar, my 100th build! 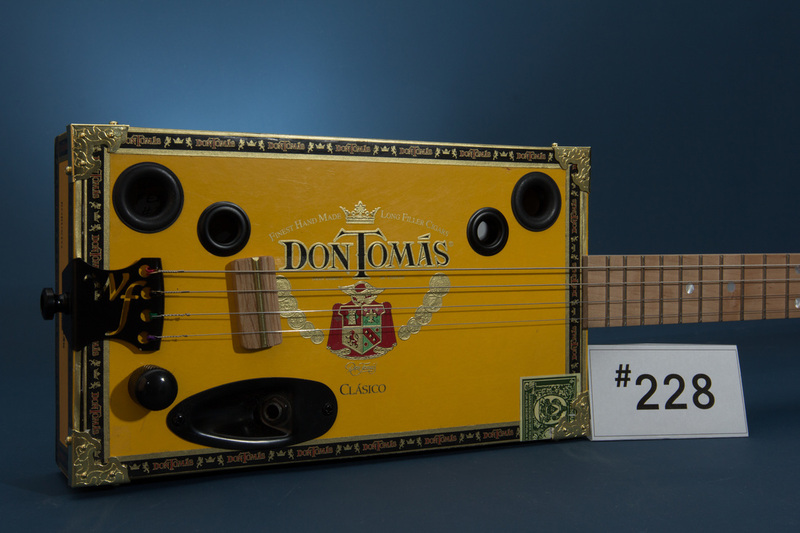 A very striking Diplomaticos Habana yellow wide-body box with a richly coloured border. 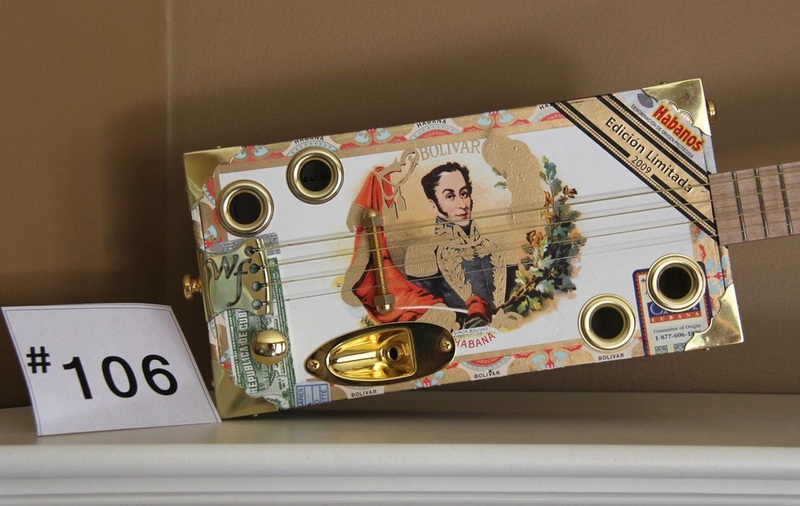 Romeo y Julieta narrow box, featuring an image of the iconic balcony scene. 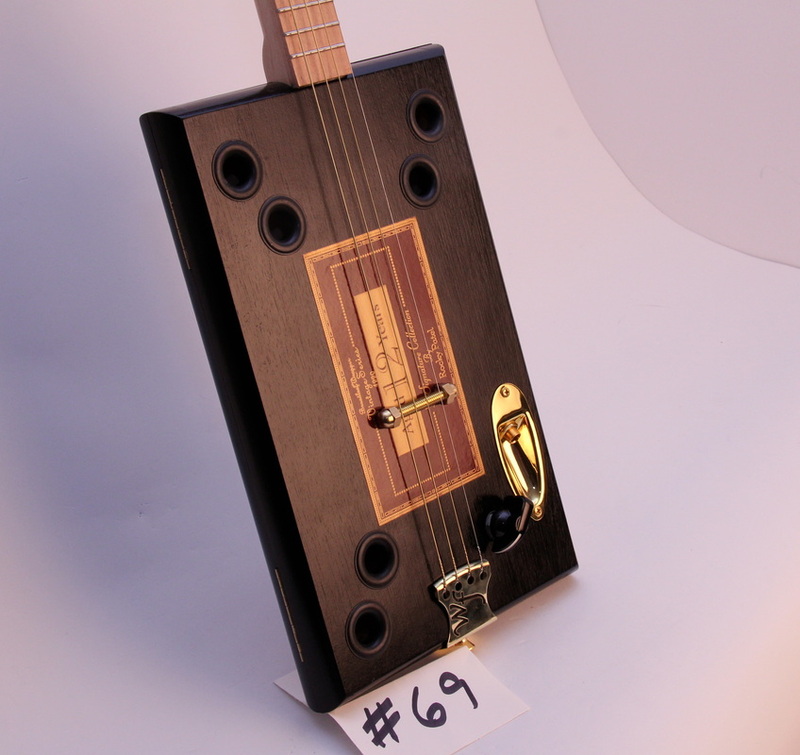 The neck is slightly offset from the centre, just for something a little bit different. 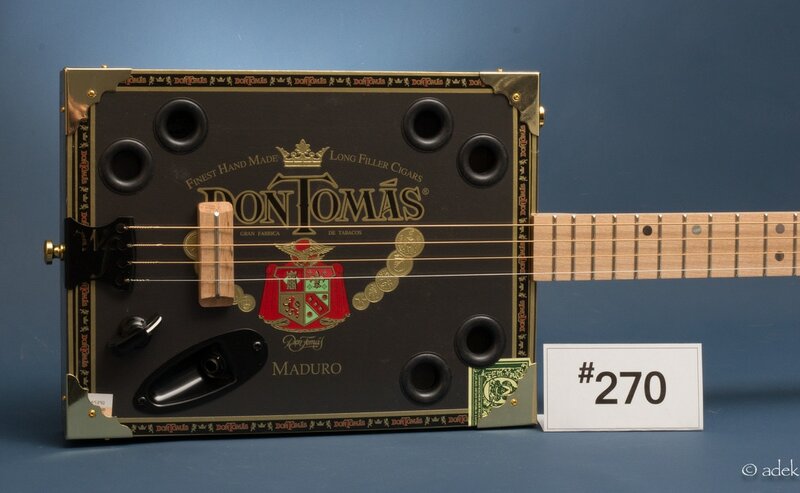 This custom black Cohiba Maduro, nicknamed "The Little Black Dress", is a small box with a mighty voice! 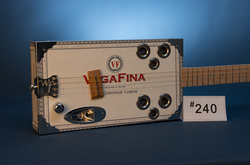 Incredible sound and sustain, "Nigel". 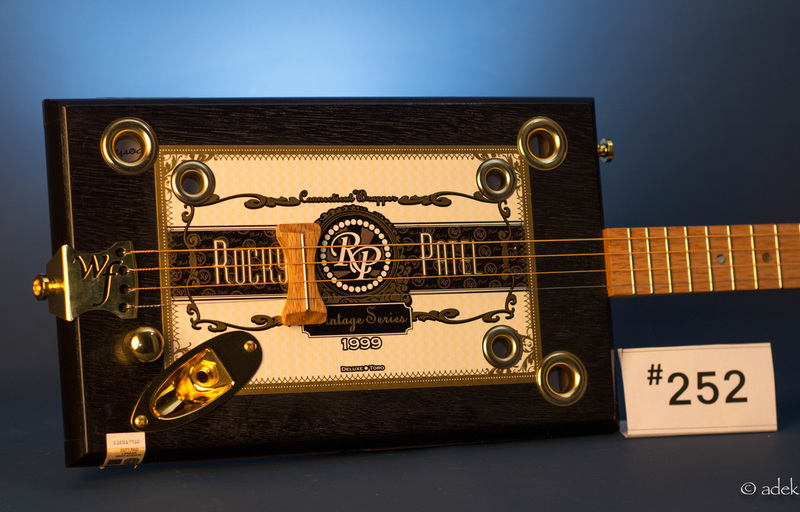 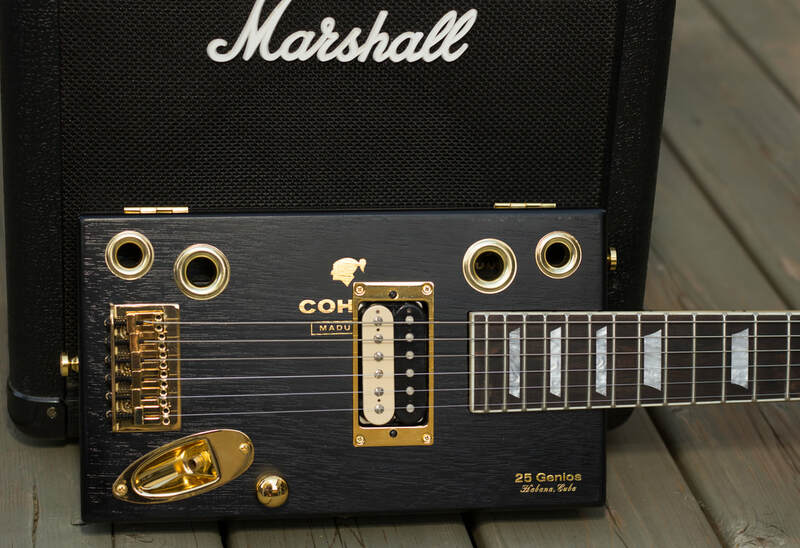 Features a maple fretboard with 22 frets, black mother of pearl fret markers, brass accents and gold-plated jack plate. 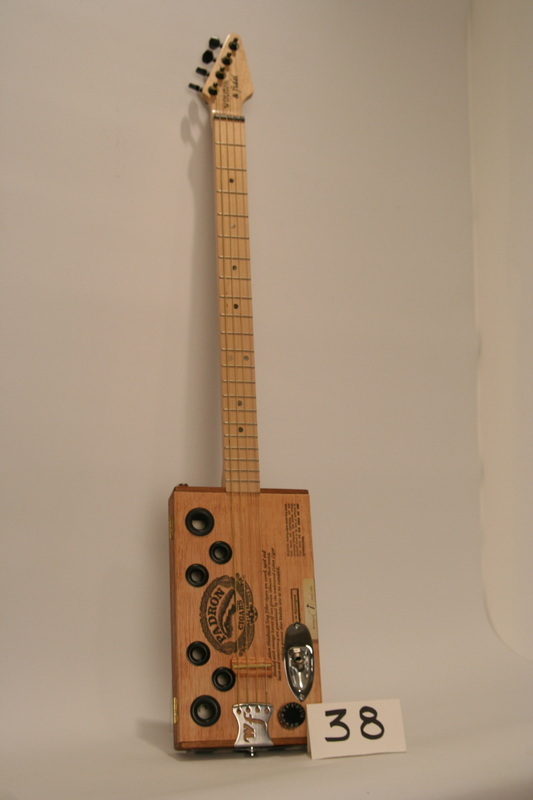 with black tuners and jack plate. 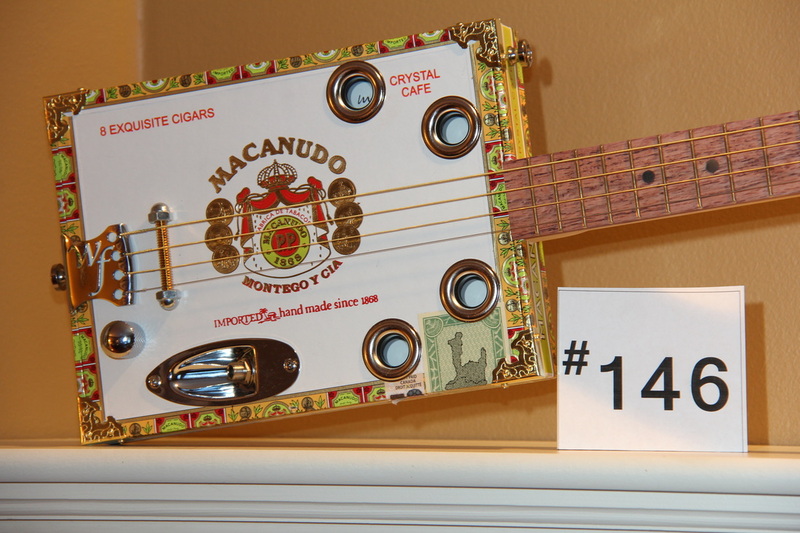 Macanudo wide body with a little bit of fun in the tuners. 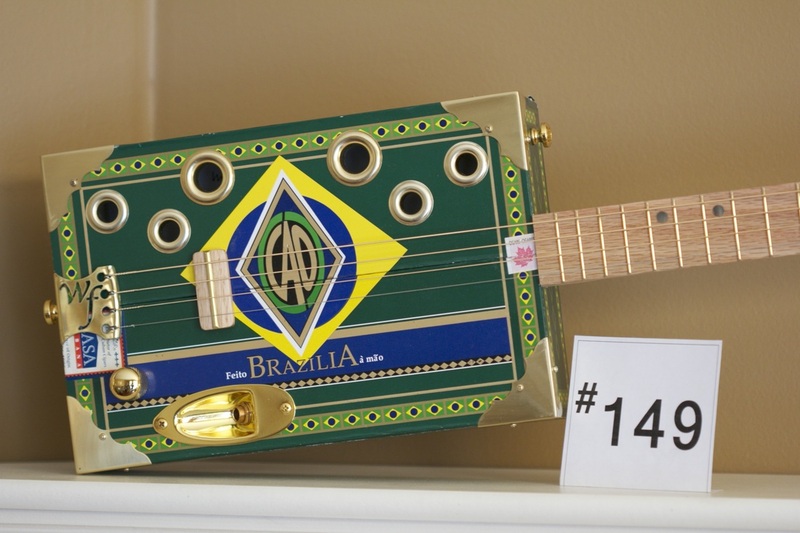 CAO Brazilia box, the first I've had, this is a bold, colourful box. 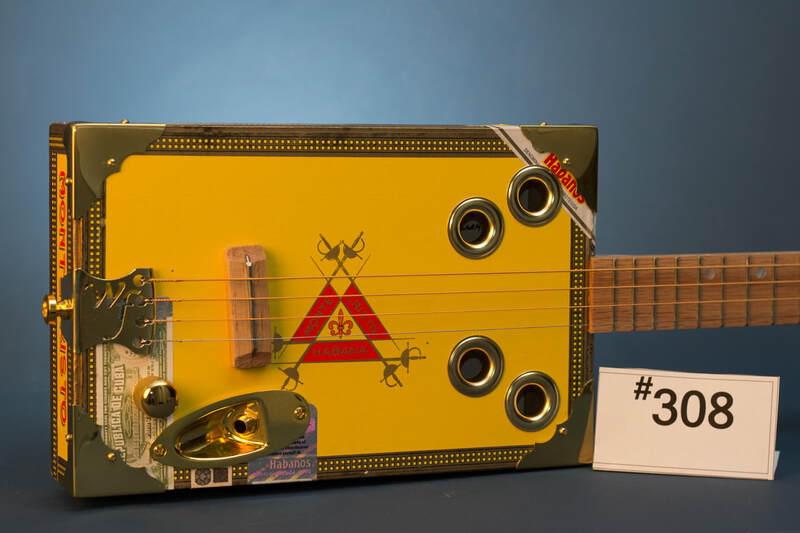 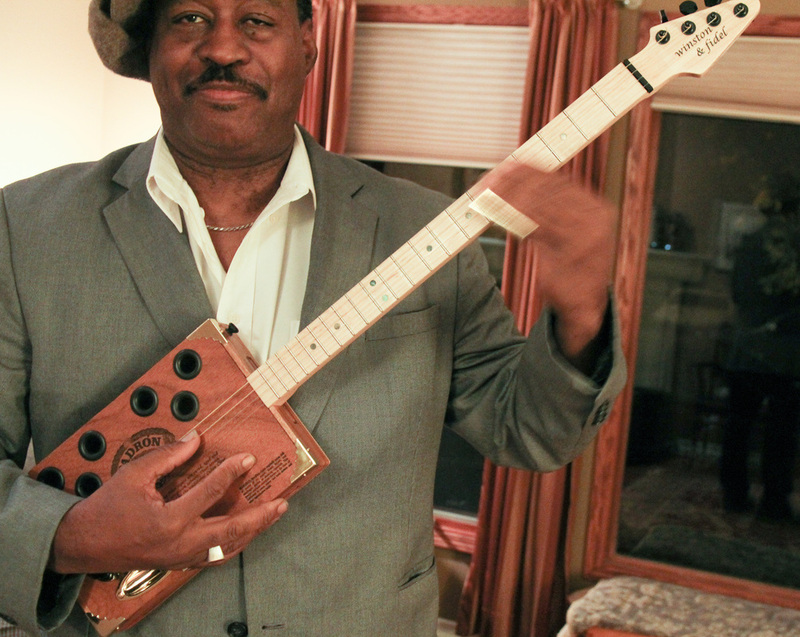 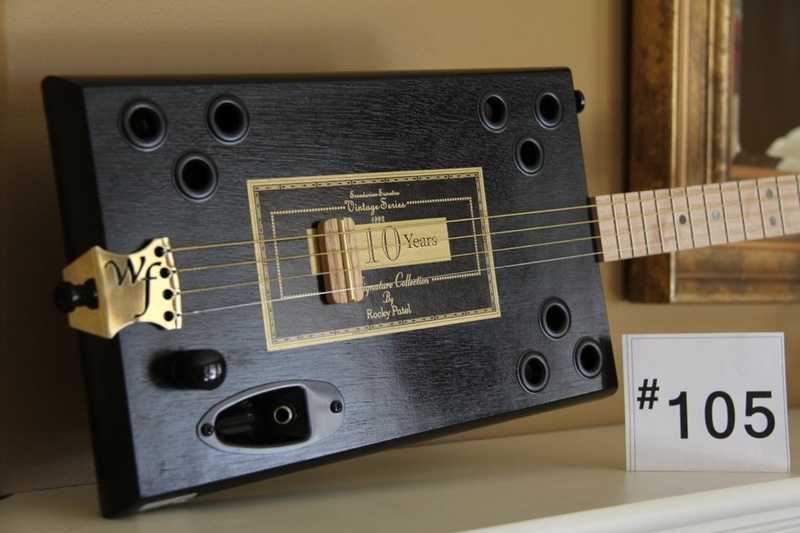 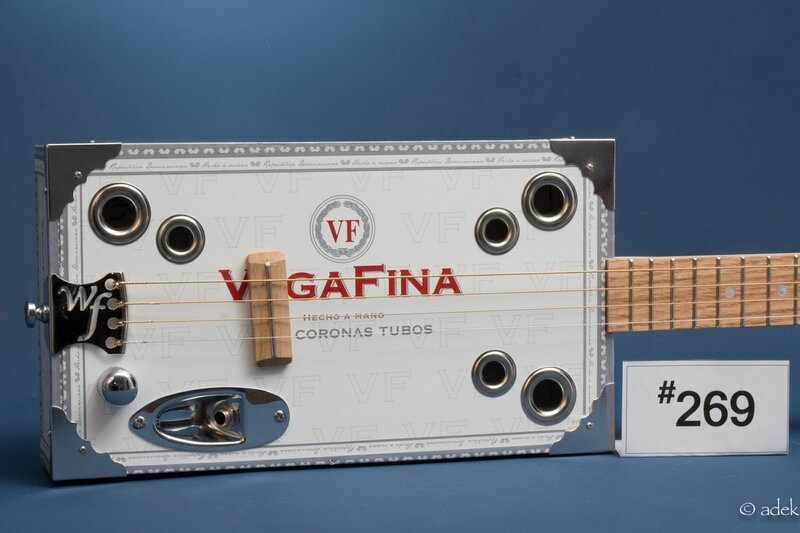 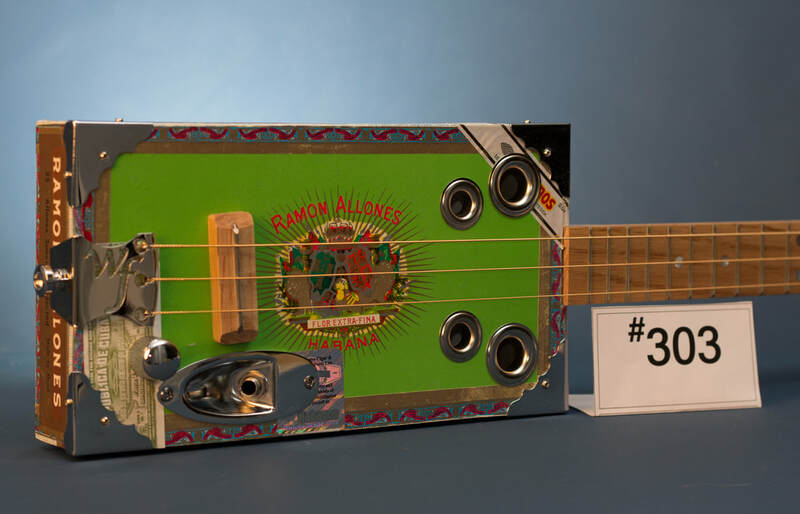 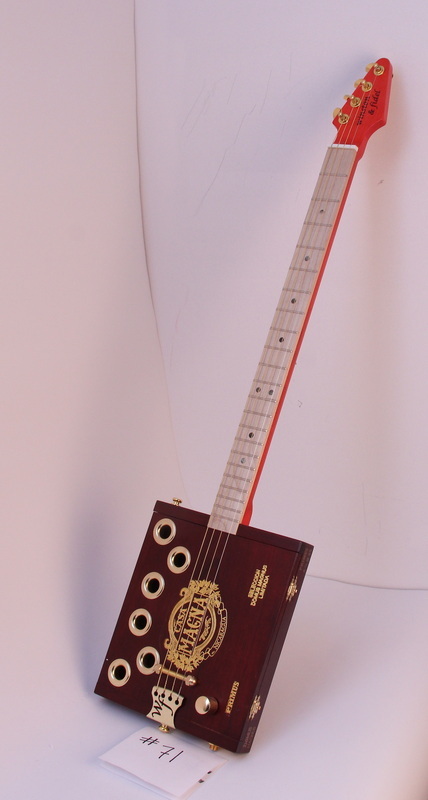 Chicago bluesman Fruteland Jackson has chosen to play this Winston & Fidel cigar box guitar in his award winning "All About the Blues series - Blues in the Schools" program. 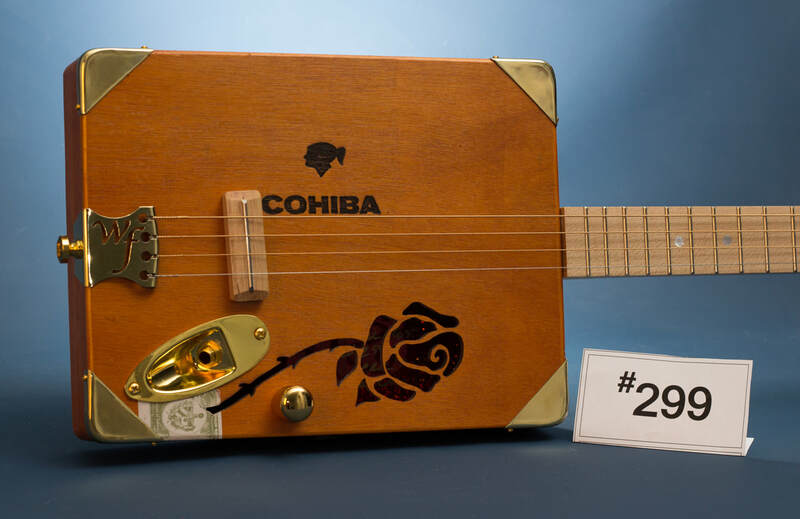 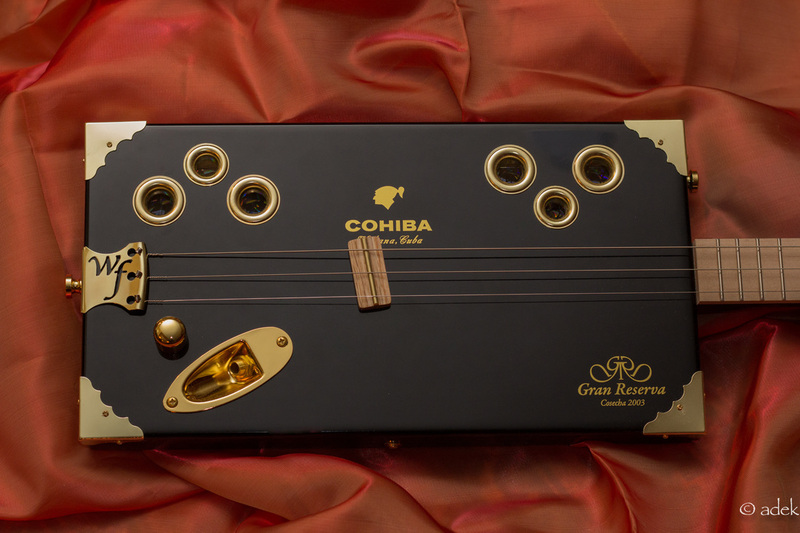 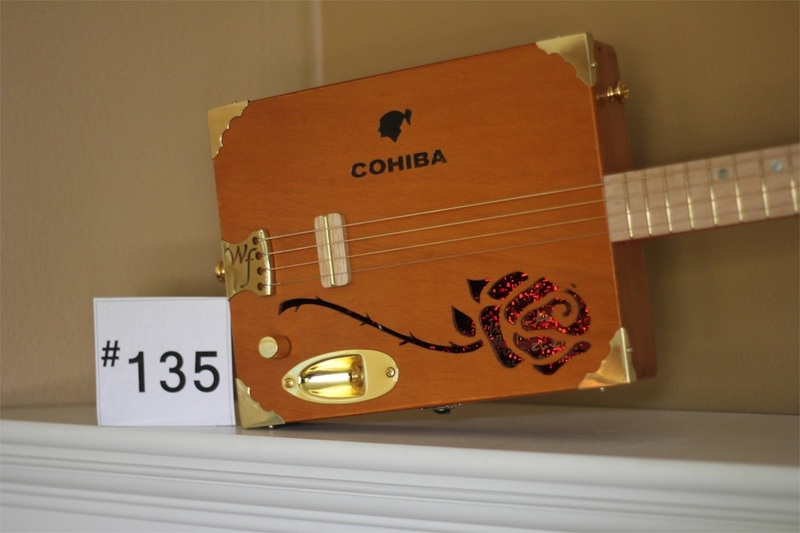 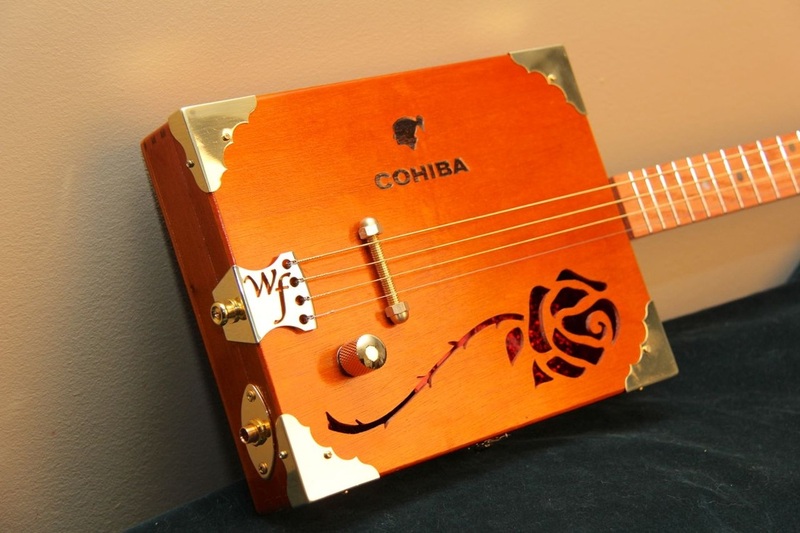 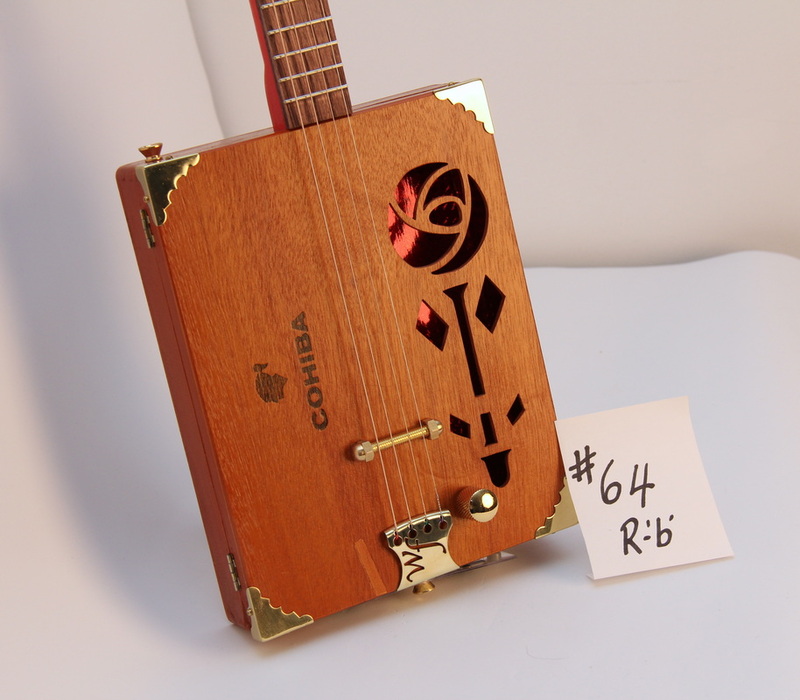 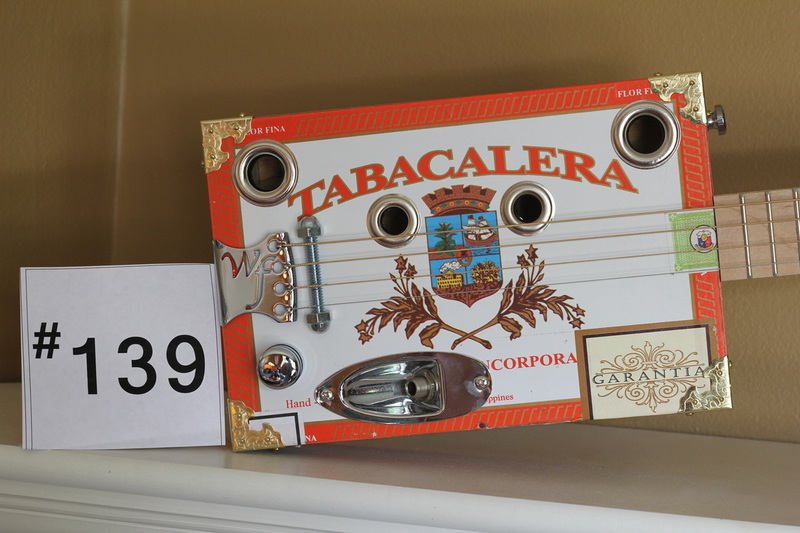 Alberta Red Neck Edition, with rose sound hole cut-out on a Cohiba presentation box. 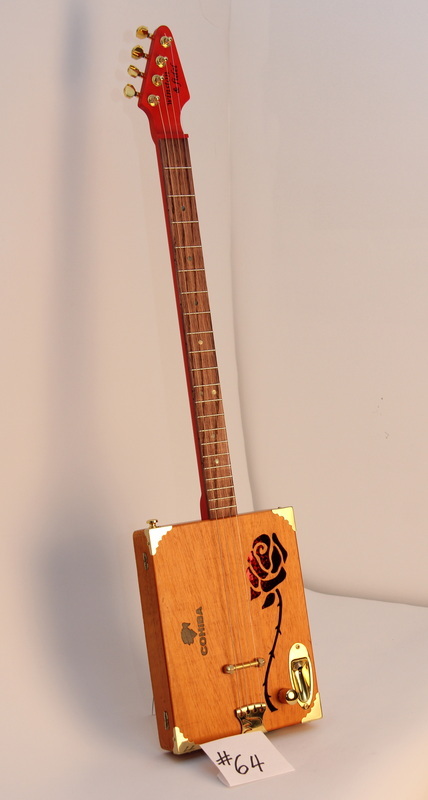 The pattern, supplied by the customer, is based on a rose by Scottish architect Charles Rennie Mackintosh. 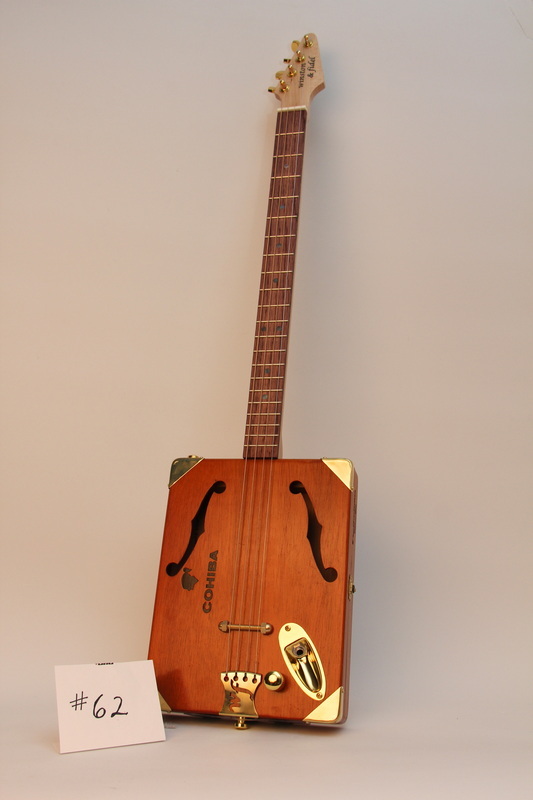 Oak fret board with black mother of pearl markers, gold tuners and brass corners. 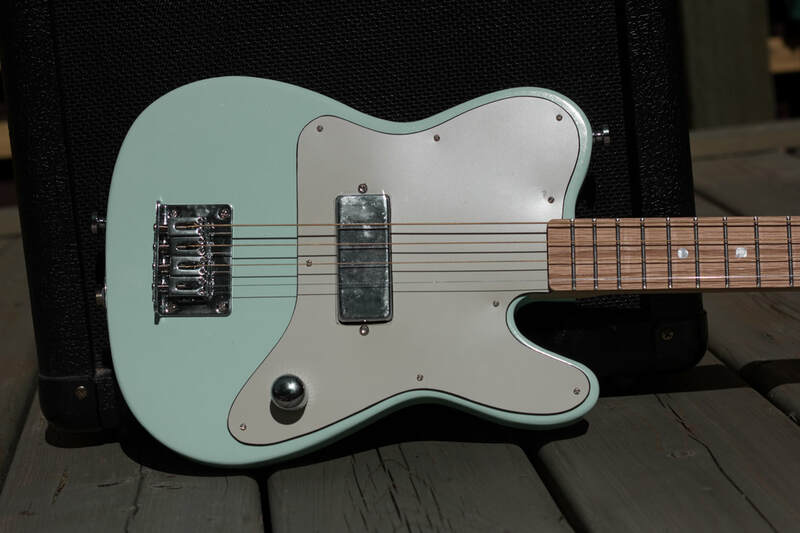 CHECK OUT THE GREEN NUT!